Introduction • • • For communication. The most demanding, and the centre of the four skills. 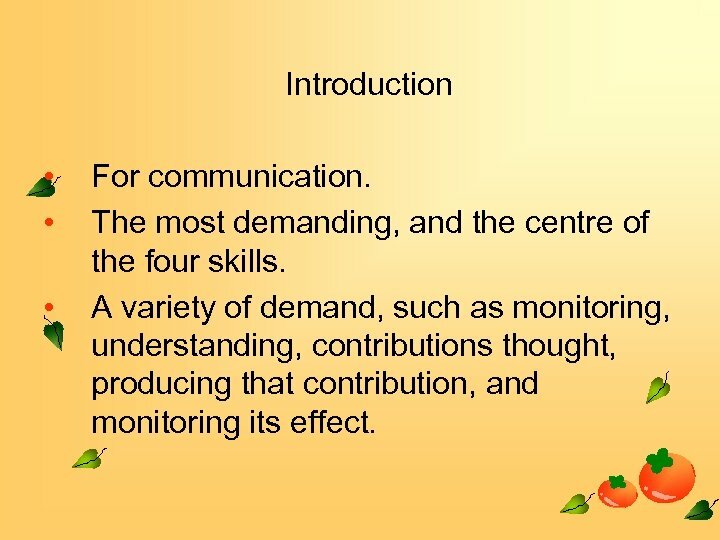 A variety of demand, such as monitoring, understanding, contributions thought, producing that contribution, and monitoring its effect. 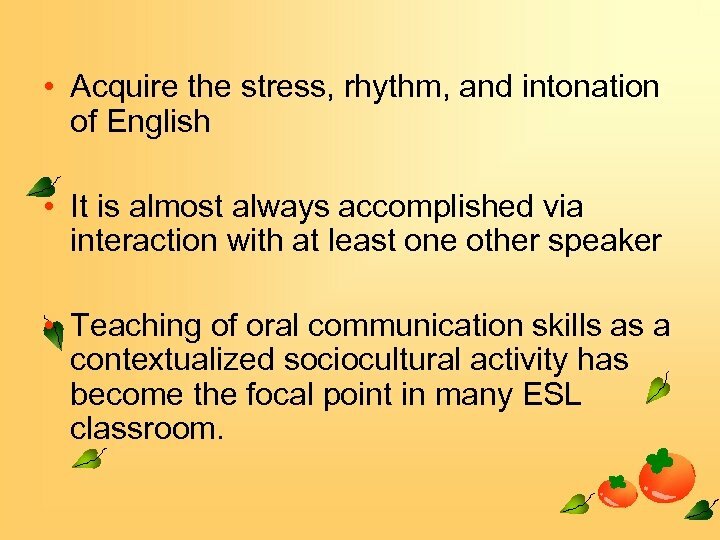 • Acquire the stress, rhythm, and intonation of English • It is almost always accomplished via interaction with at least one other speaker • Teaching of oral communication skills as a contextualized sociocultural activity has become the focal point in many ESL classroom. 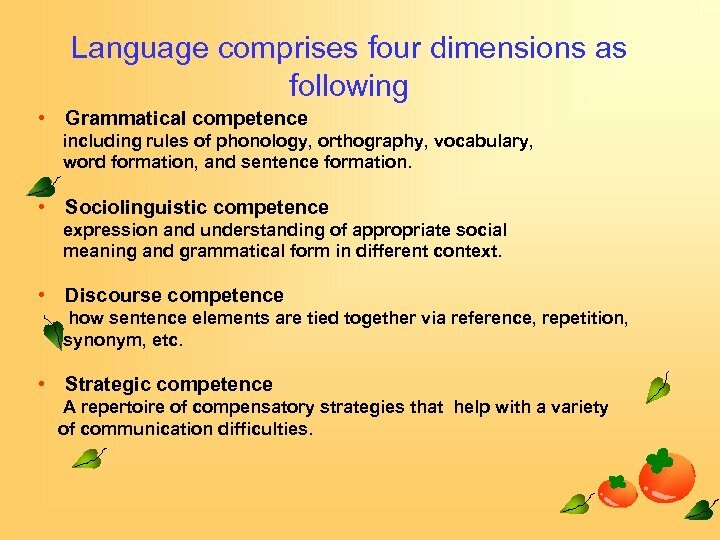 Language comprises four dimensions as following • Grammatical competence including rules of phonology, orthography, vocabulary, word formation, and sentence formation. 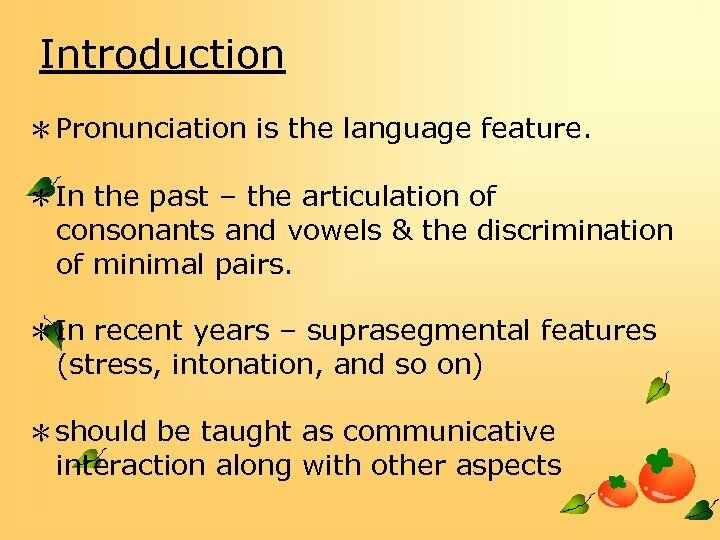 • Sociolinguistic competence expression and understanding of appropriate social meaning and grammatical form in different context. 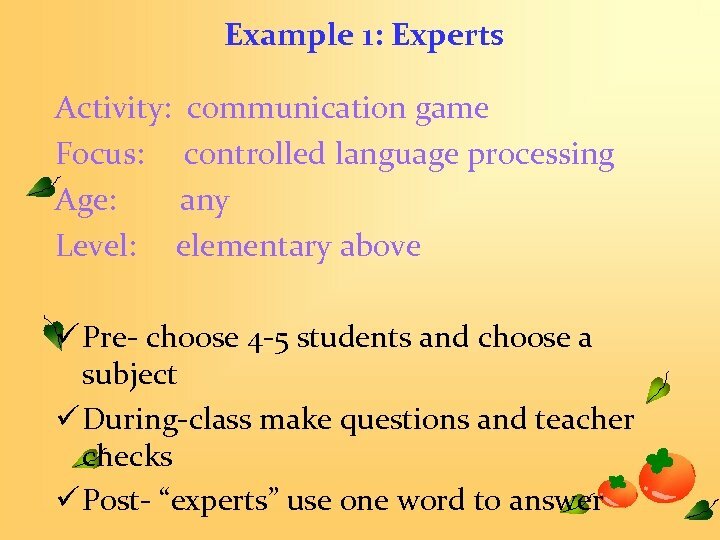 • Discourse competence how sentence elements are tied together via reference, repetition, synonym, etc. 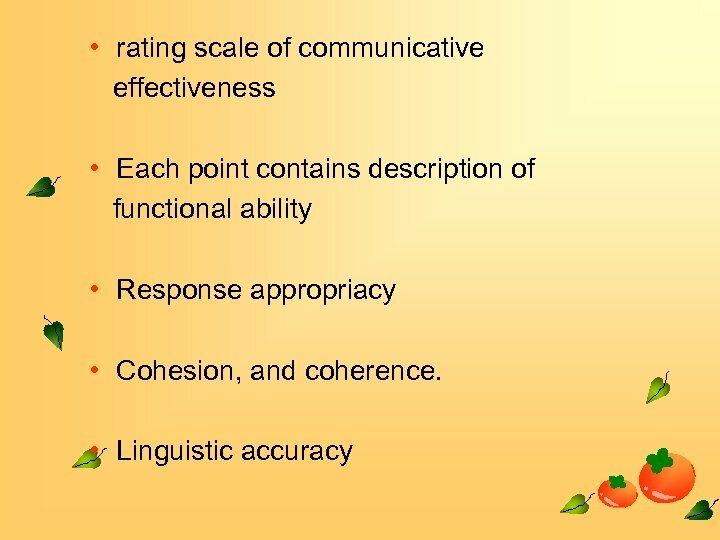 • Strategic competence A repertoire of compensatory strategies that help with a variety of communication difficulties. 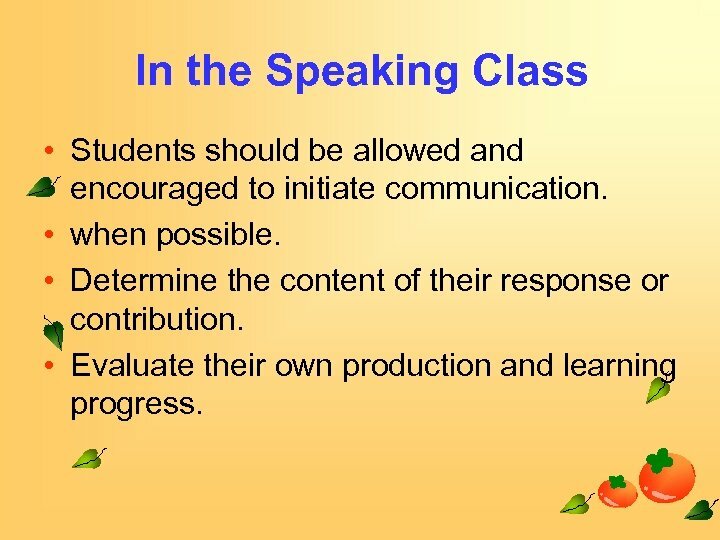 In the Speaking Class • Students should be allowed and encouraged to initiate communication. • when possible. 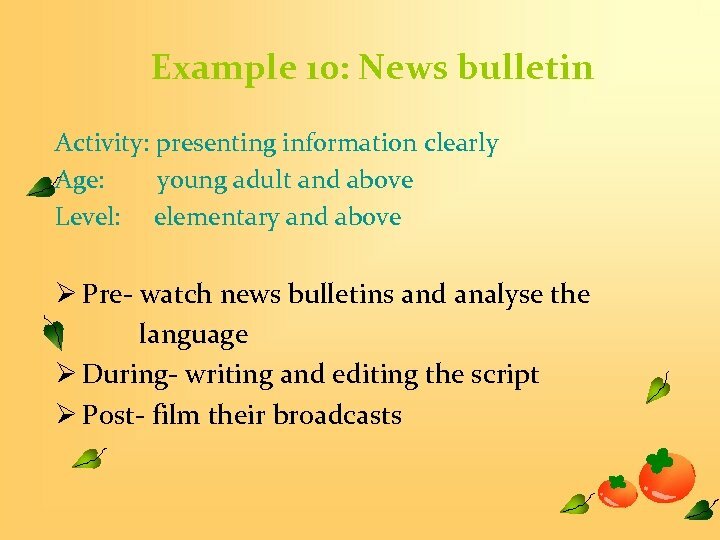 • Determine the content of their response or contribution. 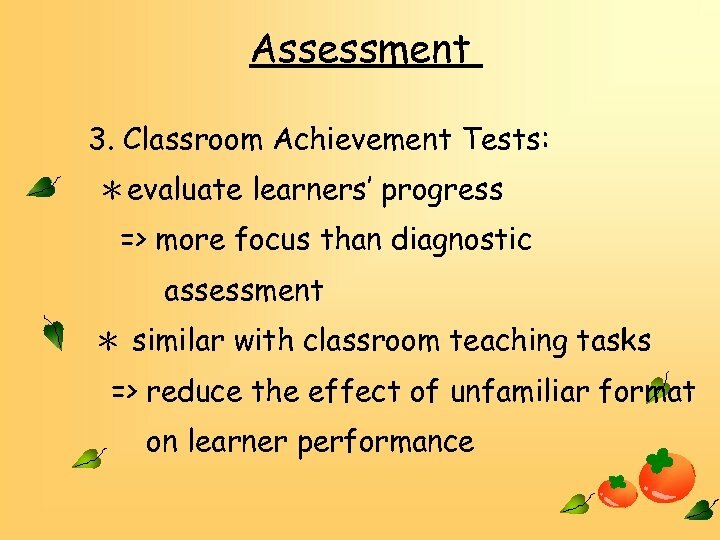 • Evaluate their own production and learning progress. 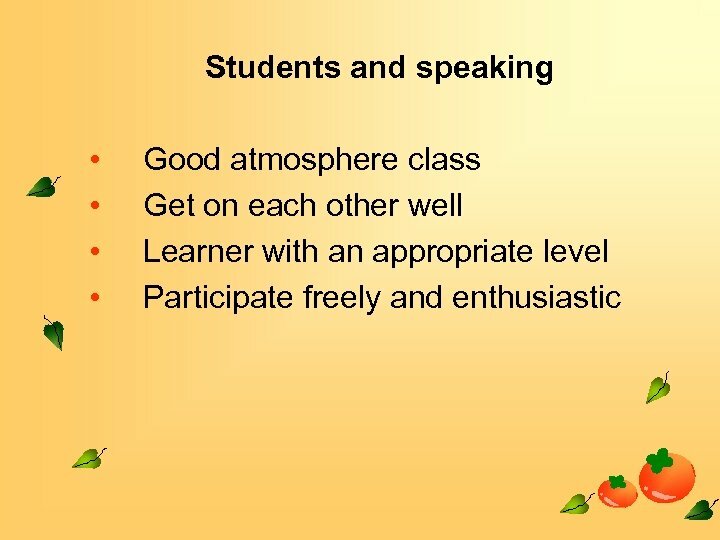 The oral skills class • • • Class Aim Who are the students? Why are they there? What do they expect to learn? What am I expected to teach. 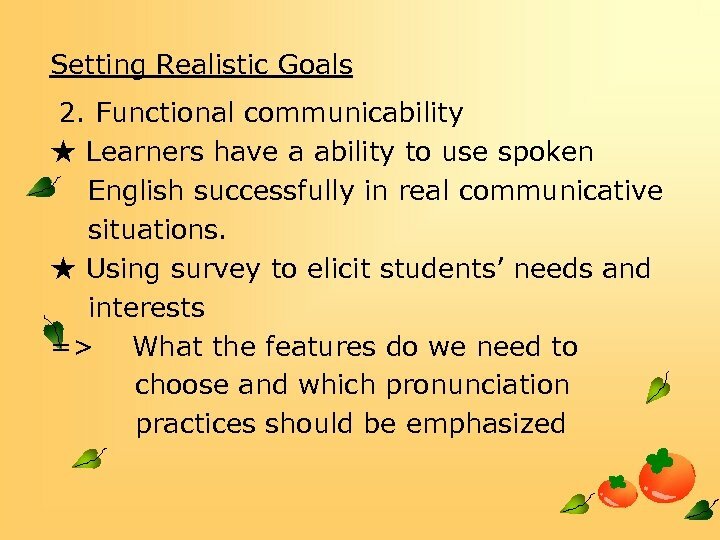 One basic consideration is the level of the students, and their perceived needs. 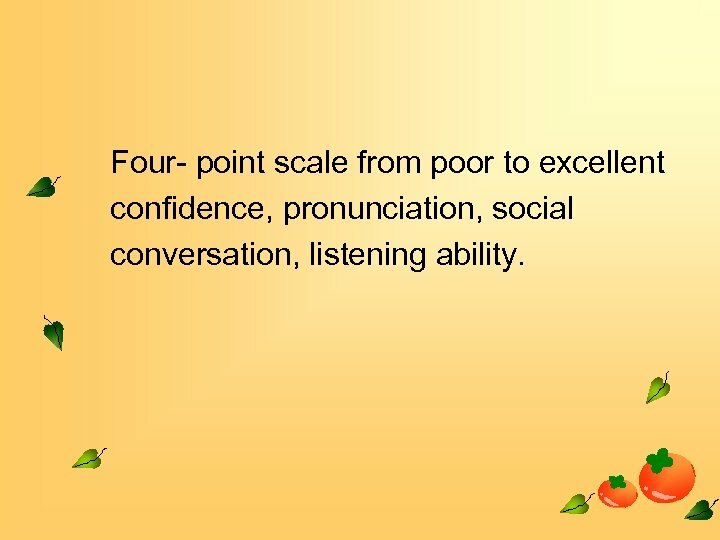 Four- point scale from poor to excellent confidence, pronunciation, social conversation, listening ability. 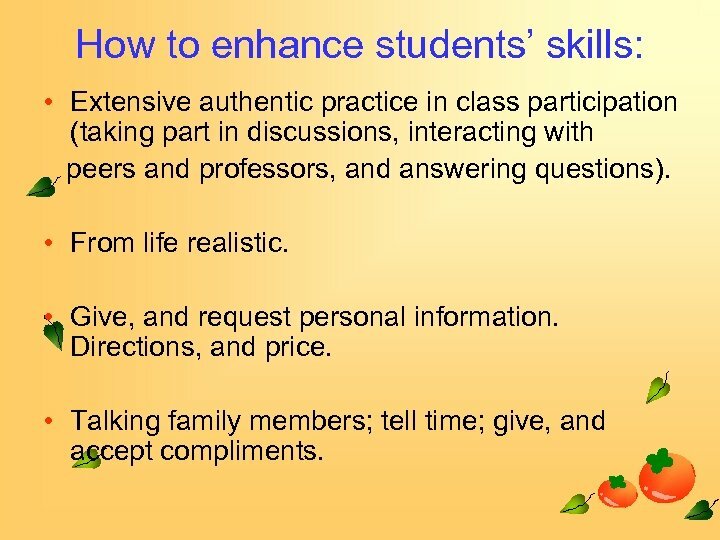 How to enhance students’ skills: • Extensive authentic practice in class participation (taking part in discussions, interacting with peers and professors, and answering questions). 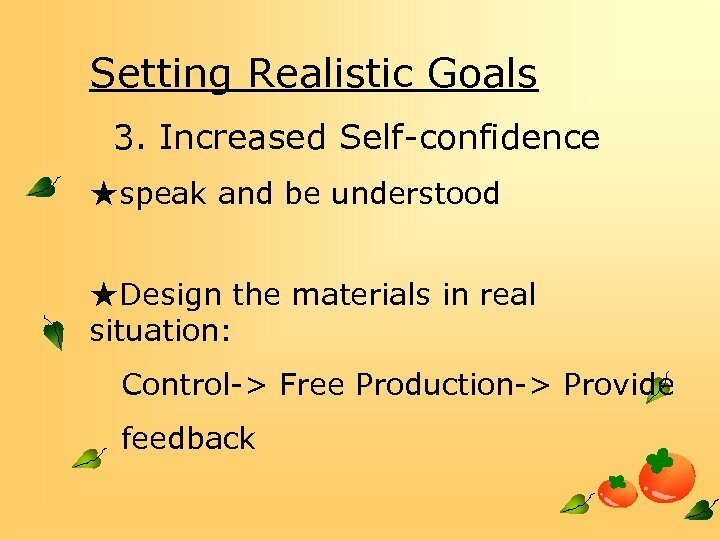 • From life realistic. • Give, and request personal information. Directions, and price. • Talking family members; tell time; give, and accept compliments. 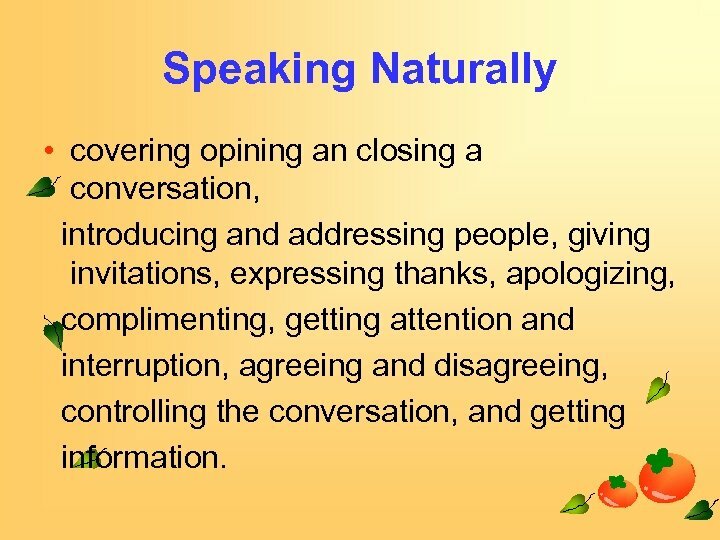 Speaking Naturally • covering opining an closing a conversation, introducing and addressing people, giving invitations, expressing thanks, apologizing, complimenting, getting attention and interruption, agreeing and disagreeing, controlling the conversation, and getting information. 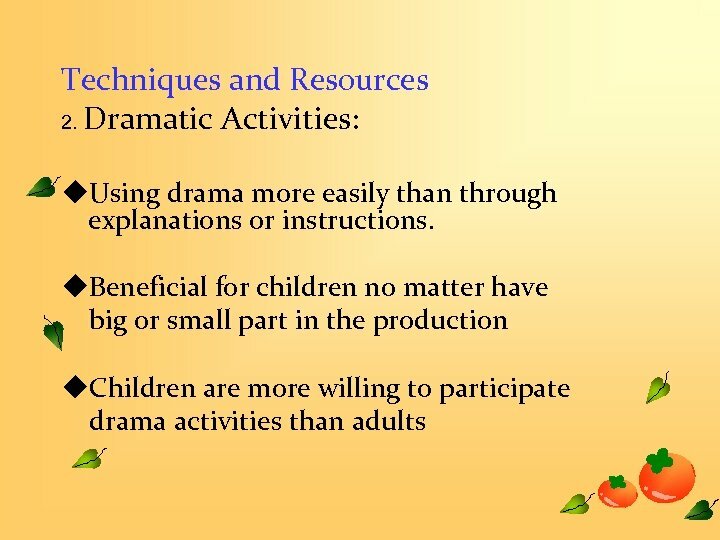 • Oral activitiesdiscussions, speeches, role plays, conversations, audiotape oral dialogue. Journals, and other accuracy base • Discussion. The most commonly use activity in the oral skills class. 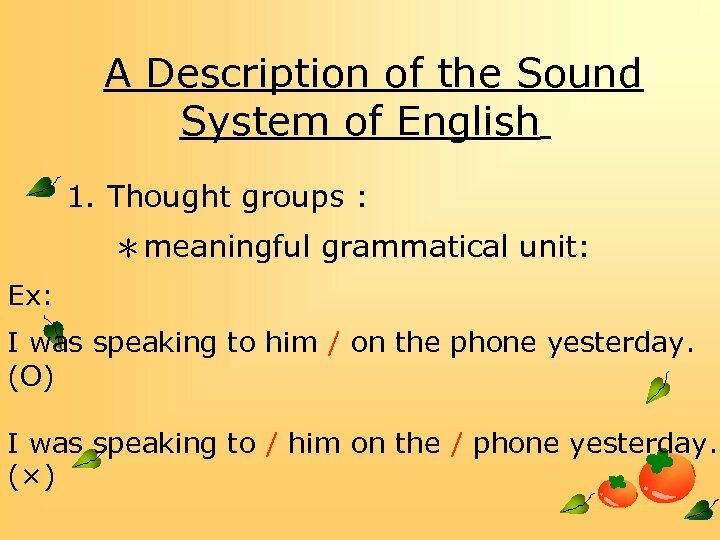 • Methodintroduce a topic, via reading or listening passage, or from videotape, then asked to get into pairs or groups to discuss, in order to come up with a solution, or response, or the like. 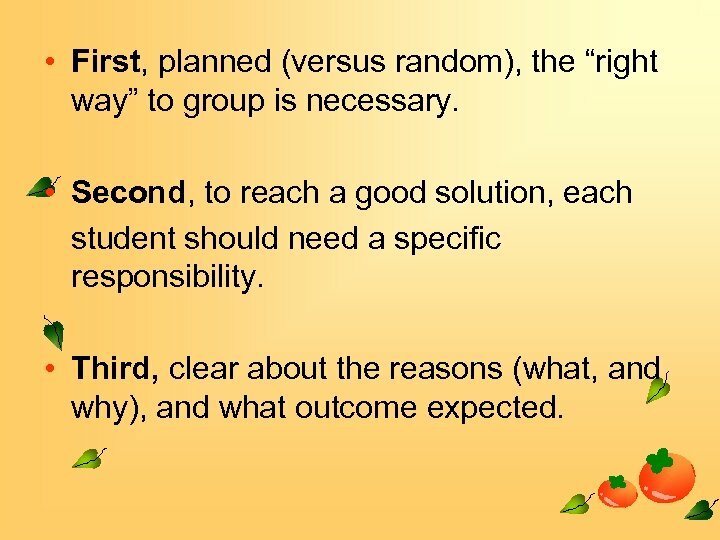 • First, planned (versus random), the “right way” to group is necessary. 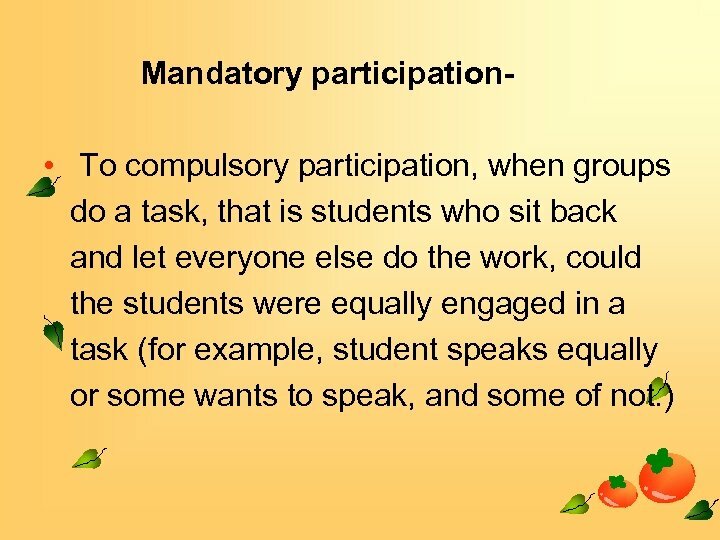 • Second, to reach a good solution, each student should need a specific responsibility. • Third, clear about the reasons (what, and why), and what outcome expected. 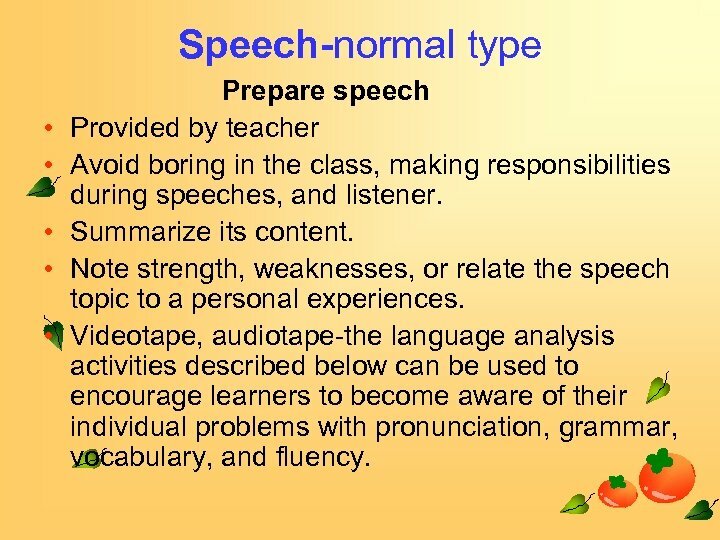 Speech-normal type • • • Prepare speech Provided by teacher Avoid boring in the class, making responsibilities during speeches, and listener. Summarize its content. 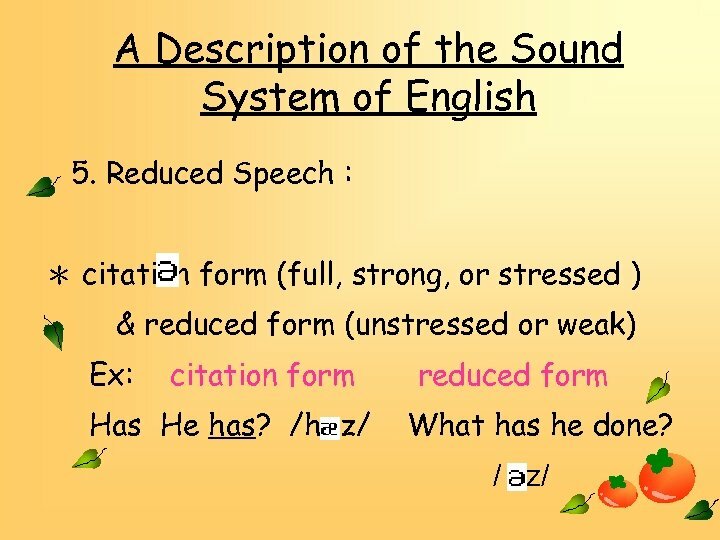 Note strength, weaknesses, or relate the speech topic to a personal experiences. 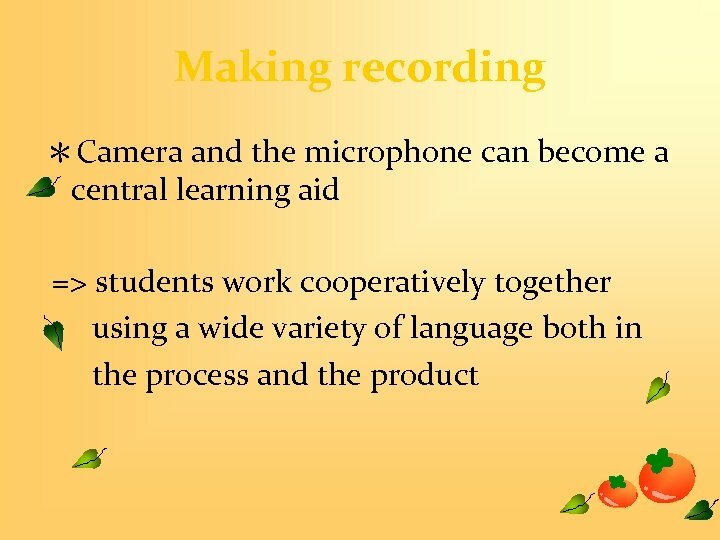 Videotape, audiotape-the language analysis activities described below can be used to encourage learners to become aware of their individual problems with pronunciation, grammar, vocabulary, and fluency. 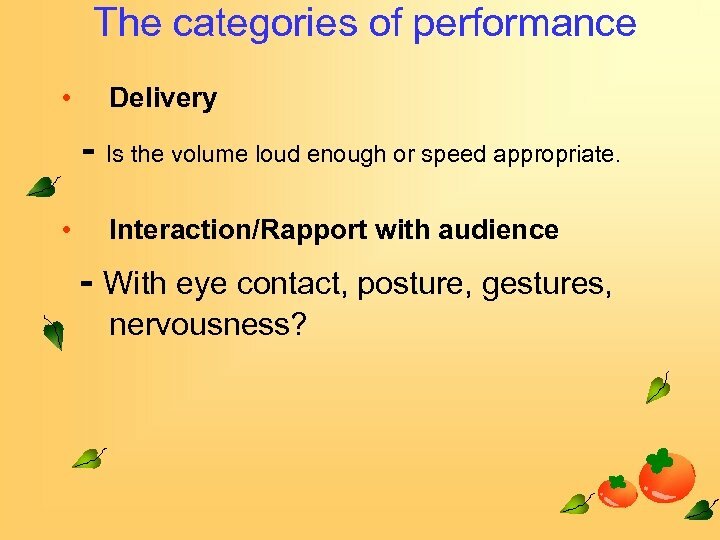 The categories of performance • Delivery - Is the volume loud enough or speed appropriate. • Interaction/Rapport with audience - With eye contact, posture, gestures, nervousness? 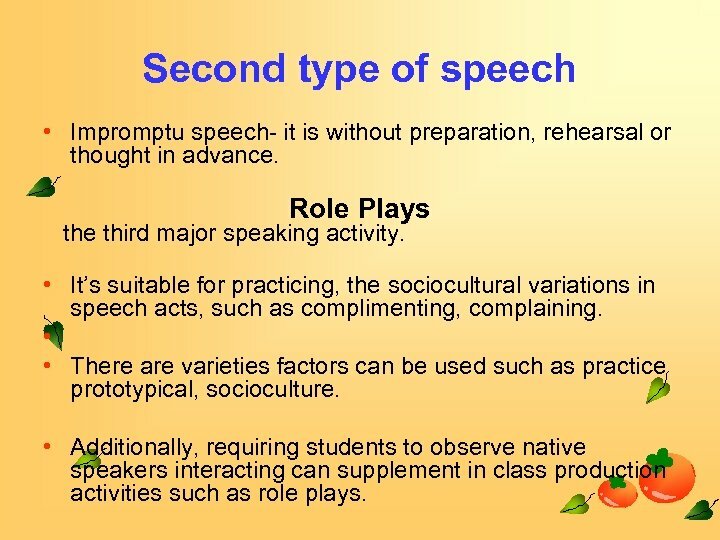 Second type of speech • Impromptu speech- it is without preparation, rehearsal or thought in advance. Role Plays the third major speaking activity. 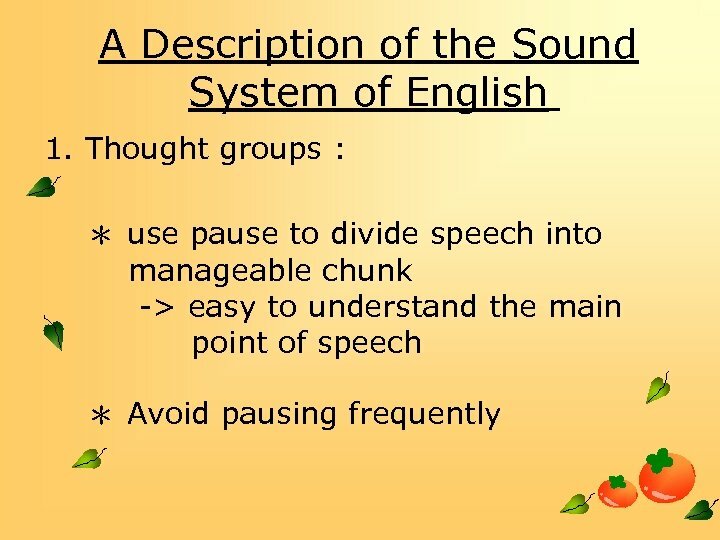 • It’s suitable for practicing, the sociocultural variations in speech acts, such as complimenting, complaining. • • There are varieties factors can be used such as practice prototypical, socioculture. 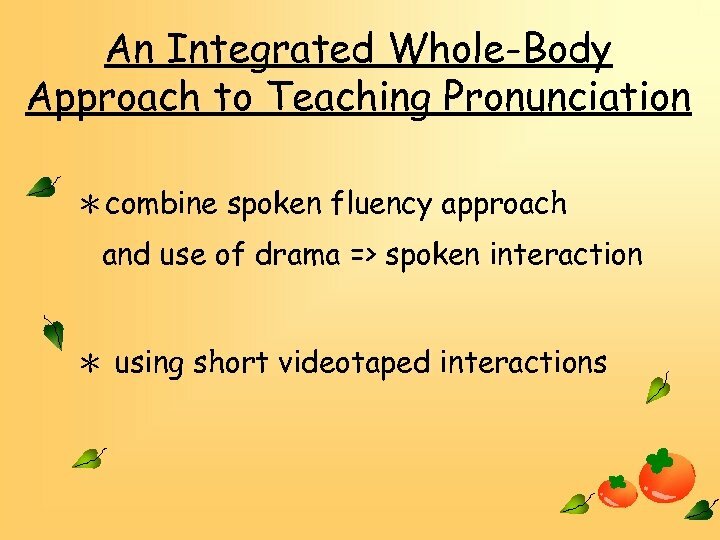 • Additionally, requiring students to observe native speakers interacting can supplement in class production activities such as role plays. ØFor example, when teaching a unit on complaints, one assignment might be to have students go to places where complaints might be common (the return desk at a discount store). 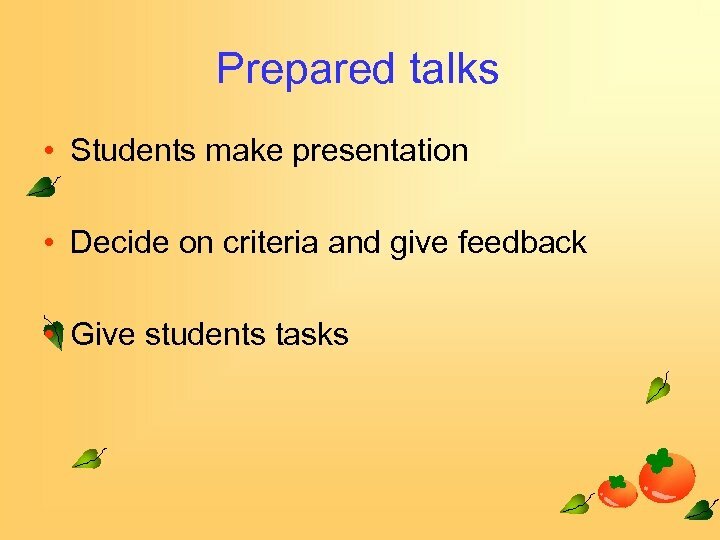 ØThen, they can listen carefully for how complaints are stated and responded to perhaps using a checklist that the students themselves create for observing that particular speech act. 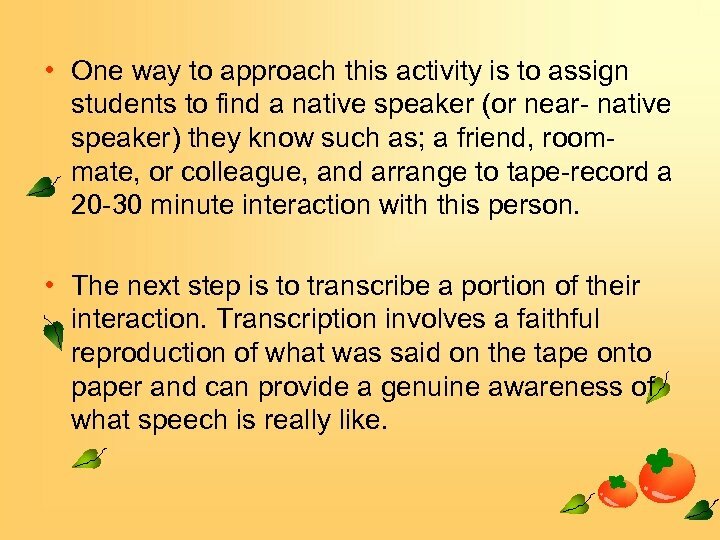 • One way to approach this activity is to assign students to find a native speaker (or near- native speaker) they know such as; a friend, roommate, or colleague, and arrange to tape-record a 20 -30 minute interaction with this person. 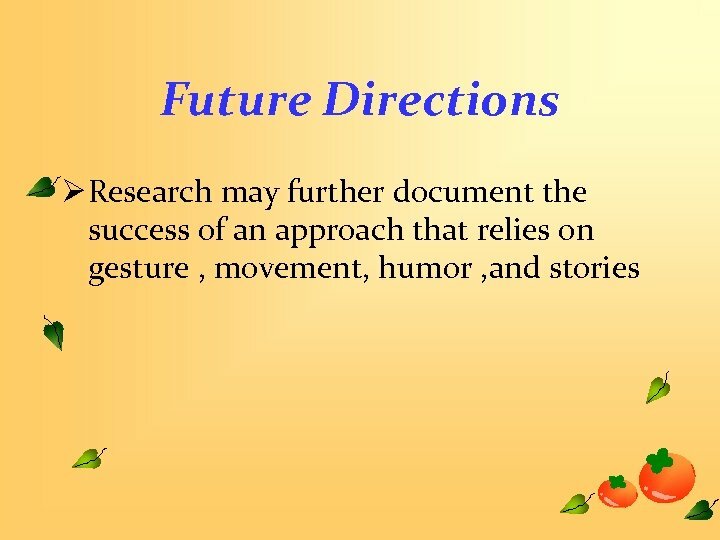 • The next step is to transcribe a portion of their interaction. Transcription involves a faithful reproduction of what was said on the tape onto paper and can provide a genuine awareness of what speech is really like. 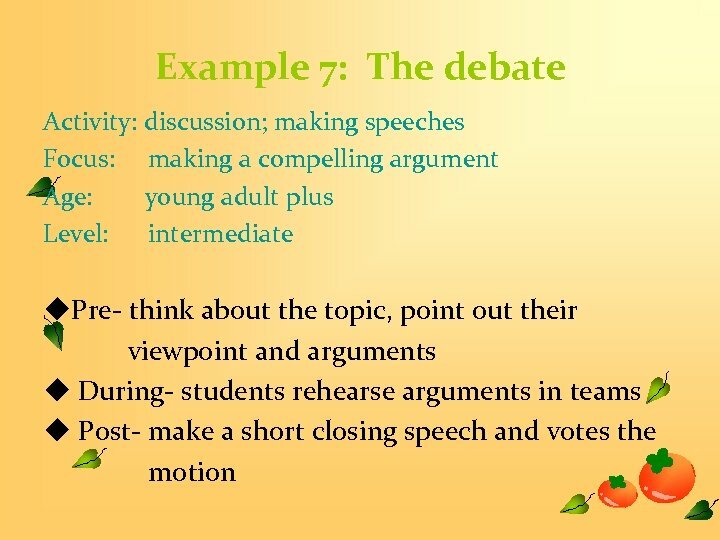 For evaluation, choosing one of a interesting topics such as; abortion, gun control, illegal, immigration, then in pairs or in groups, survey native speakers about their opinions. 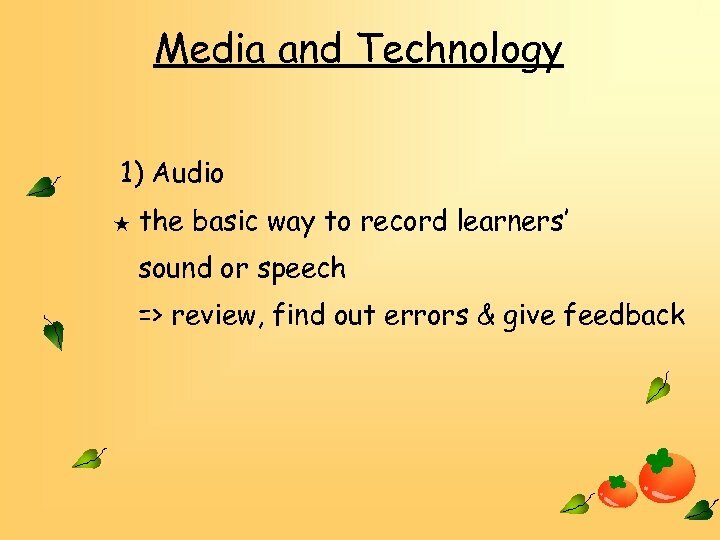 The results of survey can then be presented in the form of an oral presentation, which in turn can be audiotaped and or videotaped for self peer, and teacher evaluation. 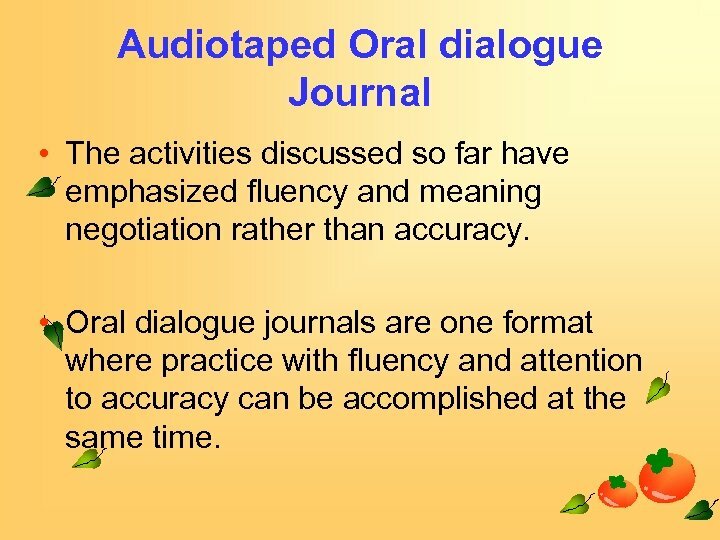 Audiotaped Oral dialogue Journal • The activities discussed so far have emphasized fluency and meaning negotiation rather than accuracy. 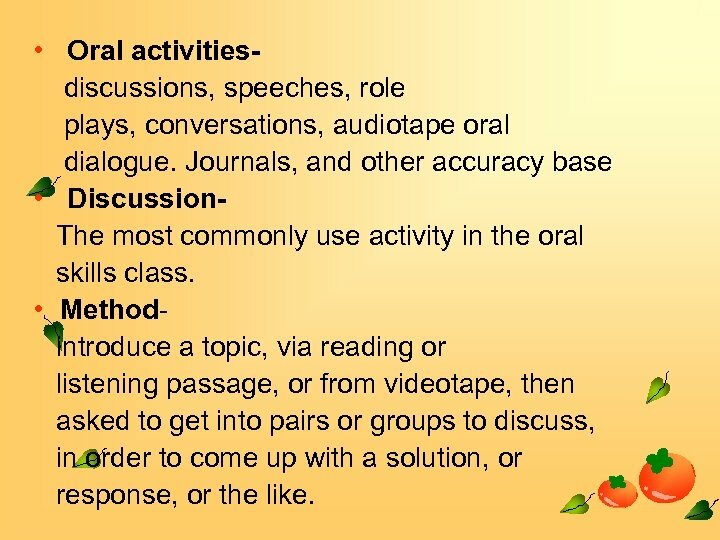 • Oral dialogue journals are one format where practice with fluency and attention to accuracy can be accomplished at the same time. 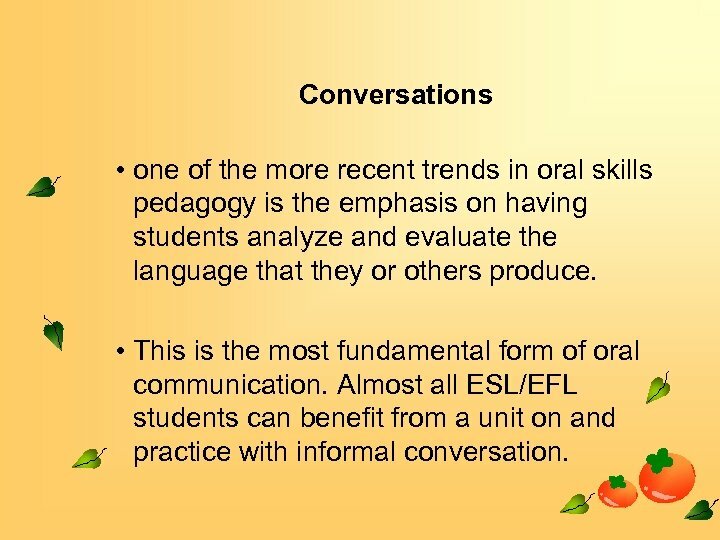 Conversations • one of the more recent trends in oral skills pedagogy is the emphasis on having students analyze and evaluate the language that they or others produce. 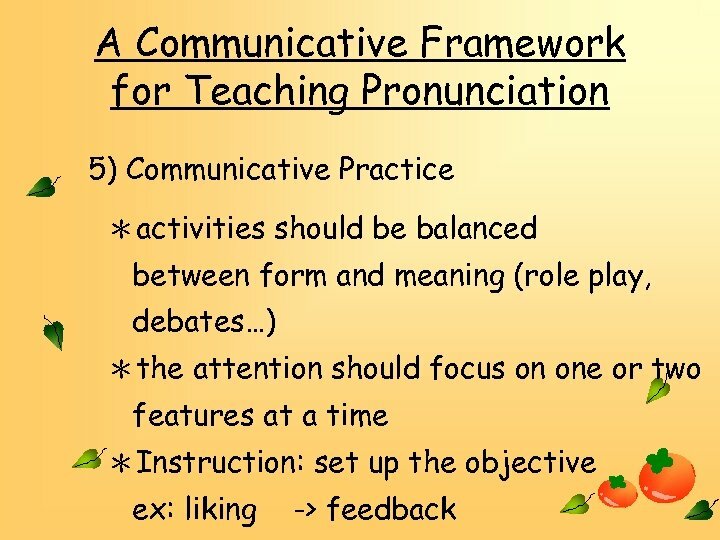 • This is the most fundamental form of oral communication. 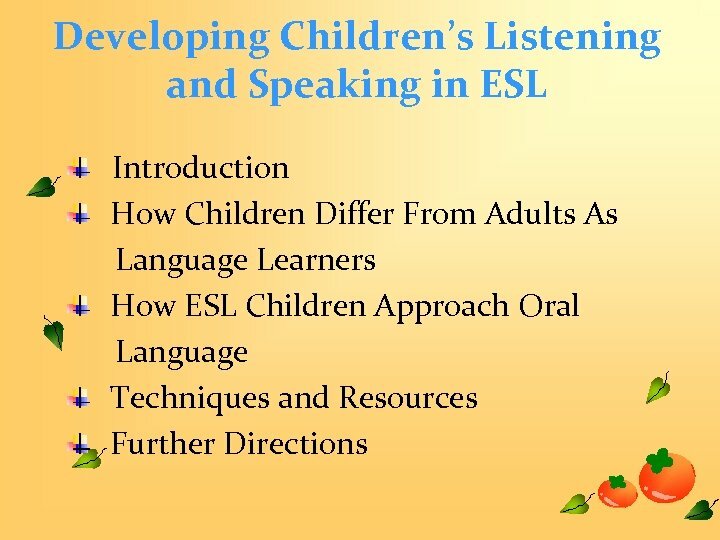 Almost all ESL/EFL students can benefit from a unit on and practice with informal conversation. 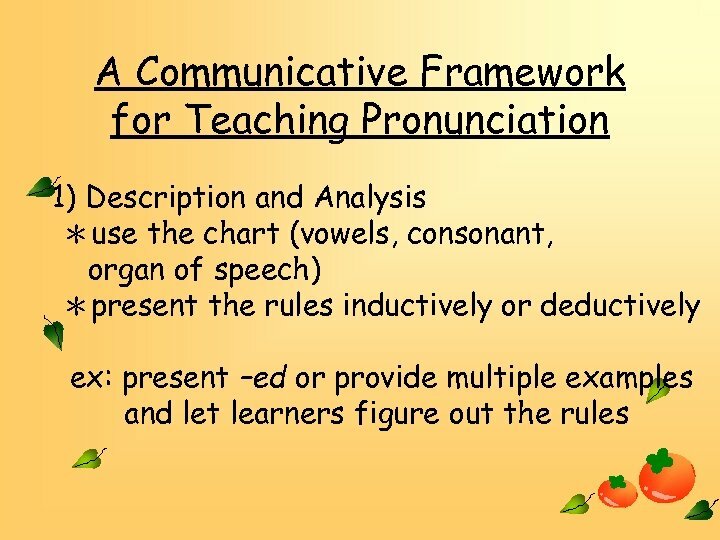 Be sure to remind students to speak extemporaneously and explain why. 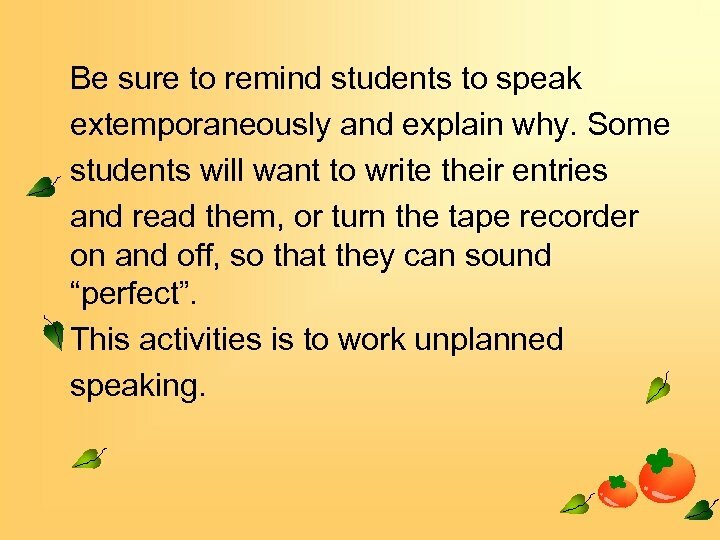 Some students will want to write their entries and read them, or turn the tape recorder on and off, so that they can sound “perfect”. This activities is to work unplanned speaking. 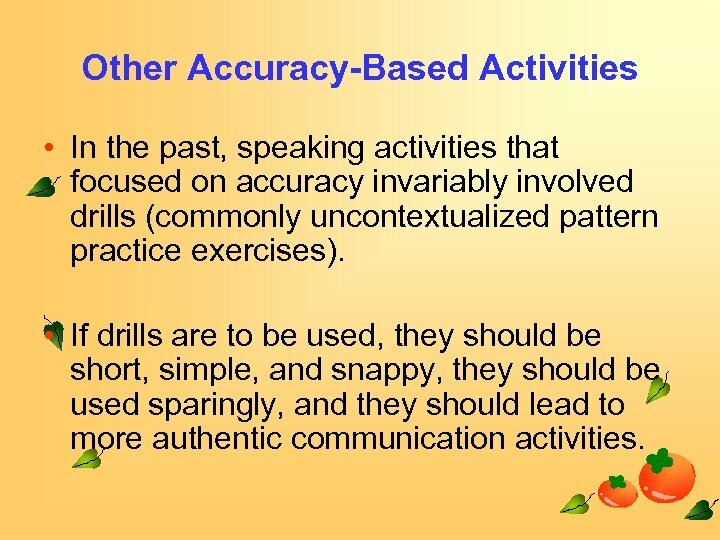 Other Accuracy-Based Activities • In the past, speaking activities that focused on accuracy invariably involved drills (commonly uncontextualized pattern practice exercises). 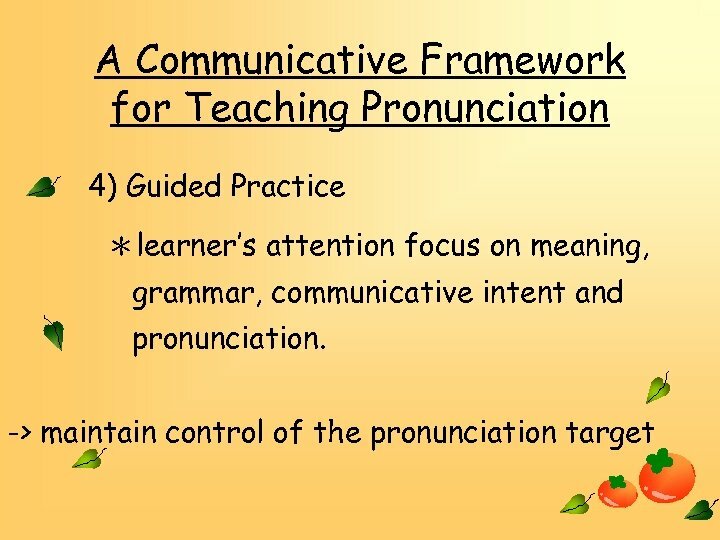 • If drills are to be used, they should be short, simple, and snappy, they should be used sparingly, and they should lead to more authentic communication activities. 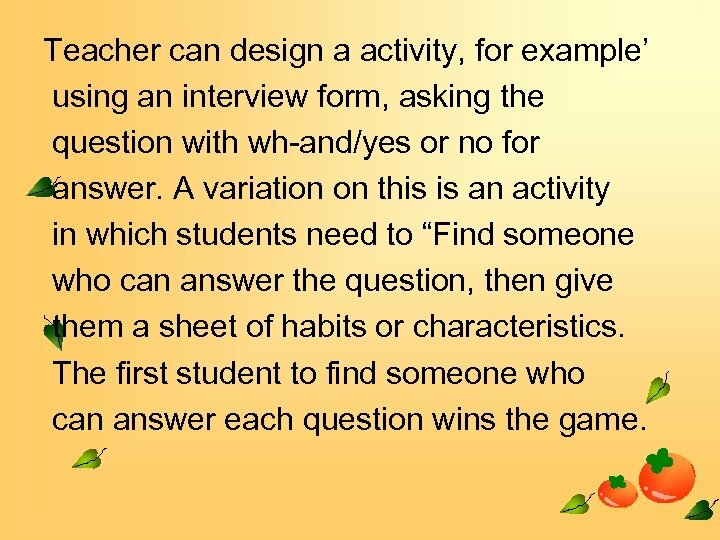 Teacher can design a activity, for example’ using an interview form, asking the question with wh-and/yes or no for answer. 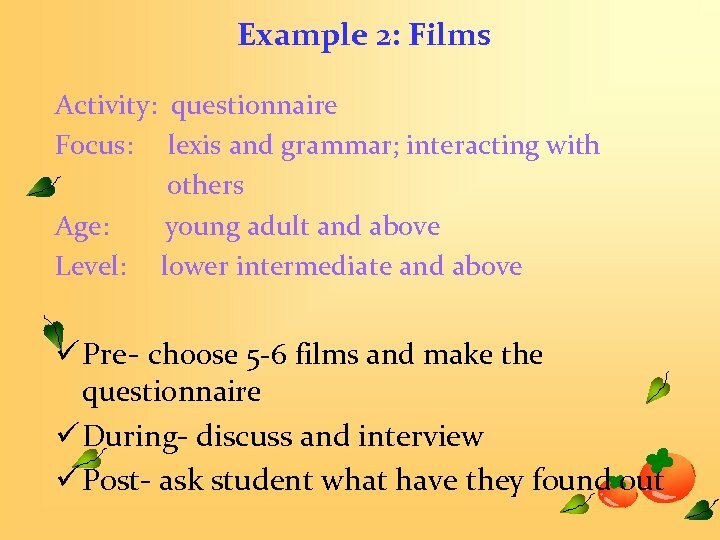 A variation on this is an activity in which students need to “Find someone who can answer the question, then give them a sheet of habits or characteristics. The first student to find someone who can answer each question wins the game. 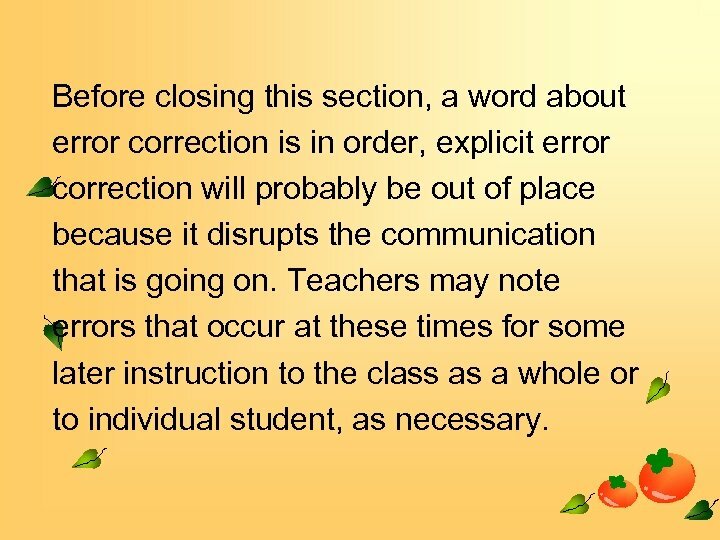 Before closing this section, a word about error correction is in order, explicit error correction will probably be out of place because it disrupts the communication that is going on. 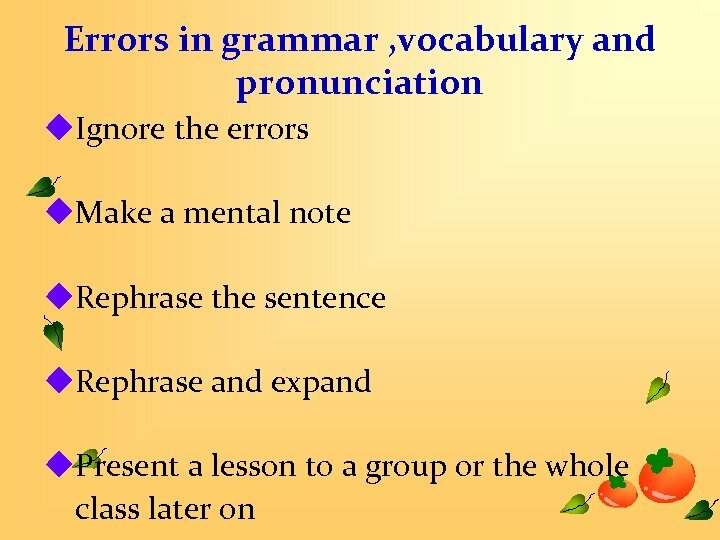 Teachers may note errors that occur at these times for some later instruction to the class as a whole or to individual student, as necessary. 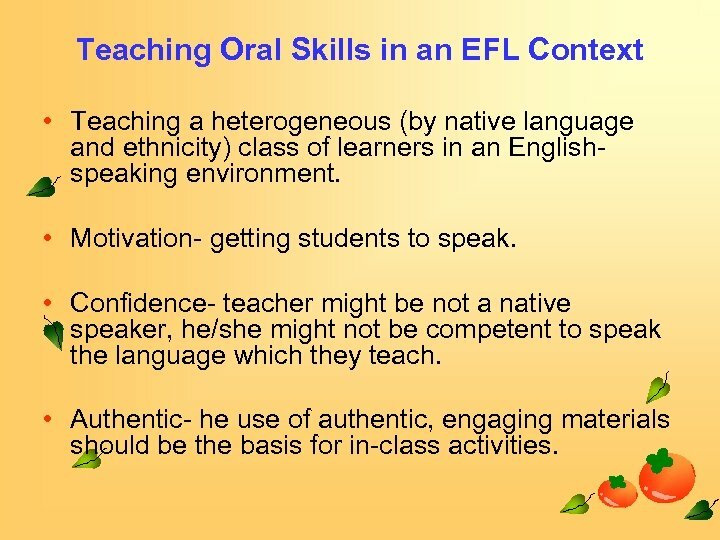 Teaching Oral Skills in an EFL Context • Teaching a heterogeneous (by native language and ethnicity) class of learners in an Englishspeaking environment. 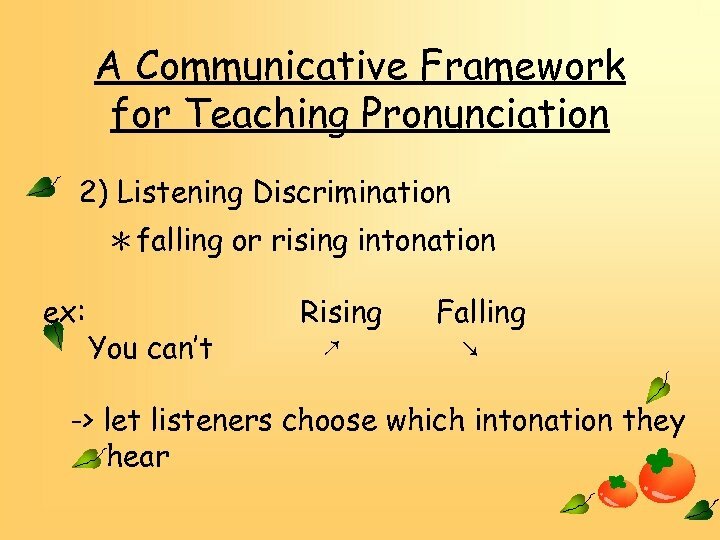 • Motivation- getting students to speak. 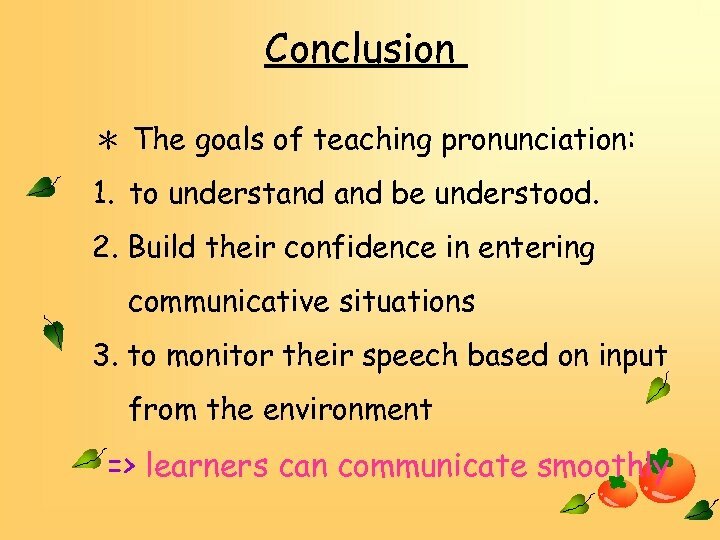 • Confidence- teacher might be not a native speaker, he/she might not be competent to speak the language which they teach. 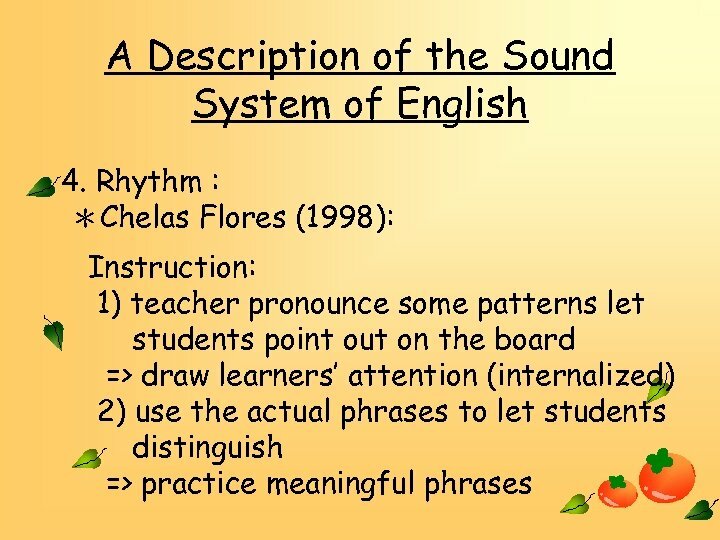 • Authentic- he use of authentic, engaging materials should be the basis for in-class activities. 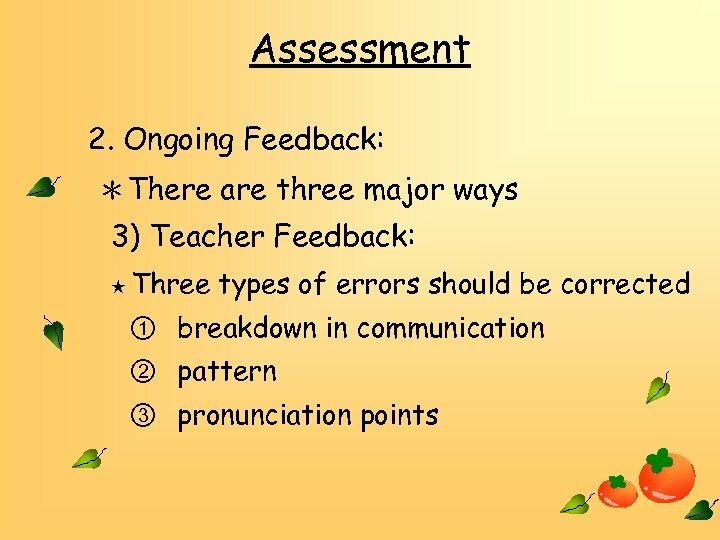 Assessment • The oral skills teacher may be required to make decision about two kinds of oral assessment. As following • First whenever possible, extended chunks of speech that have a purpose and that are structured or organized should be elicited. 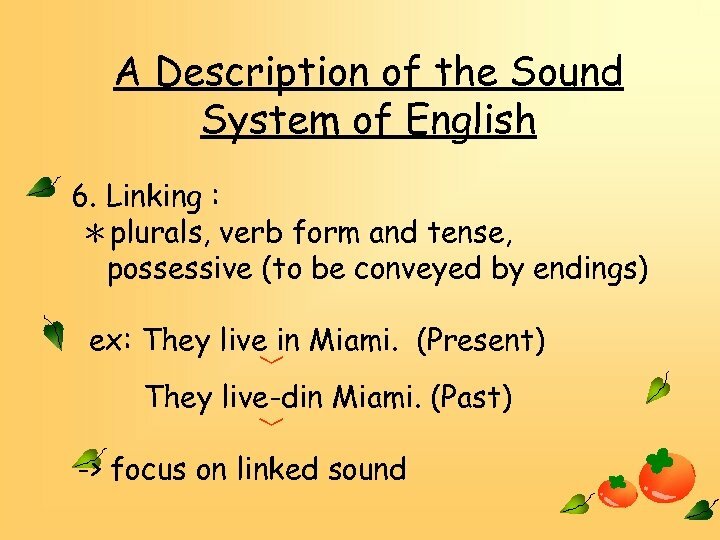 • With no planning time-isolated sentences, spontaneous, production with no planning time. 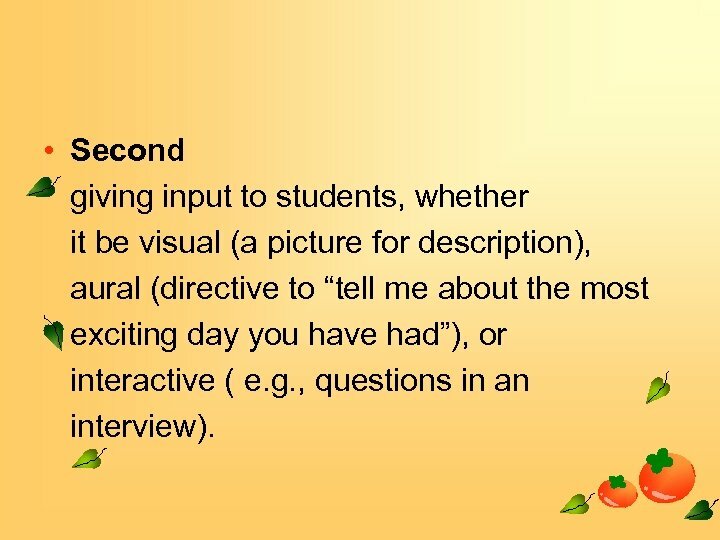 • Second giving input to students, whether it be visual (a picture for description), aural (directive to “tell me about the most exciting day you have had”), or interactive ( e. g. , questions in an interview). 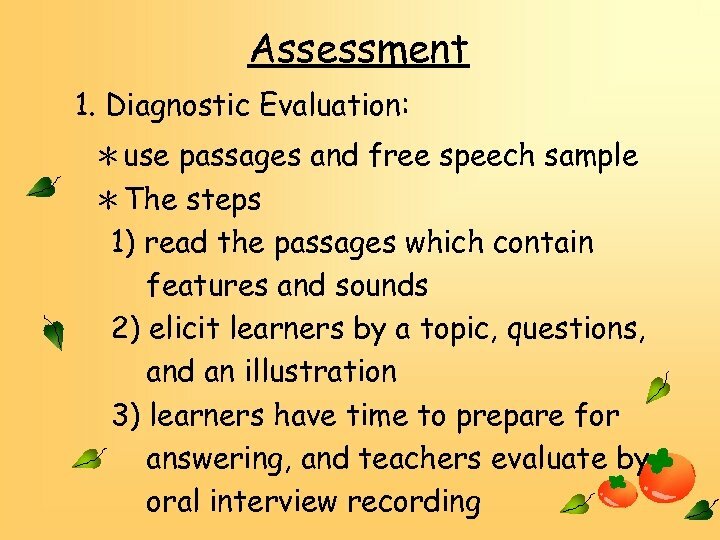 • Finally the results of oral assessment should be reported using terms, that are clearly defined for and understandable to students. 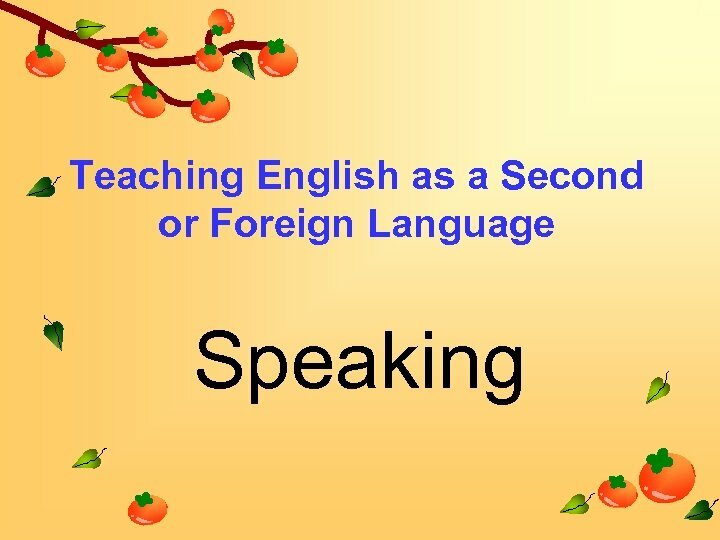 For example, the student level, and the speaking task itself, note the difference in specificity between “generally effective communication and can answer questions about home family, even in a work place. 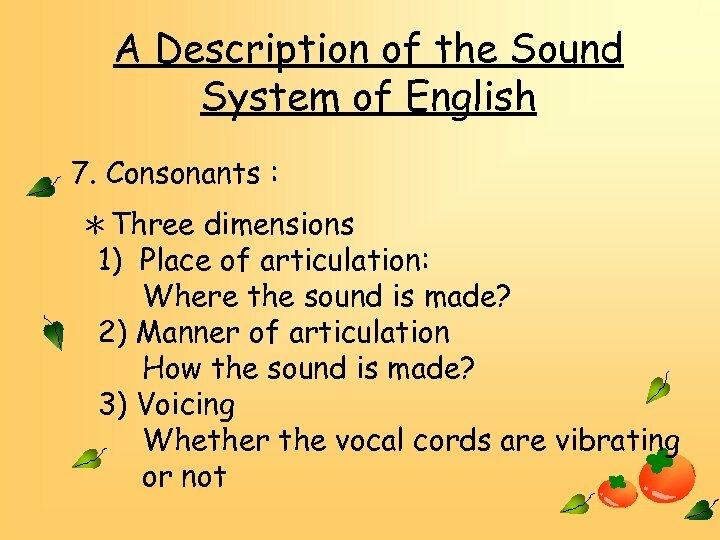 Four large scale good examples The University of Cambridge Local Examinations Syndicate (UCLES) offers two large-scale speaking tests, which are Oral Interaction test in the Certificate in Communicative Skill in English (CCSE). 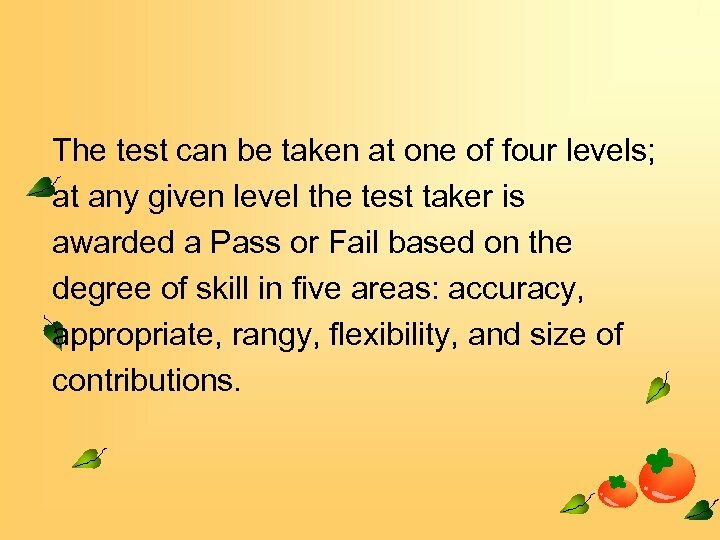 The test can be taken at one of four levels; at any given level the test taker is awarded a Pass or Fail based on the degree of skill in five areas: accuracy, appropriate, rangy, flexibility, and size of contributions. 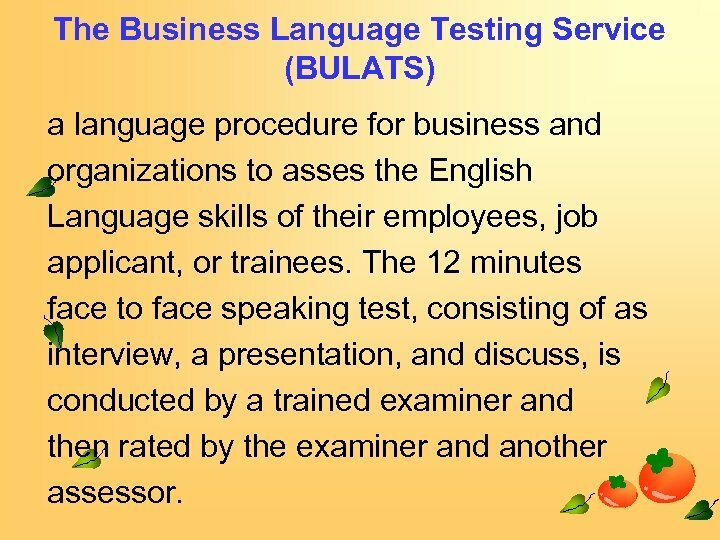 The Business Language Testing Service (BULATS) a language procedure for business and organizations to asses the English Language skills of their employees, job applicant, or trainees. The 12 minutes face to face speaking test, consisting of as interview, a presentation, and discuss, is conducted by a trained examiner and then rated by the examiner and another assessor. 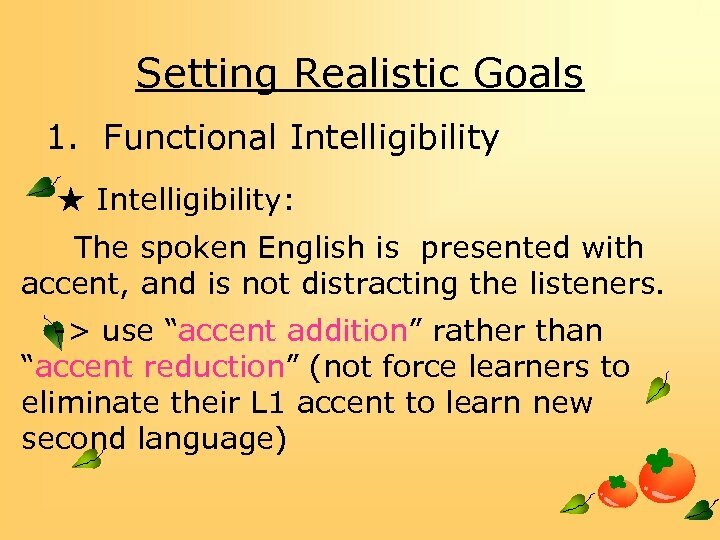 Oral examination, administered by the American council on the Teaching of Foreign Languages (ACTEL) Is the ACTEL oral Proficiency Interview. 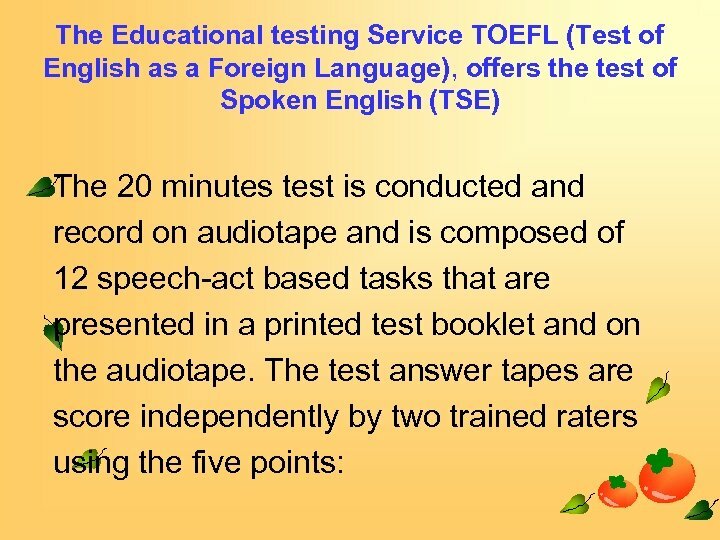 • The 10 -30 minutes tape- recorded interview is administered (either over the telephone or face to face by a trained Oral proficiency the interaction to elicit the best possible performance from the candidate. 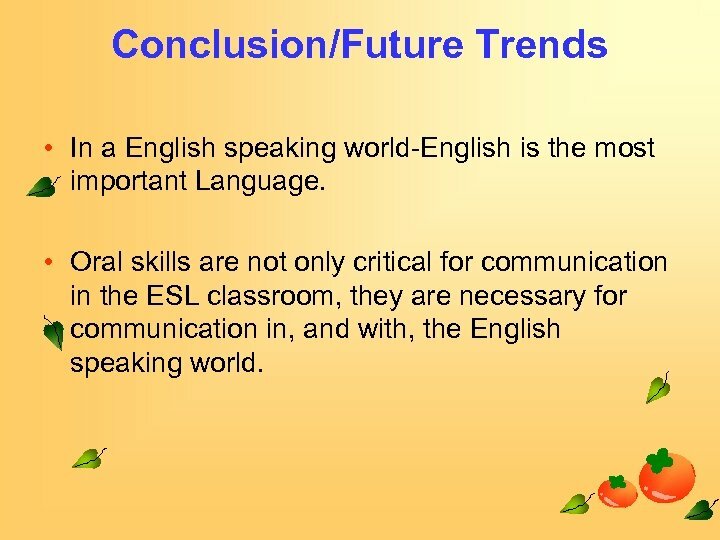 Conclusion/Future Trends • In a English speaking world-English is the most important Language. 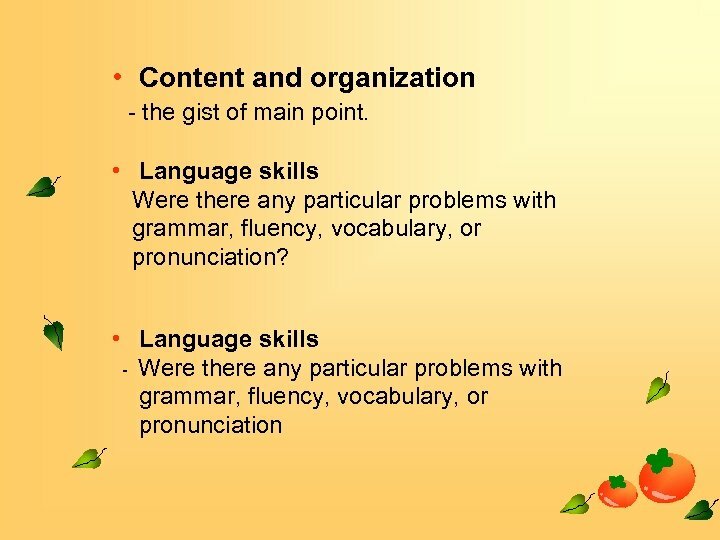 • Oral skills are not only critical for communication in the ESL classroom, they are necessary for communication in, and with, the English speaking world. 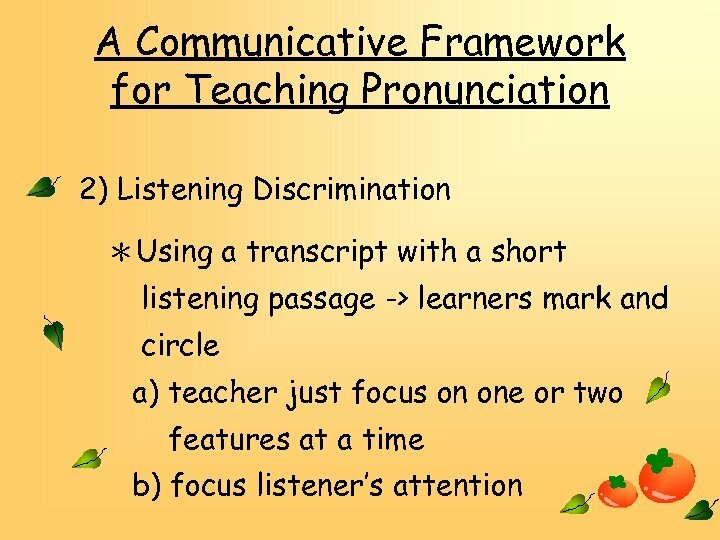 • Teacher will want to do whatever they can to promote the development of speaking, listening, and pronunciation skills in their students. 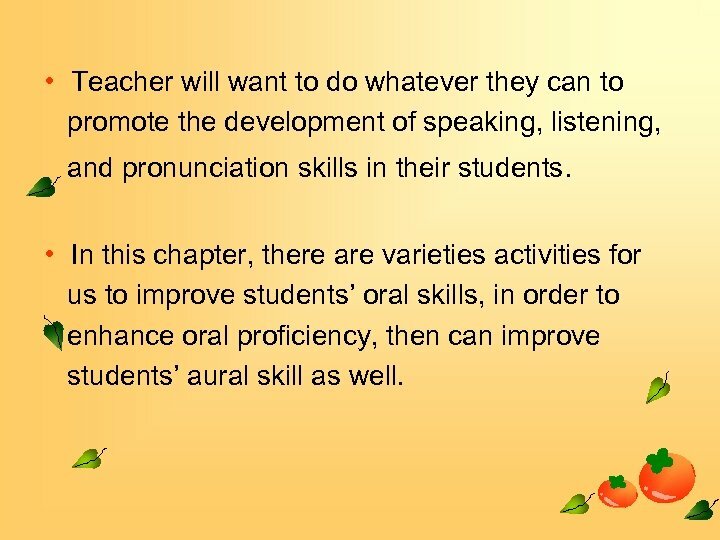 • In this chapter, there are varieties activities for us to improve students’ oral skills, in order to enhance oral proficiency, then can improve students’ aural skill as well. How to improve? And what is the ways students can improve? 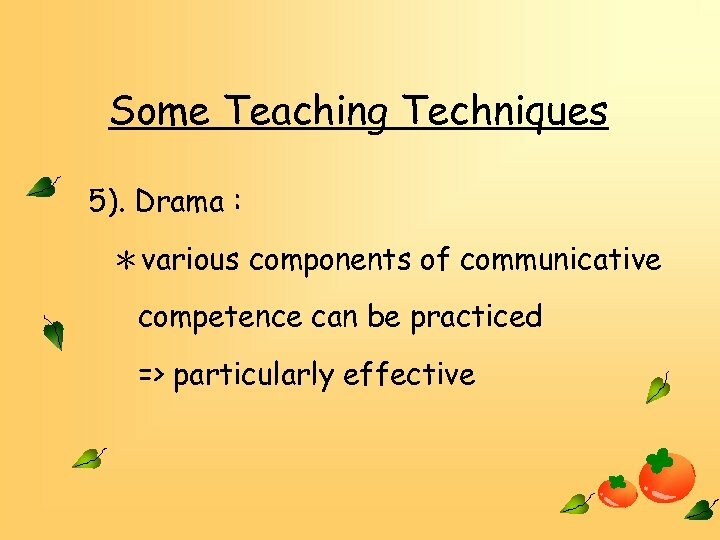 • Give an overview of theoretical basis for teaching in this area, such as discussions, speeches, role plays, and conversations. 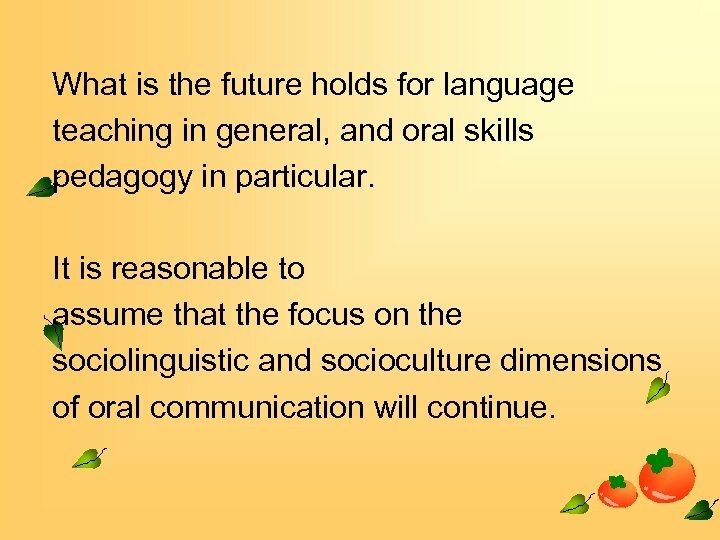 What is the future holds for language teaching in general, and oral skills pedagogy in particular. 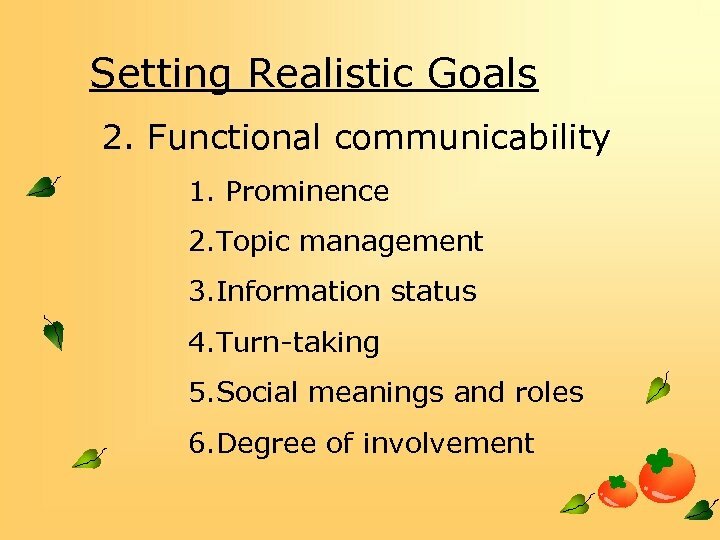 It is reasonable to assume that the focus on the sociolinguistic and socioculture dimensions of oral communication will continue. 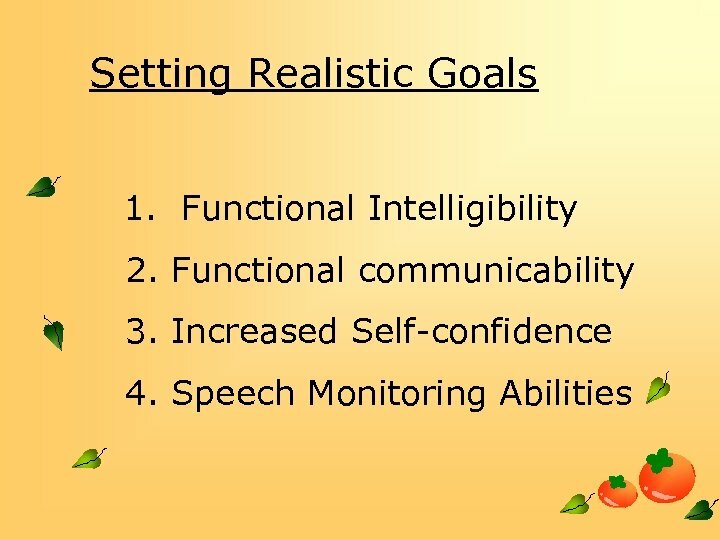 Setting Realistic Goals 4. 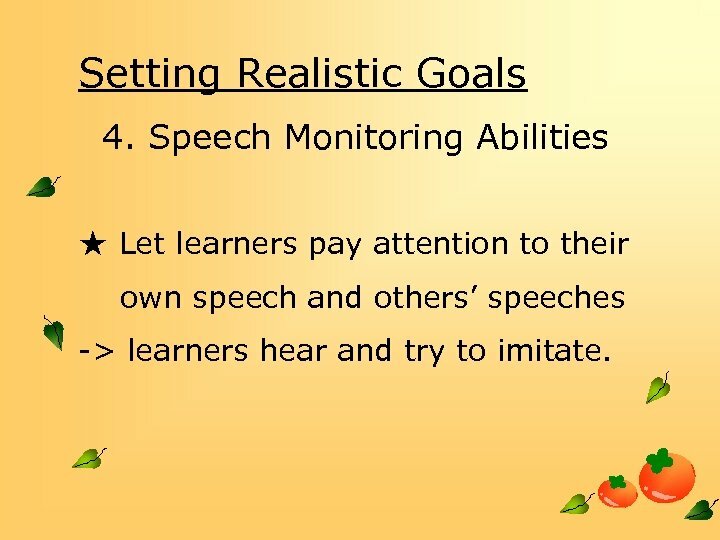 Speech Monitoring Abilities ★ Let learners pay attention to their own speech and others’ speeches -> learners hear and try to imitate. 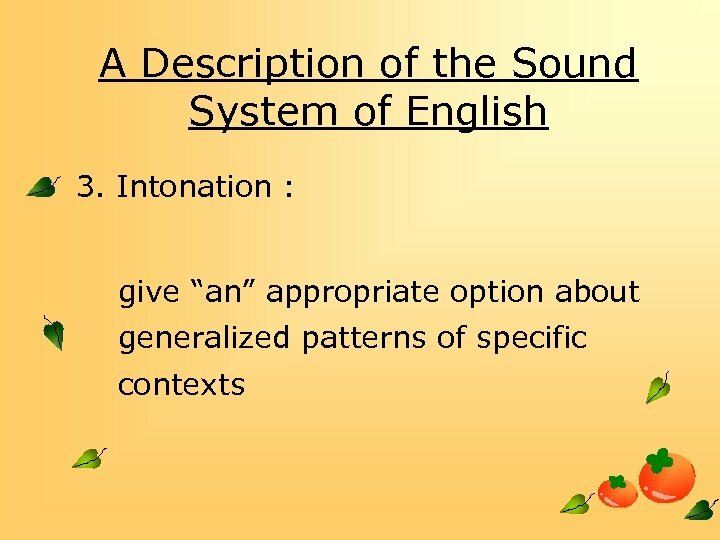 A Description of the Sound System of English 1. 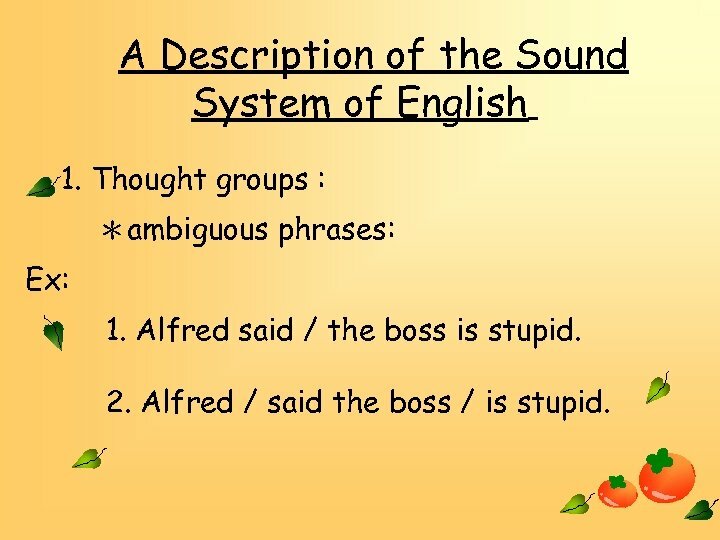 Thought groups : ＊ambiguous phrases: Ex: 1. Alfred said / the boss is stupid. 2. Alfred / said the boss / is stupid. 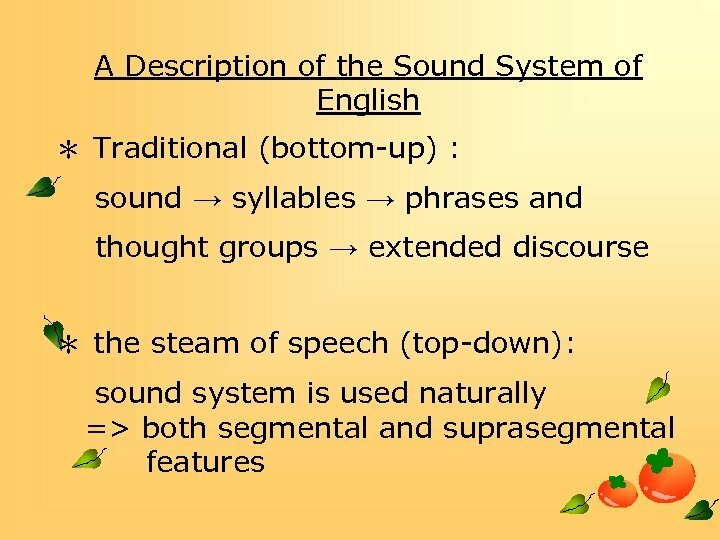 A Description of the Sound System of English 2. 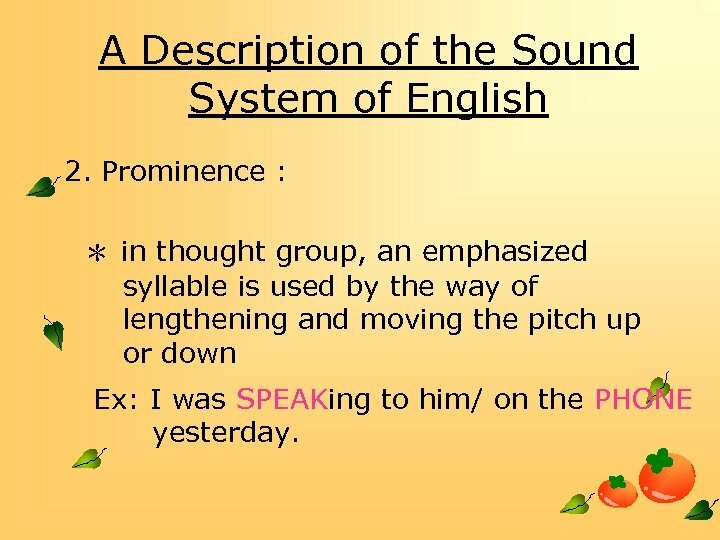 Prominence : ＊ in thought group, an emphasized syllable is used by the way of lengthening and moving the pitch up or down Ex: I was SPEAKing to him/ on the PHONE yesterday. 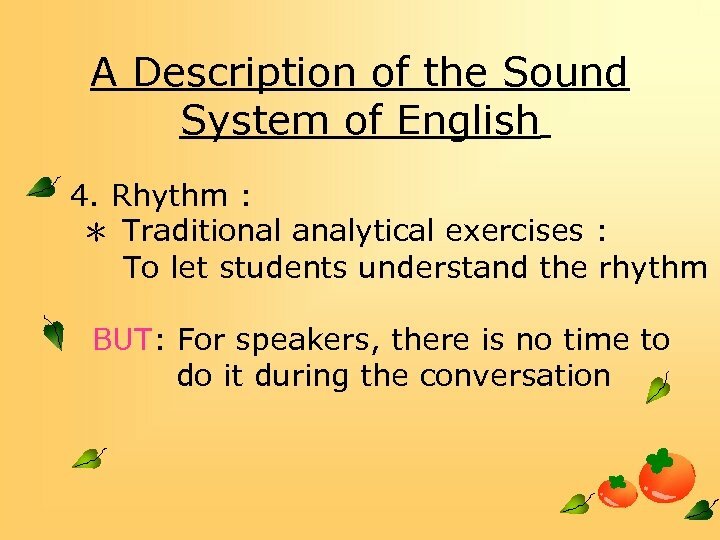 A Description of the Sound System of English 2. 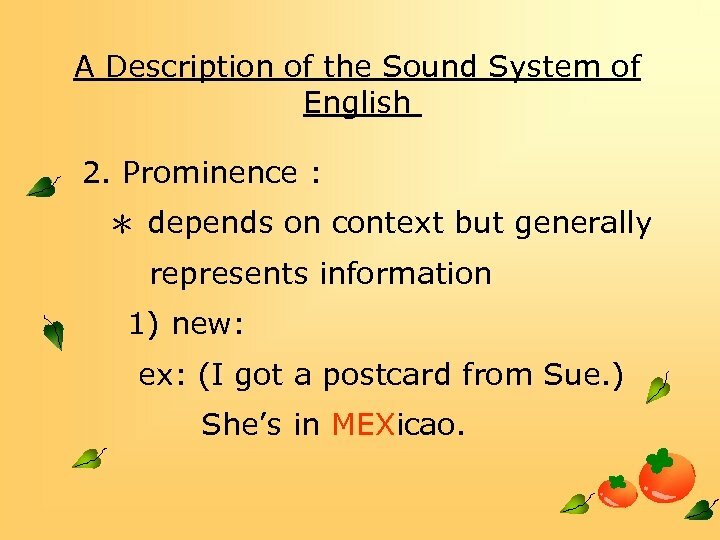 Prominence : ＊ depends on context but generally represents information 1) new: ex: (I got a postcard from Sue. ) She’s in MEXicao. 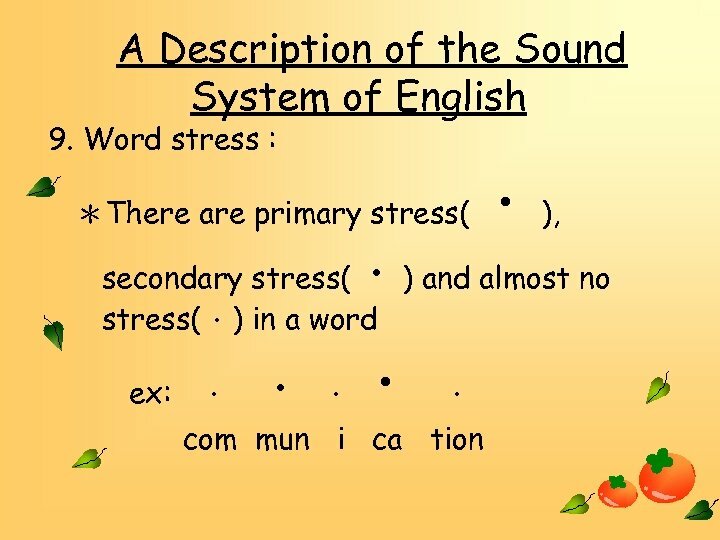 A Description of the Sound System of English 2. 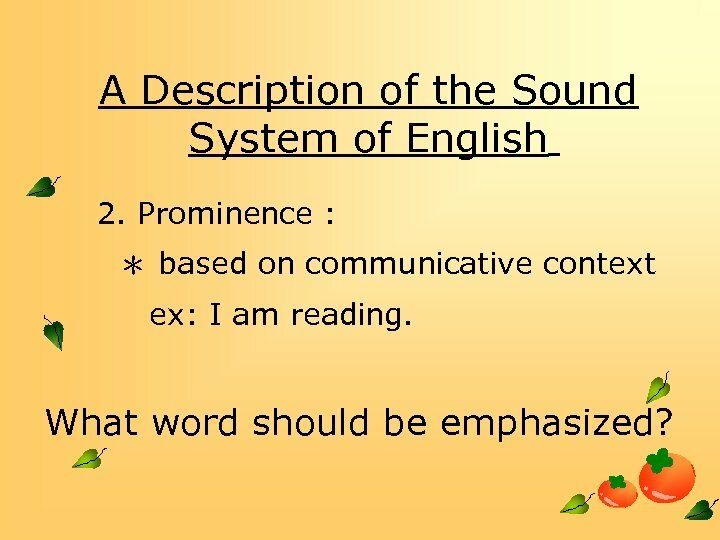 Prominence : ＊ based on communicative context ex: I am reading. What word should be emphasized? 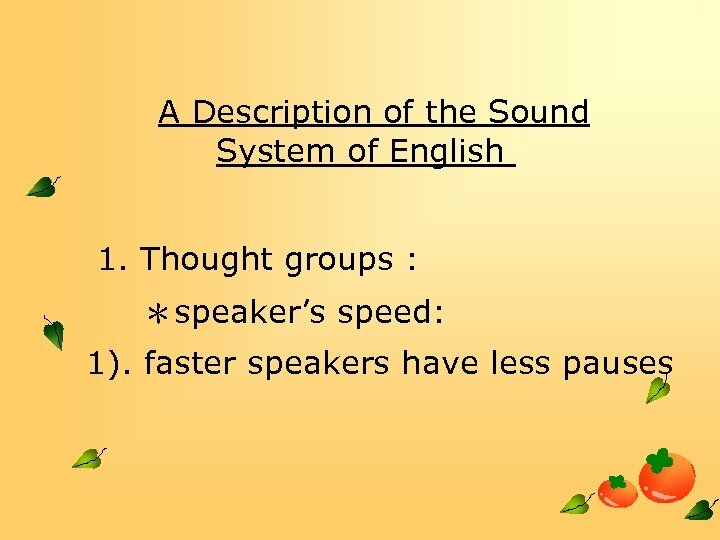 A Description of the Sound System of English 3. 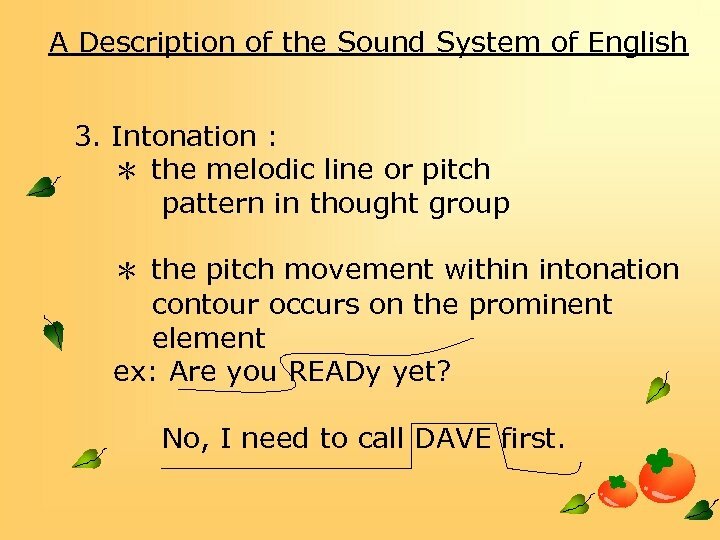 Intonation : ＊ the melodic line or pitch pattern in thought group ＊ the pitch movement within intonation contour occurs on the prominent element ex: Are you READy yet? No, I need to call DAVE first. 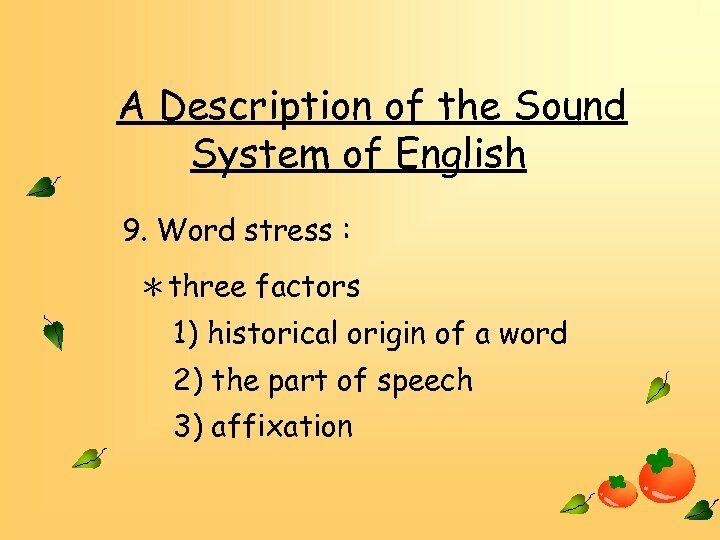 A Description of the Sound System of English 3. 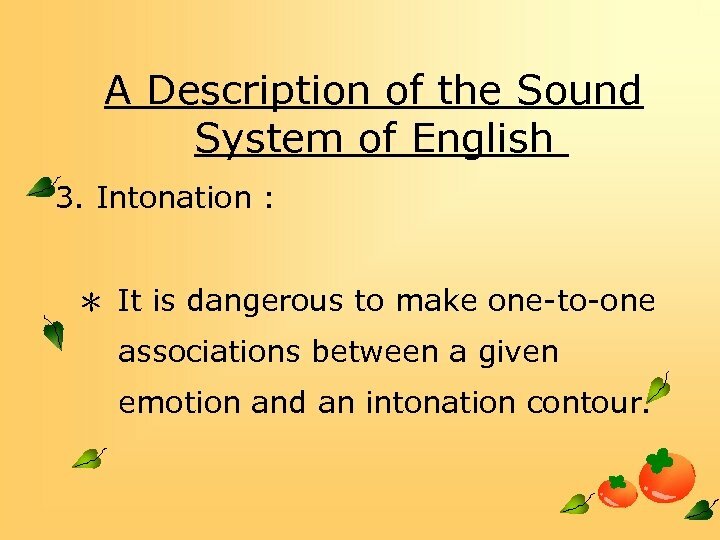 Intonation : ＊ It is dangerous to make one-to-one associations between a given emotion and an intonation contour. 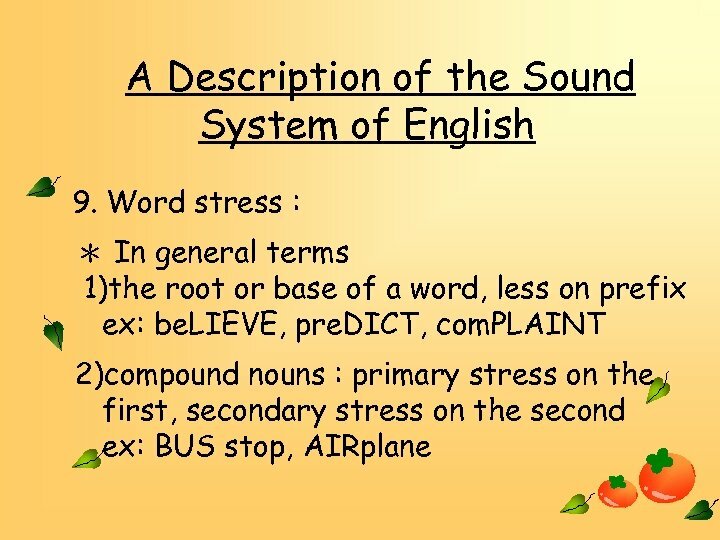 A Description of the Sound System of English 4. 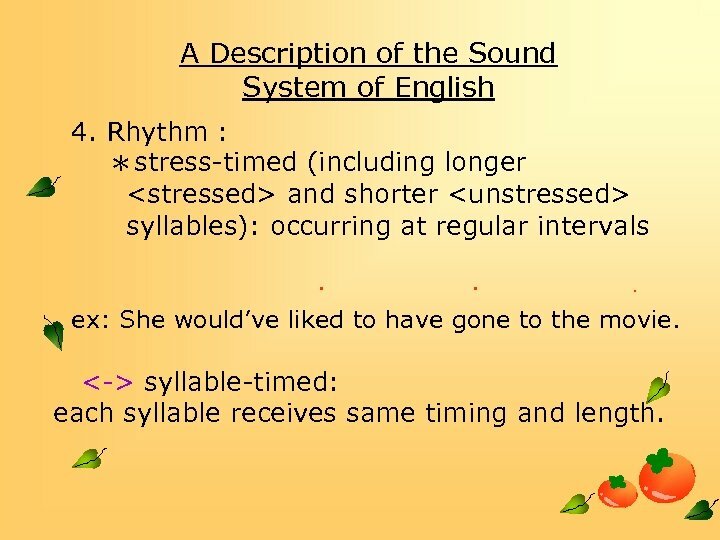 Rhythm : ＊stress-timed (including longer and shorter syllables): occurring at regular intervals ． ． ． ex: She would’ve liked to have gone to the movie. <-> syllable-timed: each syllable receives same timing and length. 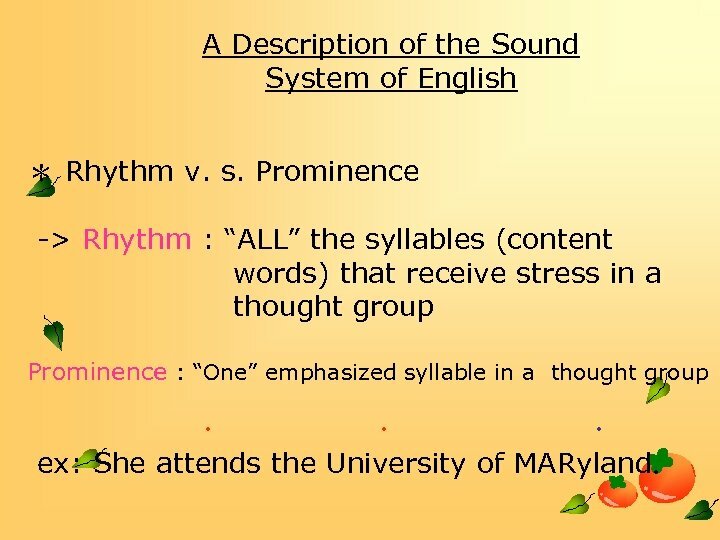 A Description of the Sound System of English ＊ Rhythm v. s. Prominence -> Rhythm : “ALL” the syllables (content words) that receive stress in a thought group Prominence : “One” emphasized syllable in a thought group ． ． ． ex: She attends the University of MARyland. 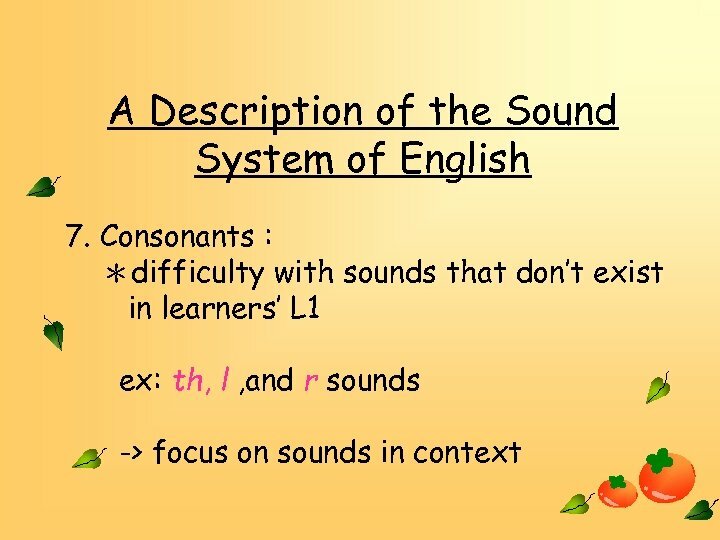 A Description of the Sound System of English 7. 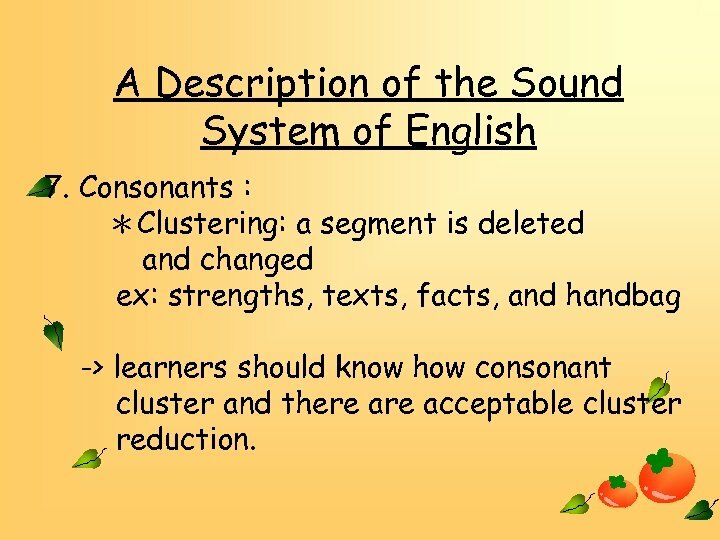 Consonants : ＊Clustering: a segment is deleted and changed ex: strengths, texts, facts, and handbag -> learners should know how consonant cluster and there acceptable cluster reduction. 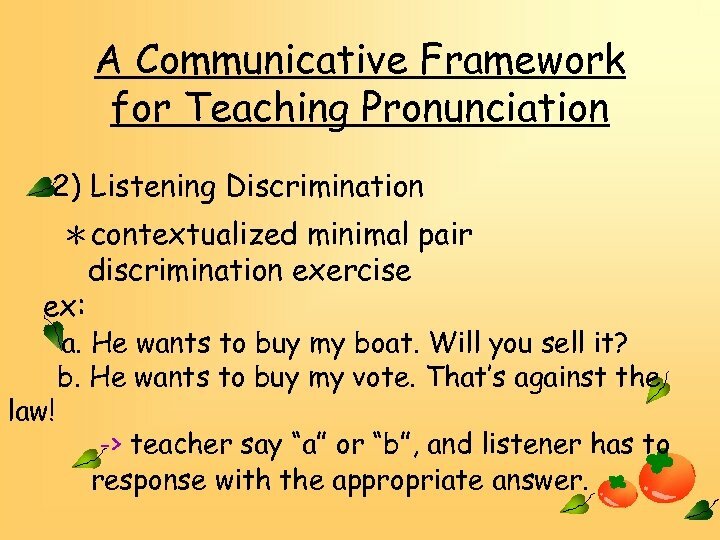 A Communicative Framework for Teaching Pronunciation 2) Listening Discrimination ＊contextualized minimal pair discrimination exercise ex: law! a. He wants to buy my boat. Will you sell it? b. He wants to buy my vote. 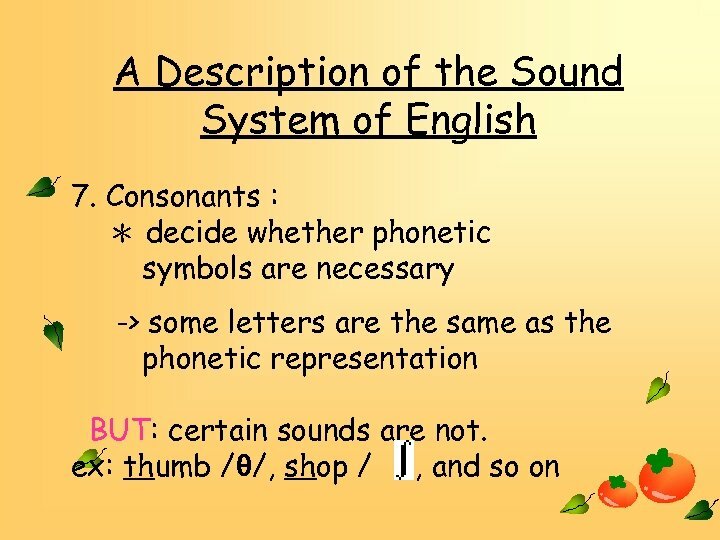 That’s against the -> teacher say “a” or “b”, and listener has to response with the appropriate answer. 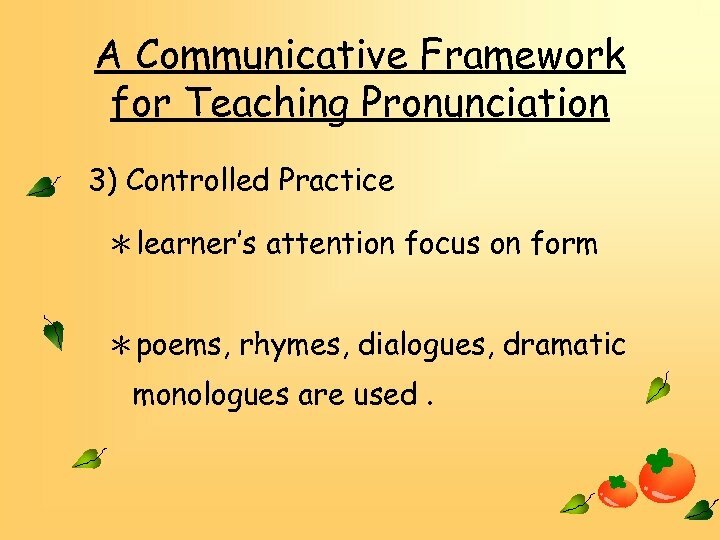 A Communicative Framework for Teaching Pronunciation 3) Controlled Practice ＊learner’s attention focus on form ＊poems, rhymes, dialogues, dramatic monologues are used. 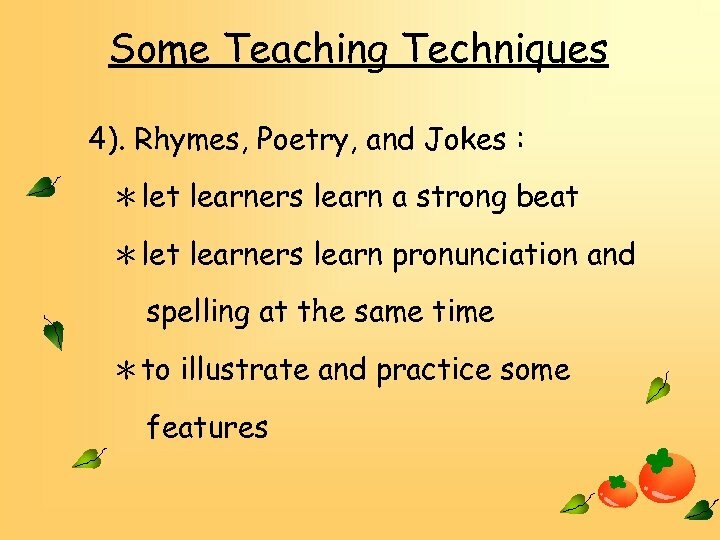 Some Teaching Techniques 1). 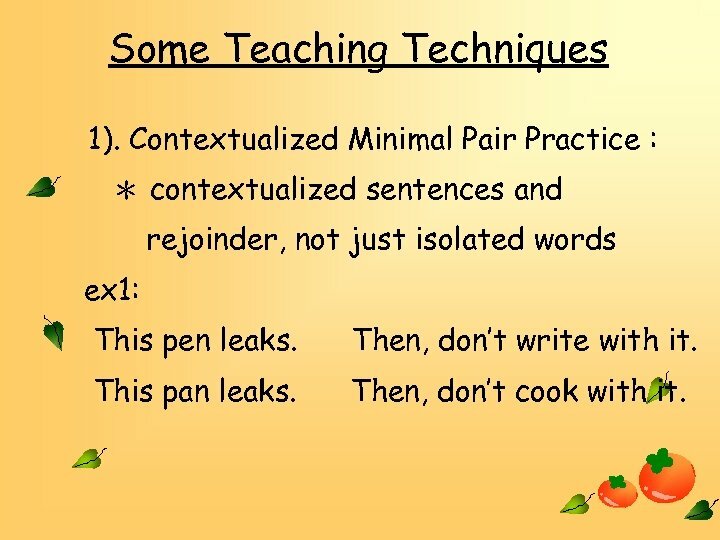 Contextualized Minimal Pair Practice : ＊ contextualized sentences and rejoinder, not just isolated words ex 1: This pen leaks. Then, don’t write with it. This pan leaks. Then, don’t cook with it. Assessment 2. 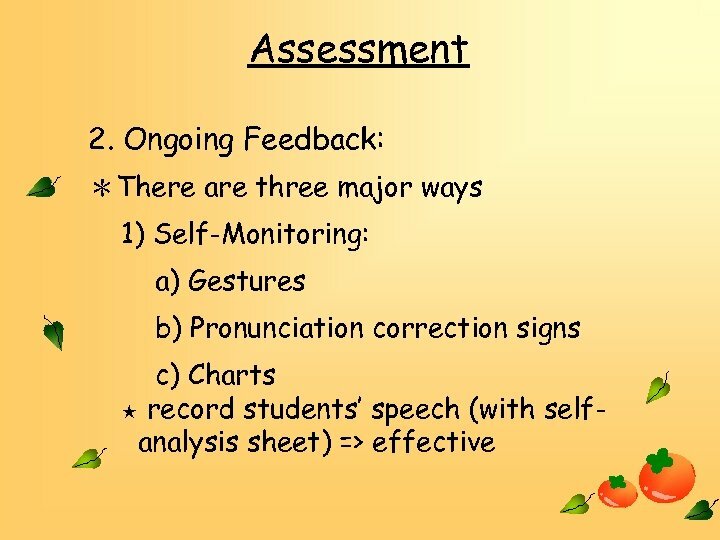 Ongoing Feedback: ＊gives learners’ progress & points out where need to improve. 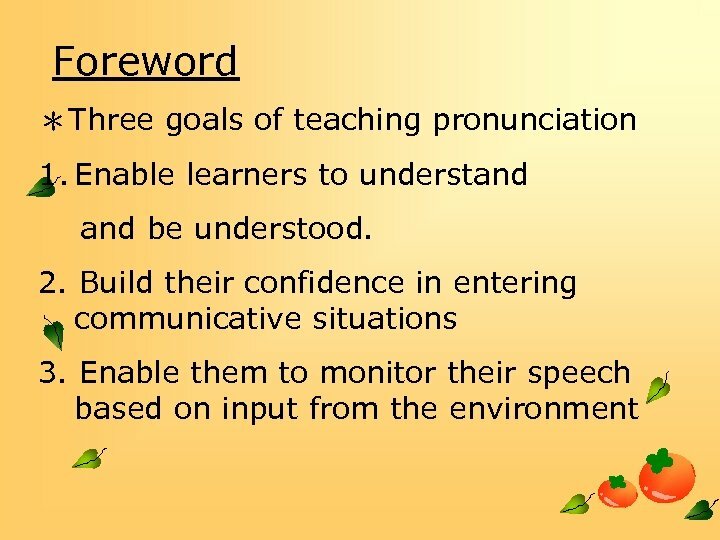 ＊There are three major ways 1) Self-Monitoring: ★ guide learners to self-correct by mentioning error silently. 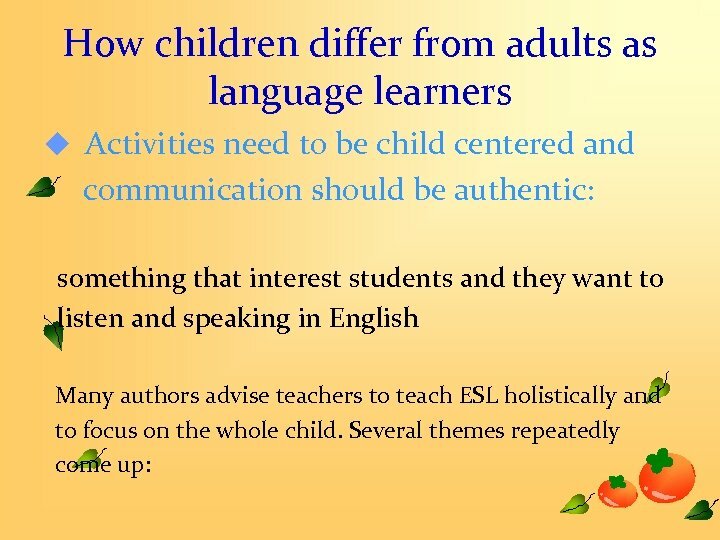 Introduction Child second language learners could differ from adults. 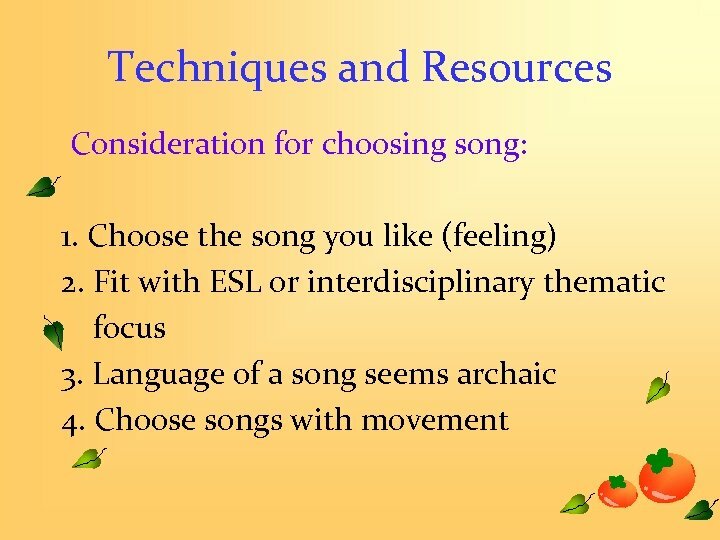 Consider these anecdotes: Ø Repeating: children preferred to sing same song over and over again. 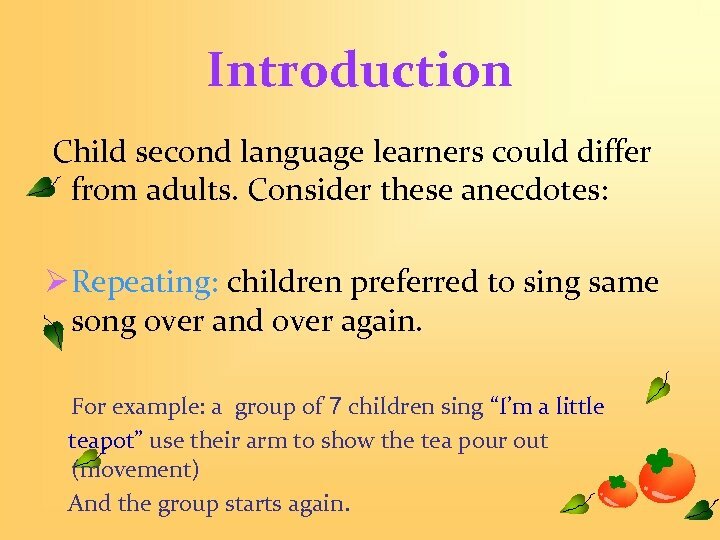 For example: a group of 7 children sing “I’m a little teapot” use their arm to show the tea pour out (movement) And the group starts again. 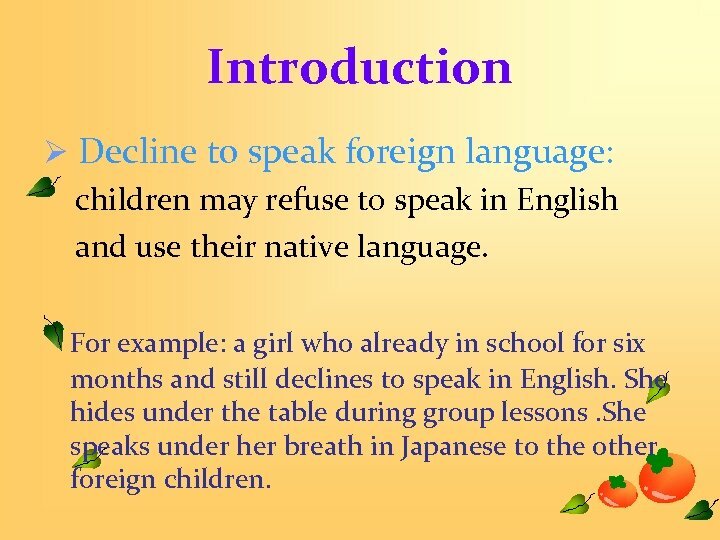 Introduction Ø Decline to speak foreign language: children may refuse to speak in English and use their native language. For example: a girl who already in school for six months and still declines to speak in English. She hides under the table during group lessons. She speaks under her breath in Japanese to the other foreign children. 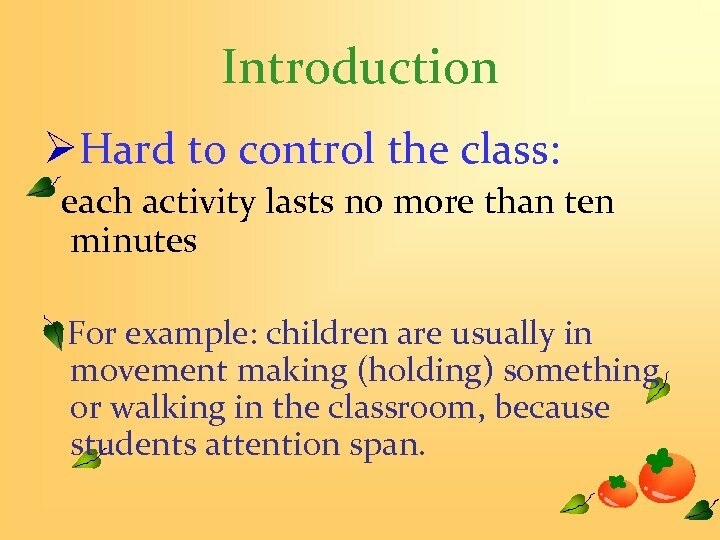 Introduction ØHard to control the class: each activity lasts no more than ten minutes For example: children are usually in movement making (holding) something or walking in the classroom, because students attention span. 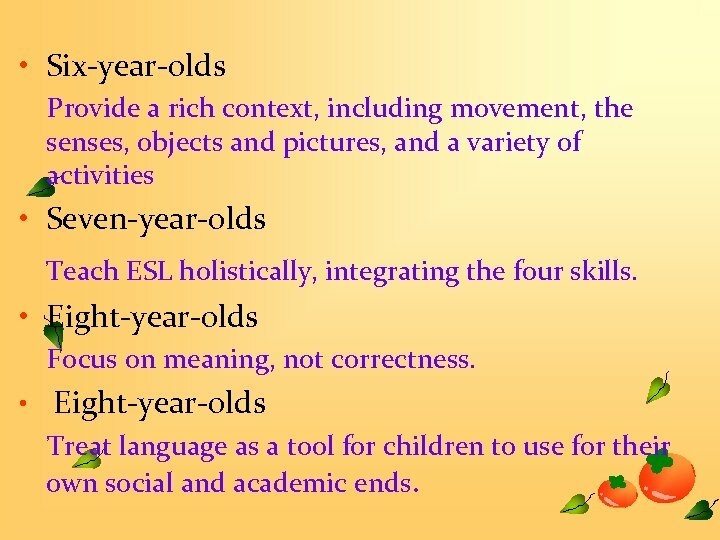 • Six-year-olds Provide a rich context, including movement, the senses, objects and pictures, and a variety of activities • Seven-year-olds Teach ESL holistically, integrating the four skills. • Eight-year-olds Focus on meaning, not correctness. 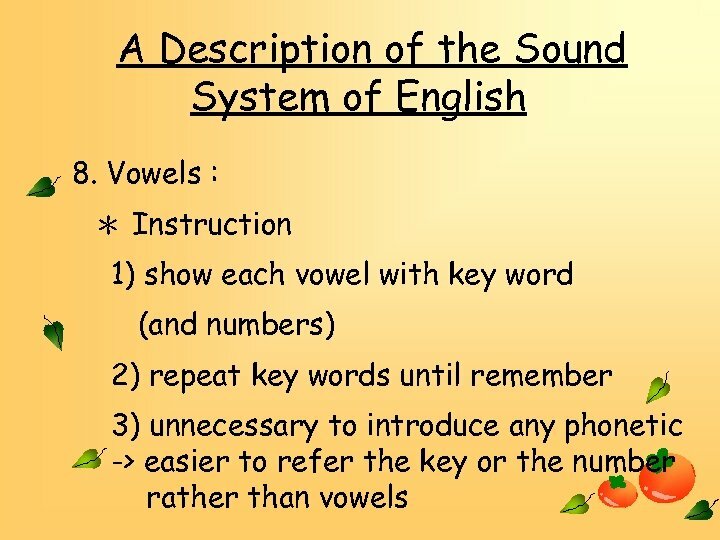 • Eight-year-olds Treat language as a tool for children to use for their own social and academic ends. 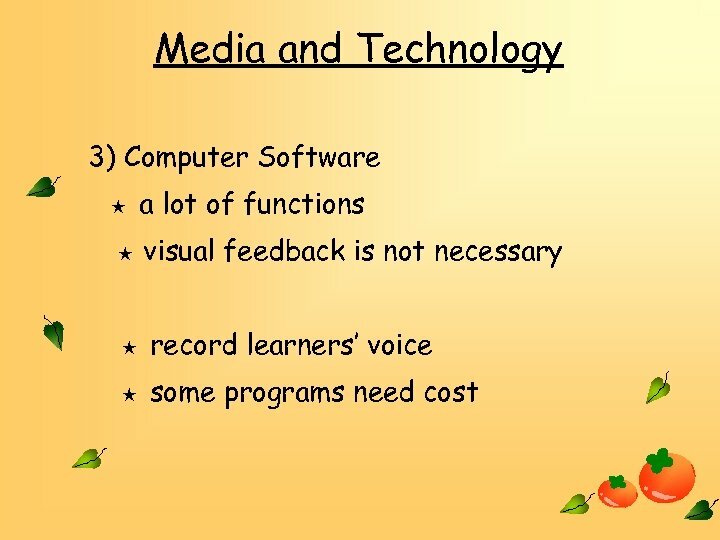 • Eleven-year-olds Treat learners appropriately in light of their age and interest. 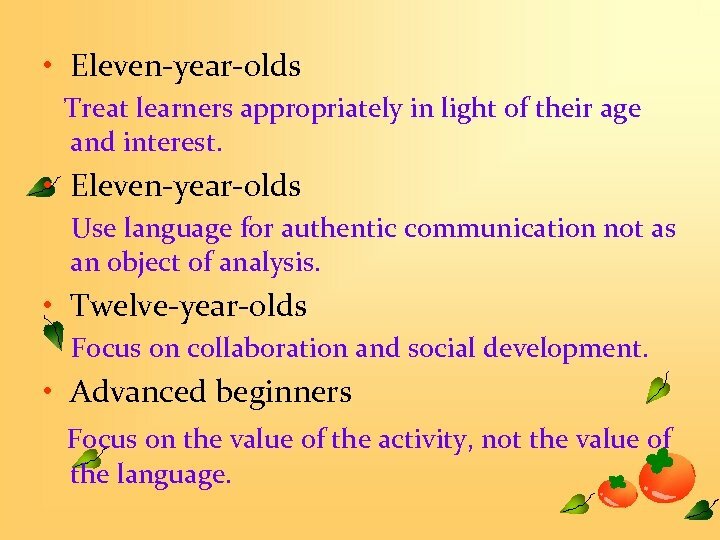 • Eleven-year-olds Use language for authentic communication not as an object of analysis. • Twelve-year-olds Focus on collaboration and social development. 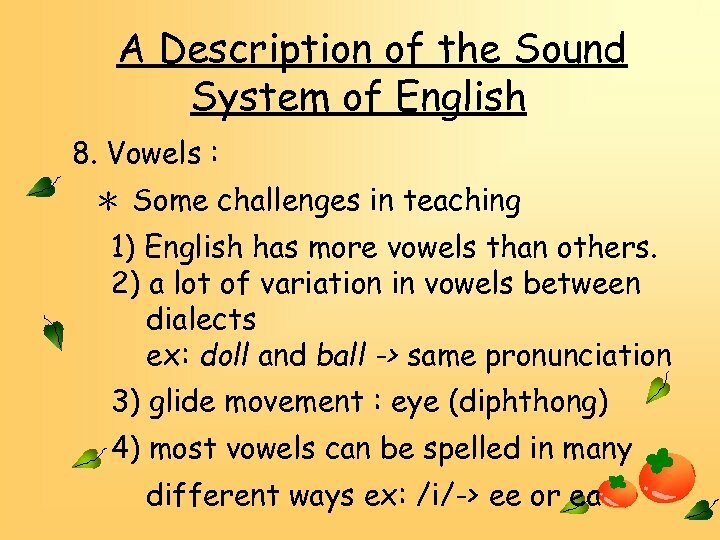 • Advanced beginners Focus on the value of the activity, not the value of the language. 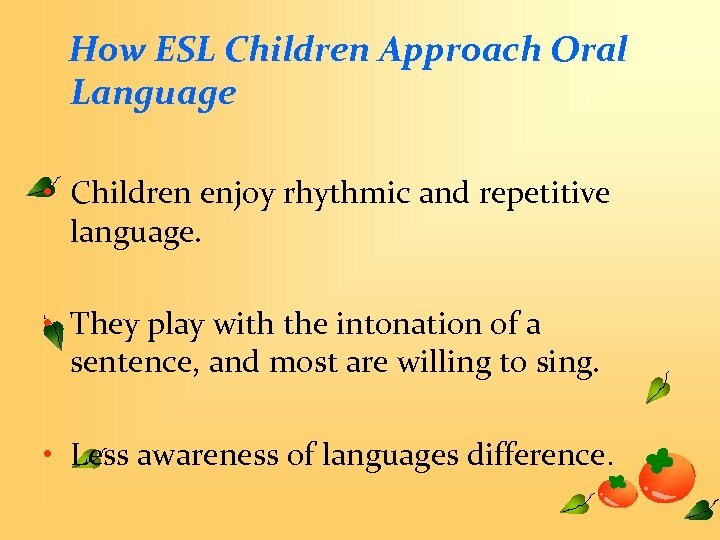 How ESL Children Approach Oral Language • Children enjoy rhythmic and repetitive language. • They play with the intonation of a sentence, and most are willing to sing. 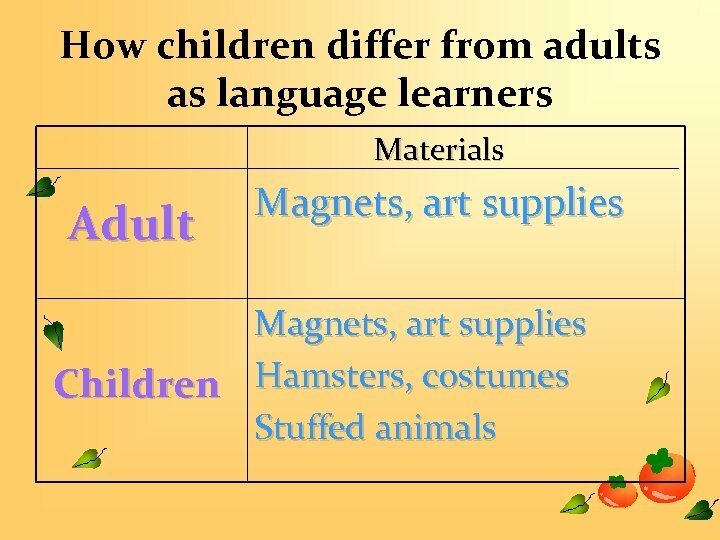 • Less awareness of languages difference. Techniques and Resources 1. 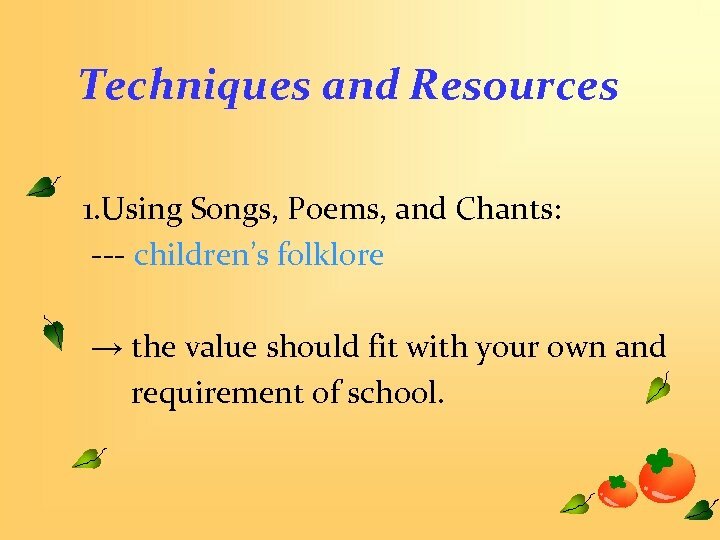 Using Songs, Poems, and Chants: --- children’s folklore → the value should fit with your own and requirement of school. Techniques and Resources 1. 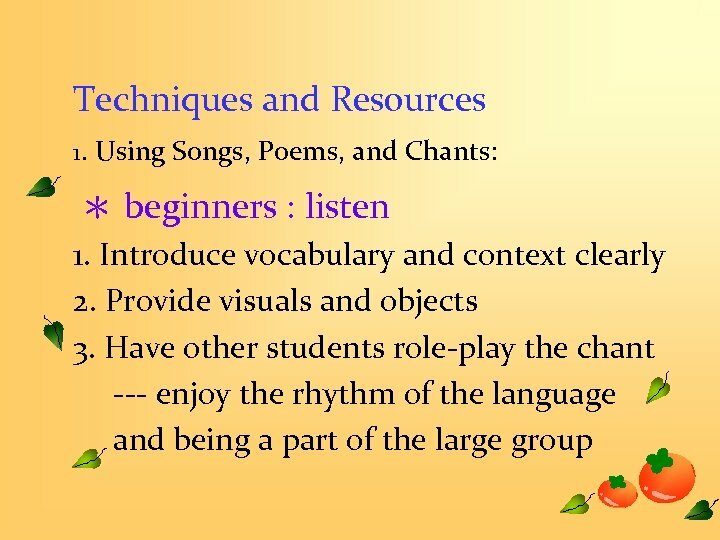 Using Songs, Poems, and Chants The step of teaching: 1. 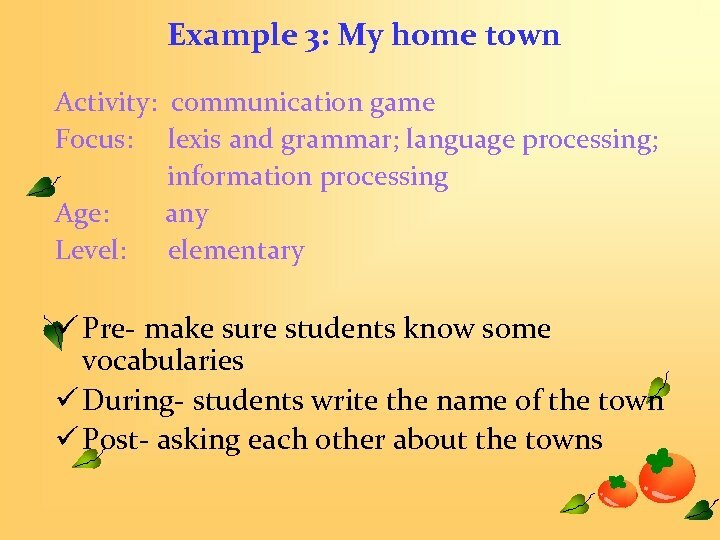 Familiarize the children with the vocabulary and content by using pictures and objects. 2. Recite the poem or chant. Sing or play a tape of the song. 6. 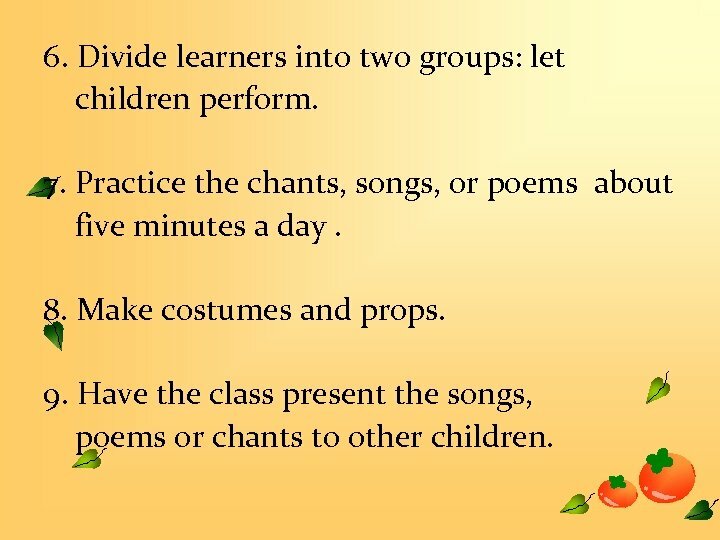 Divide learners into two groups: let children perform. 7. 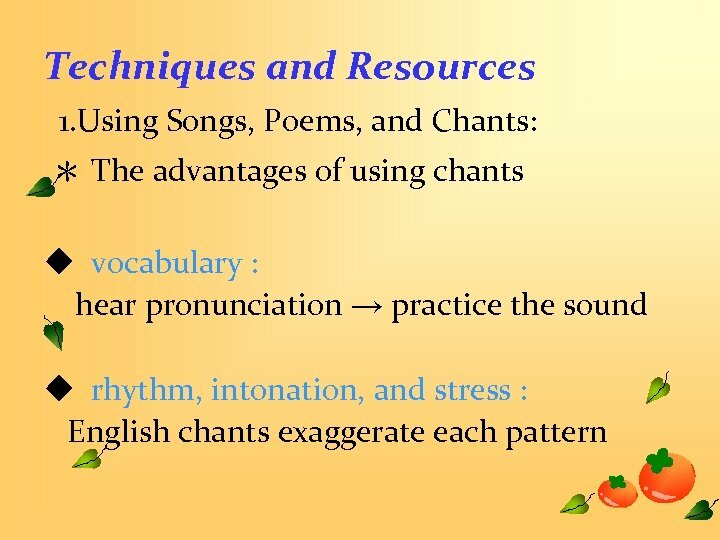 Practice the chants, songs, or poems about five minutes a day. 8. Make costumes and props. 9. 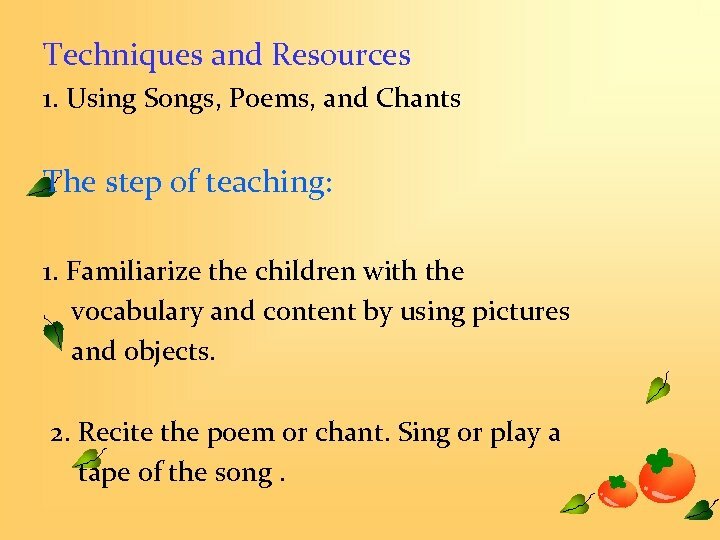 Have the class present the songs, poems or chants to other children. 3. 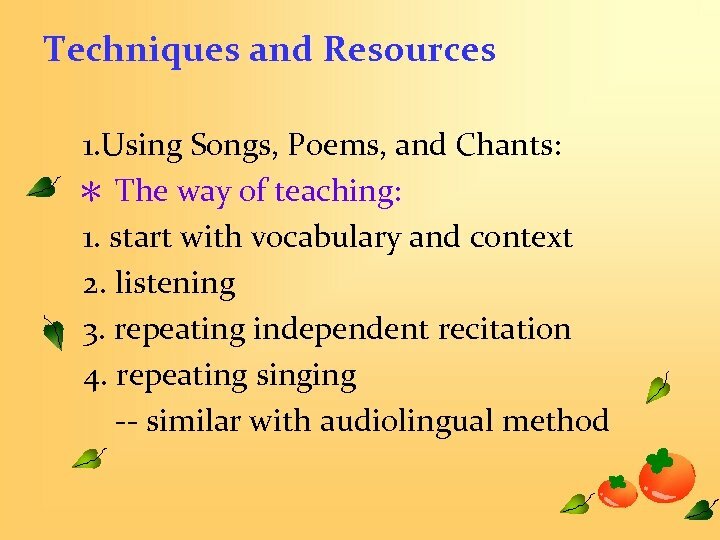 Recite (sing, play) a line at a time, and learner repeat after you. 4. Recite the whole text with the class. 5. 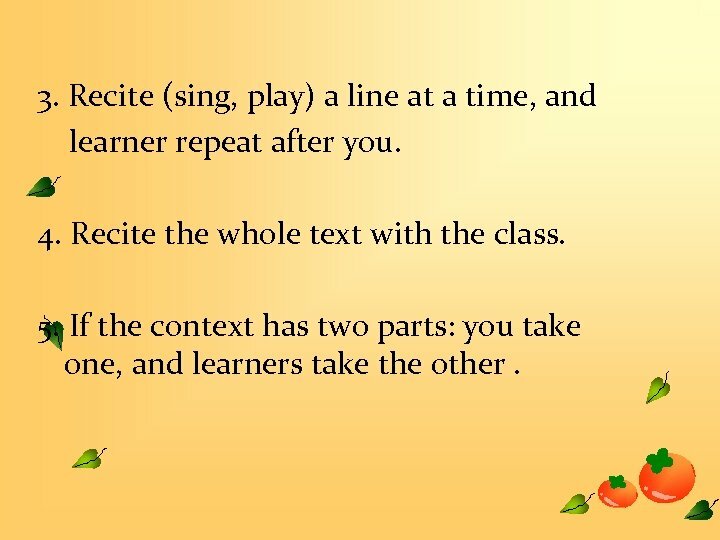 If the context has two parts: you take one, and learners take the other. Techniques and Resources 3. 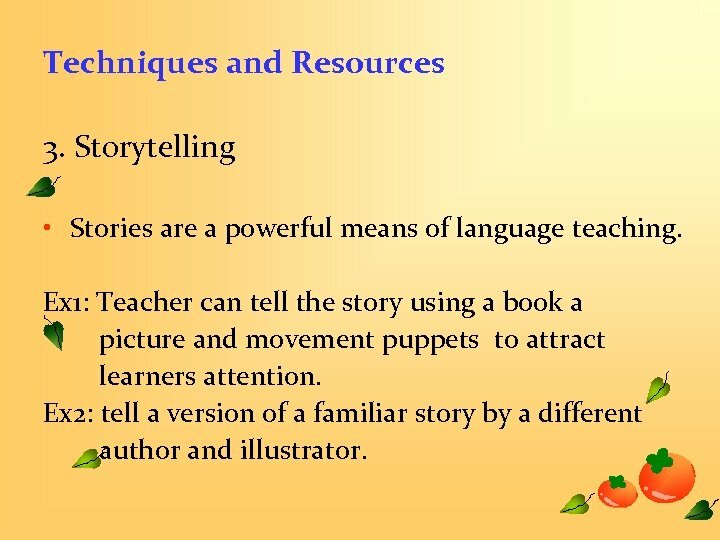 Storytelling • Stories are a powerful means of language teaching. 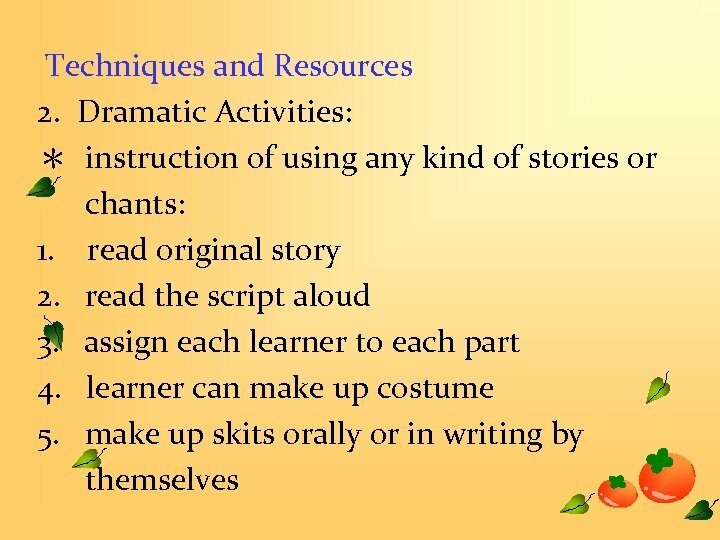 Ex 1: Teacher can tell the story using a book a picture and movement puppets to attract learners attention. Ex 2: tell a version of a familiar story by a different author and illustrator. Techniques and Resources 3. 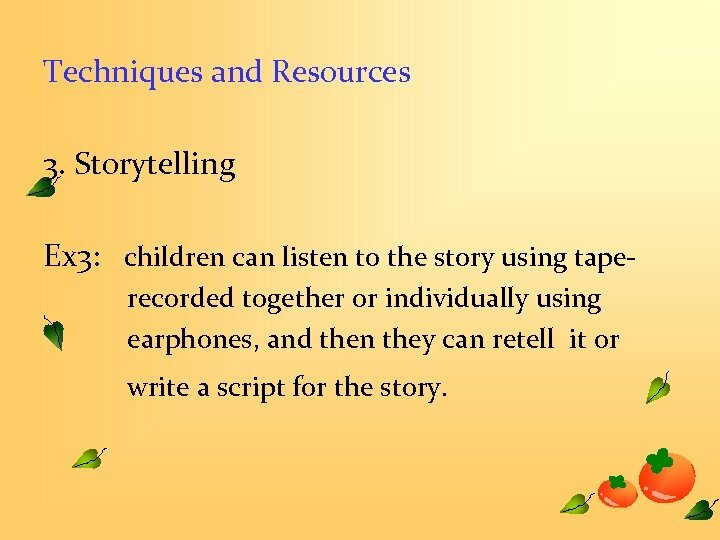 Storytelling Ex 3: children can listen to the story using taperecorded together or individually using earphones, and then they can retell it or write a script for the story. Techniques and Resources 4. 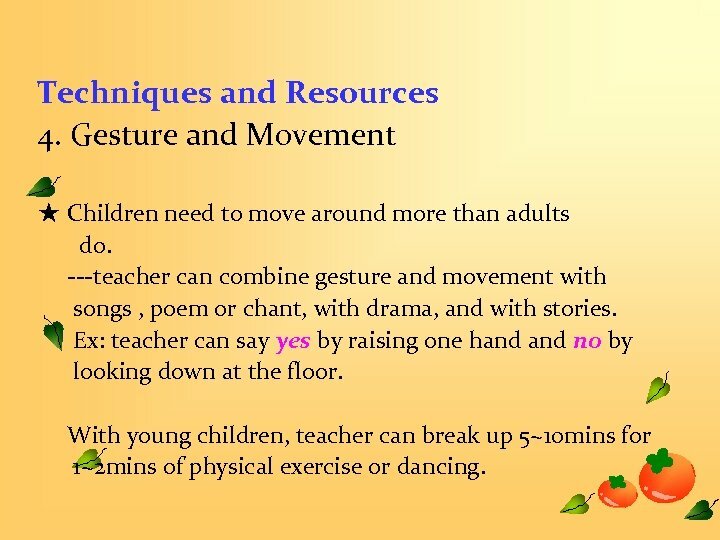 Gesture and Movement ★ Children need to move around more than adults do. 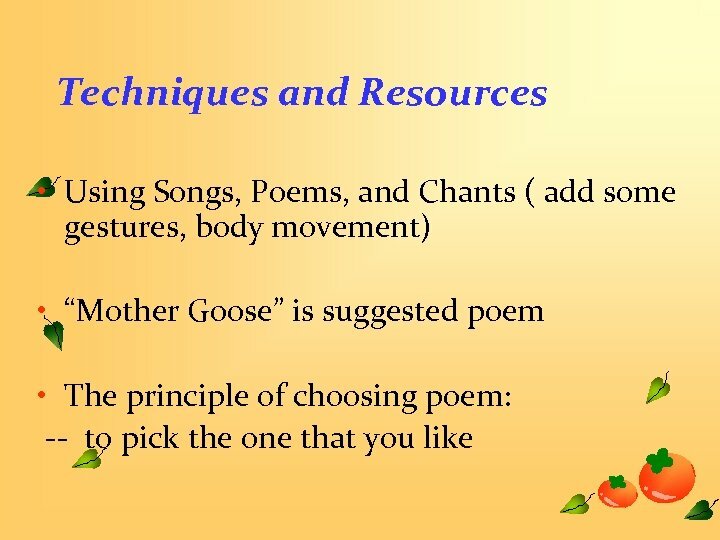 ---teacher can combine gesture and movement with songs , poem or chant, with drama, and with stories. Ex: teacher can say yes by raising one hand no by looking down at the floor. With young children, teacher can break up 5~10 mins for 1~2 mins of physical exercise or dancing. 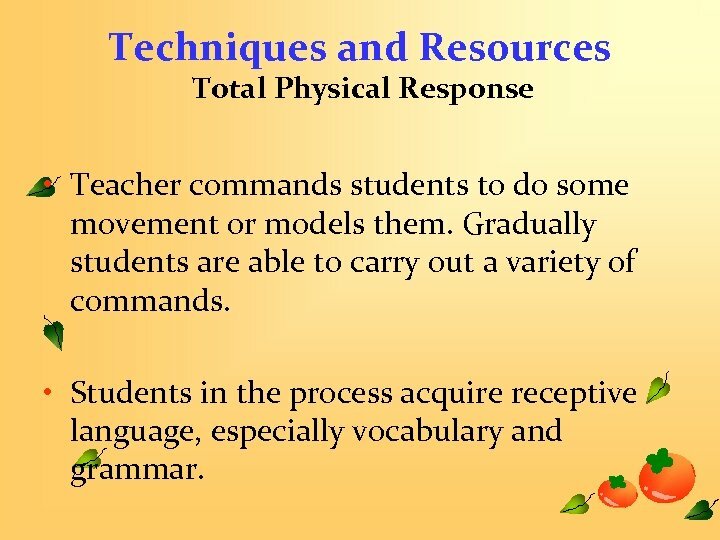 Techniques and Resources Total Physical Response • Teacher commands students to do some movement or models them. Gradually students are able to carry out a variety of commands. 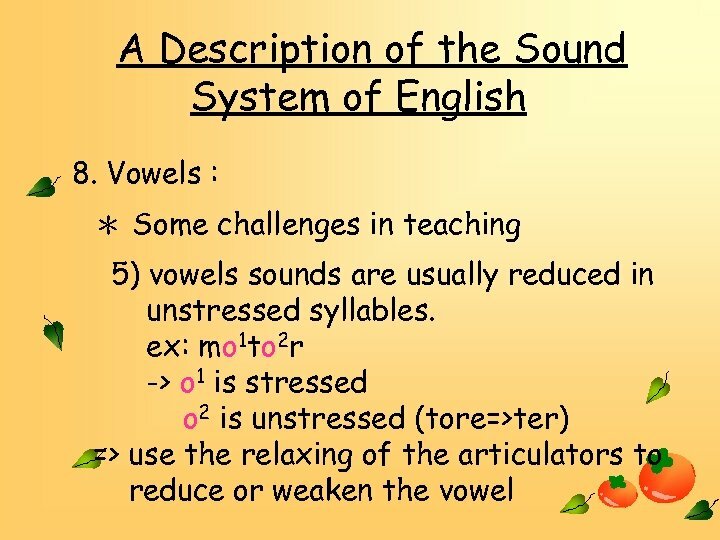 • Students in the process acquire receptive language, especially vocabulary and grammar. 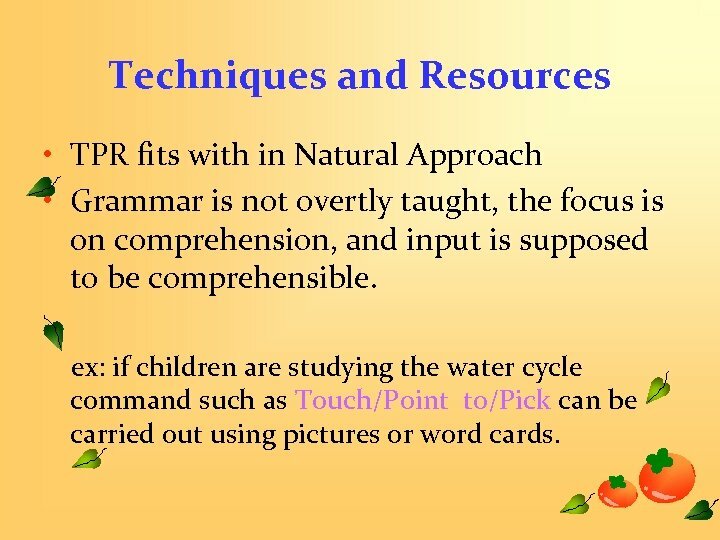 Techniques and Resources • TPR fits with in Natural Approach • Grammar is not overtly taught, the focus is on comprehension, and input is supposed to be comprehensible. ex: if children are studying the water cycle command such as Touch/Point to/Pick can be carried out using pictures or word cards. 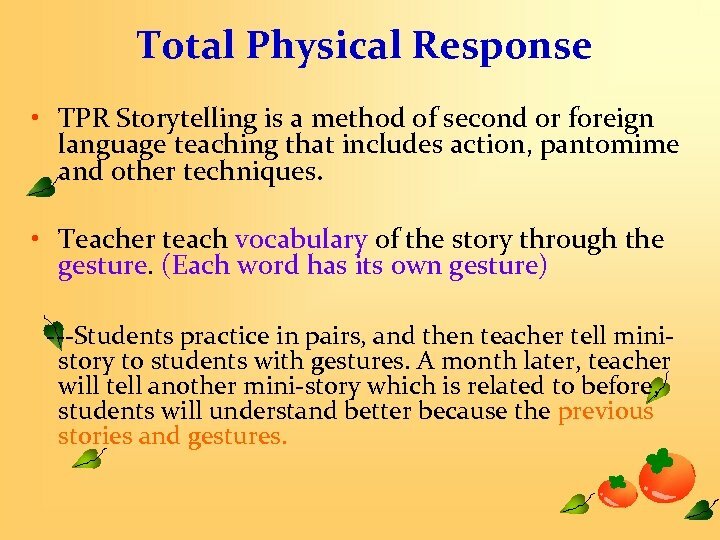 Total Physical Response • TPR Storytelling is a method of second or foreign language teaching that includes action, pantomime and other techniques. 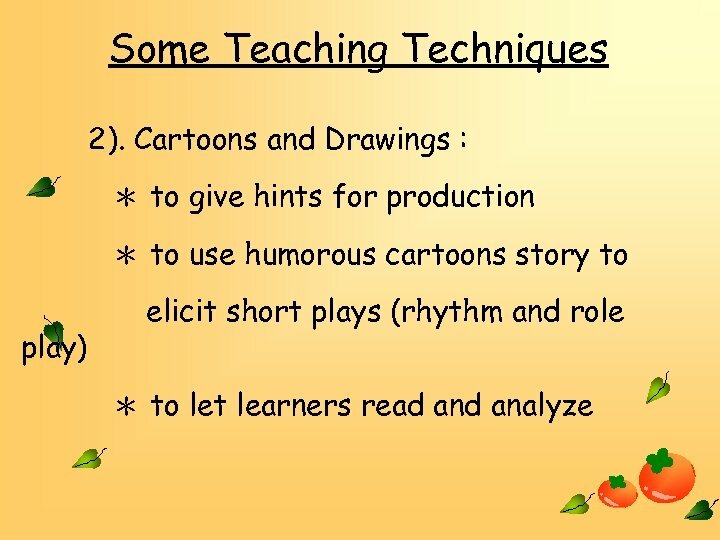 • Teacher teach vocabulary of the story through the gesture. 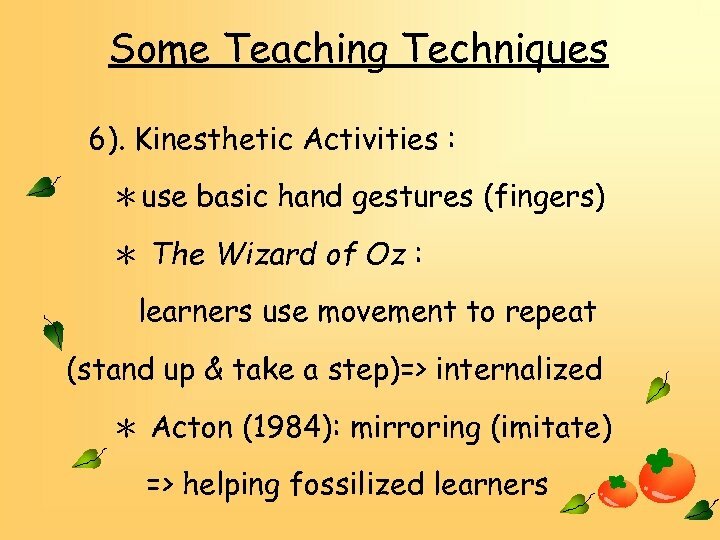 (Each word has its own gesture) ---Students practice in pairs, and then teacher tell ministory to students with gestures. A month later, teacher will tell another mini-story which is related to before, students will understand better because the previous stories and gestures. 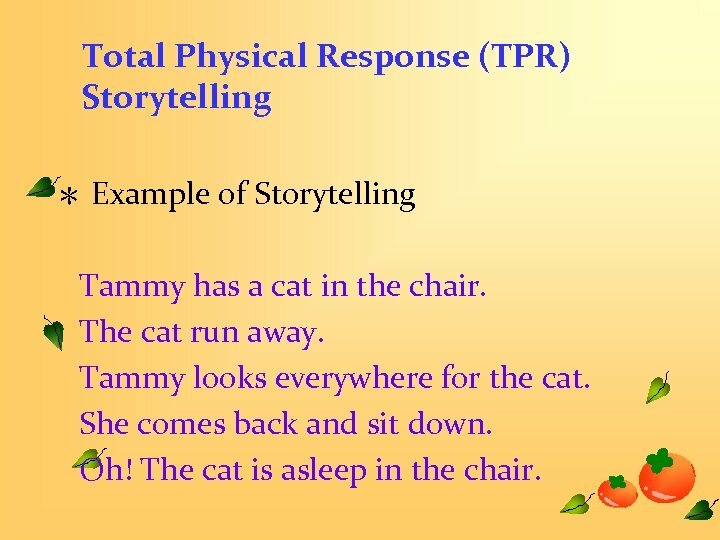 Total Physical Response (TPR) Storytelling ＊ Example of Storytelling Tammy has a cat in the chair. The cat run away. Tammy looks everywhere for the cat. She comes back and sit down. Oh! The cat is asleep in the chair. 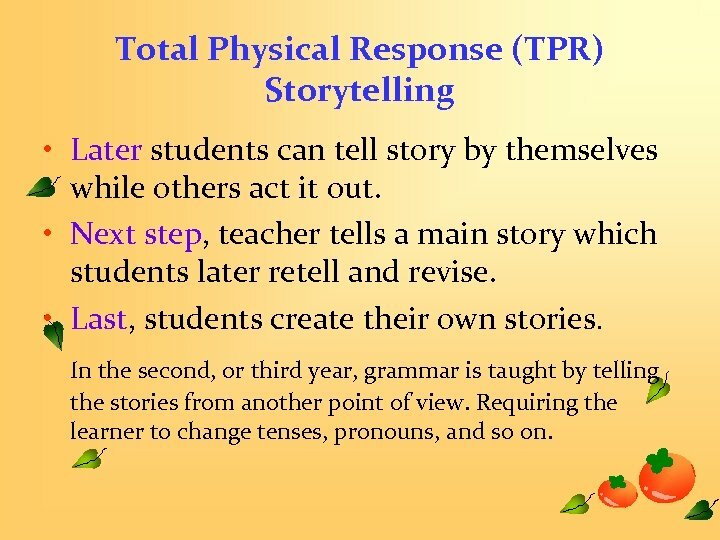 Total Physical Response (TPR) Storytelling • Later students can tell story by themselves while others act it out. 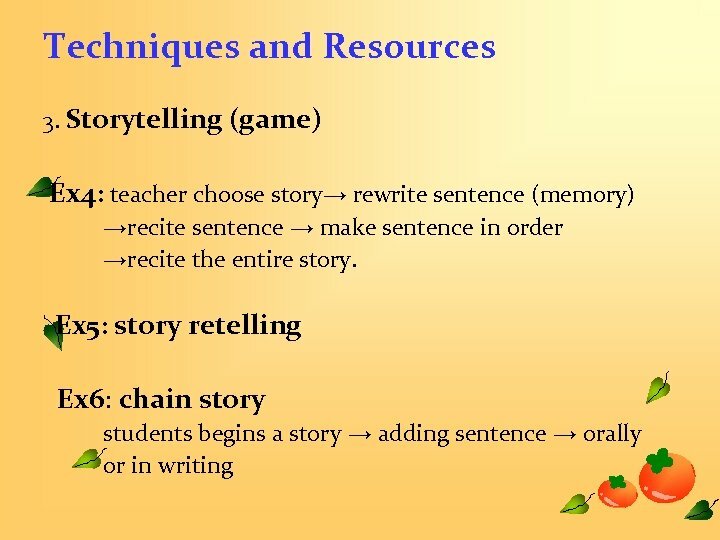 • Next step, teacher tells a main story which students later retell and revise. 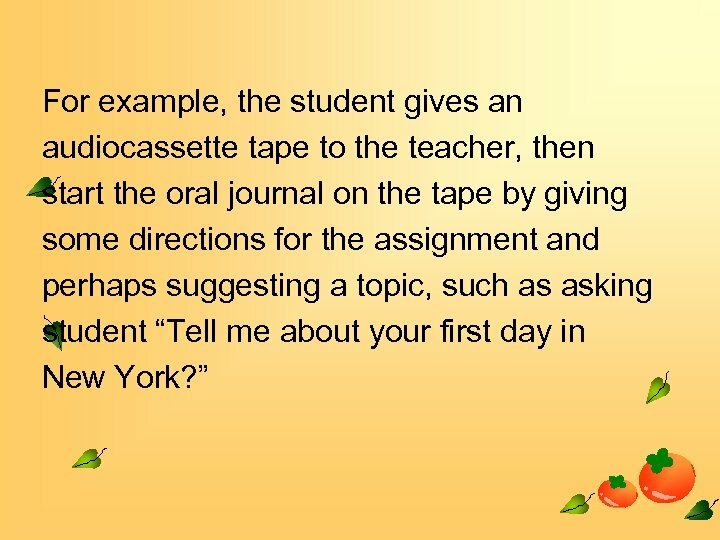 • Last, students create their own stories. 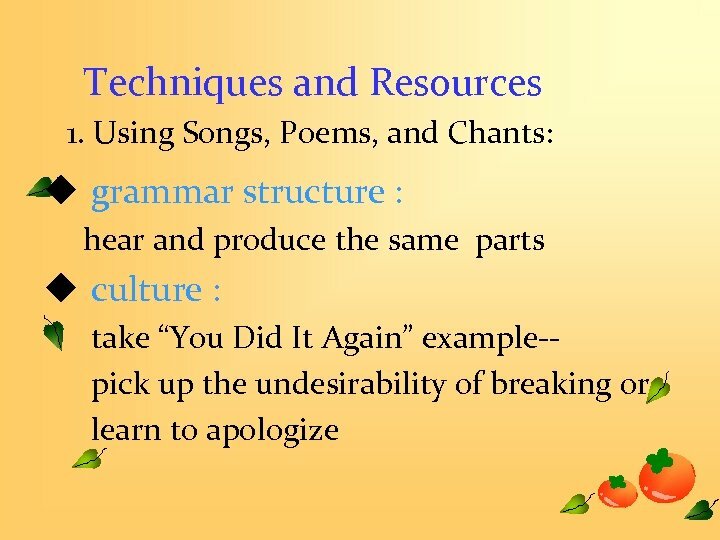 In the second, or third year, grammar is taught by telling the stories from another point of view. Requiring the learner to change tenses, pronouns, and so on. 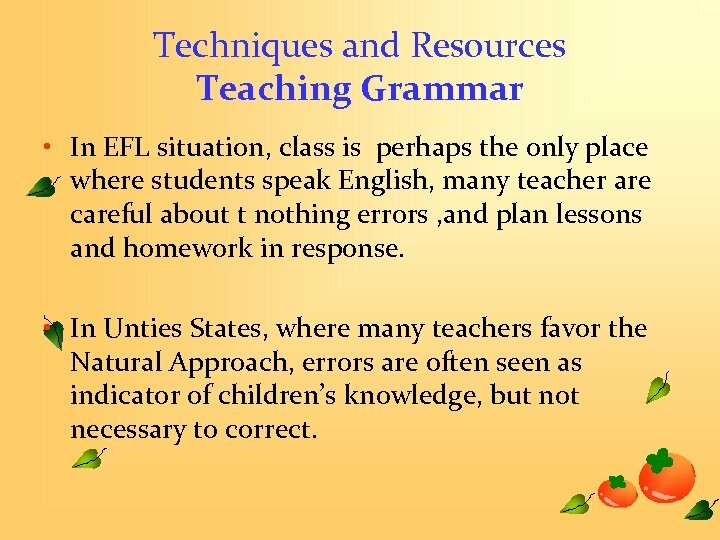 Techniques and Resources Teaching Grammar • In EFL situation, class is perhaps the only place where students speak English, many teacher are careful about t nothing errors , and plan lessons and homework in response. 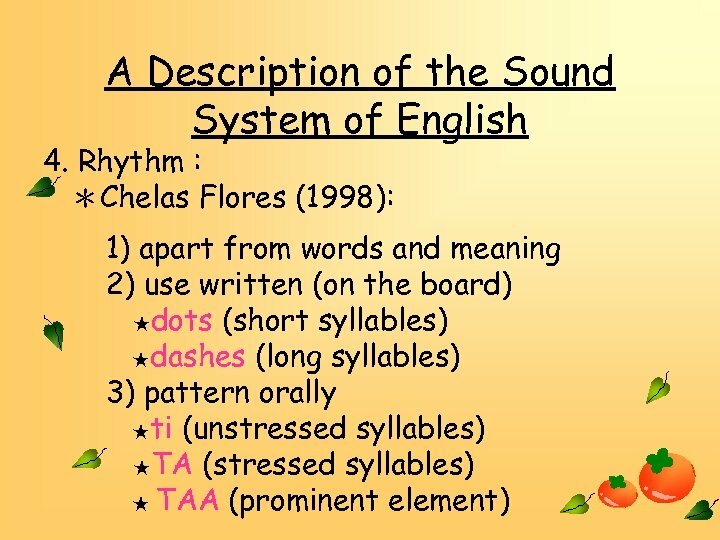 • In Unties States, where many teachers favor the Natural Approach, errors are often seen as indicator of children’s knowledge, but not necessary to correct. 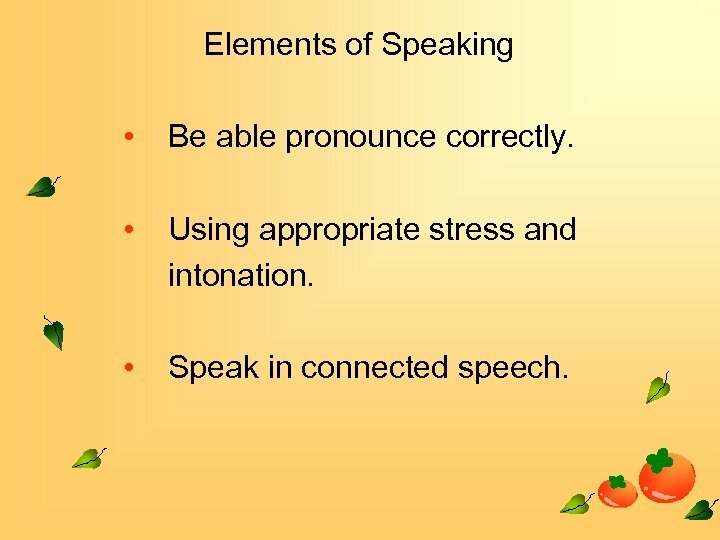 Elements of Speaking • Be able pronounce correctly. 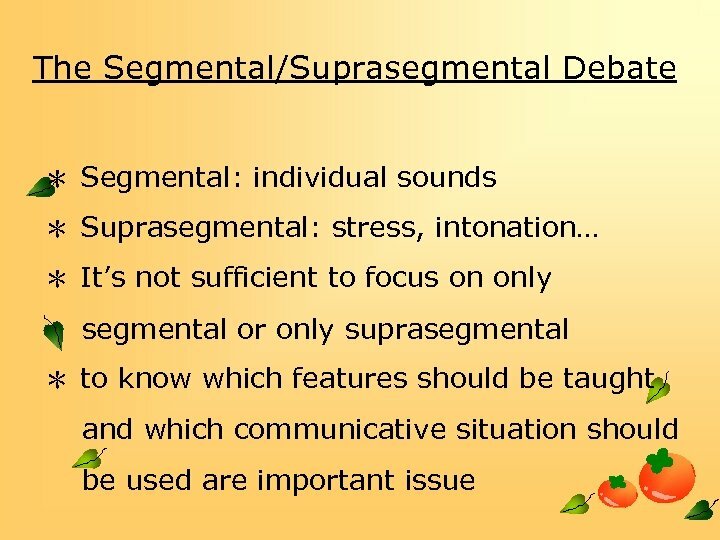 • Using appropriate stress and intonation. 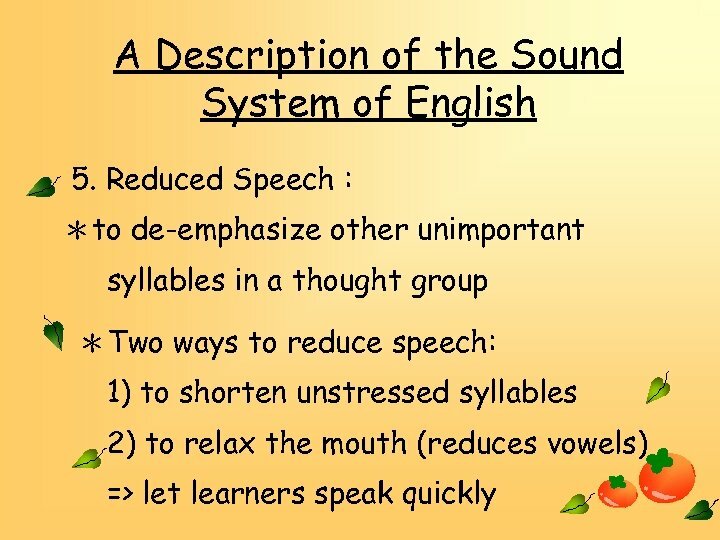 • Speak in connected speech. 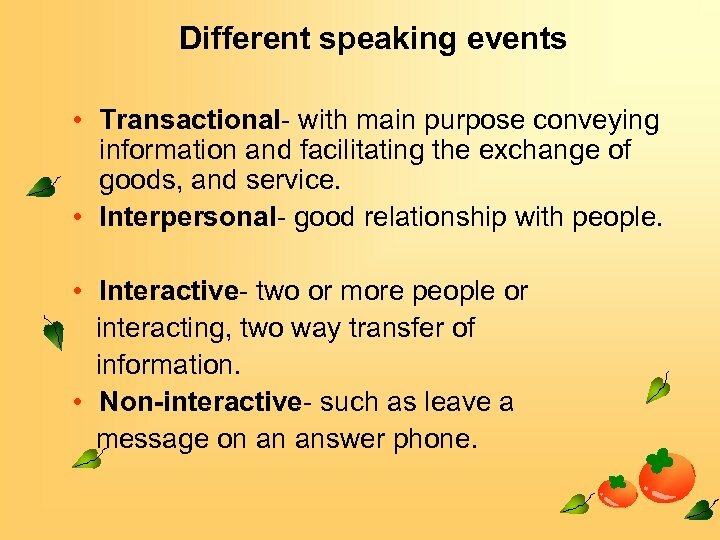 Different speaking events • Transactional- with main purpose conveying information and facilitating the exchange of goods, and service. • Interpersonal- good relationship with people. 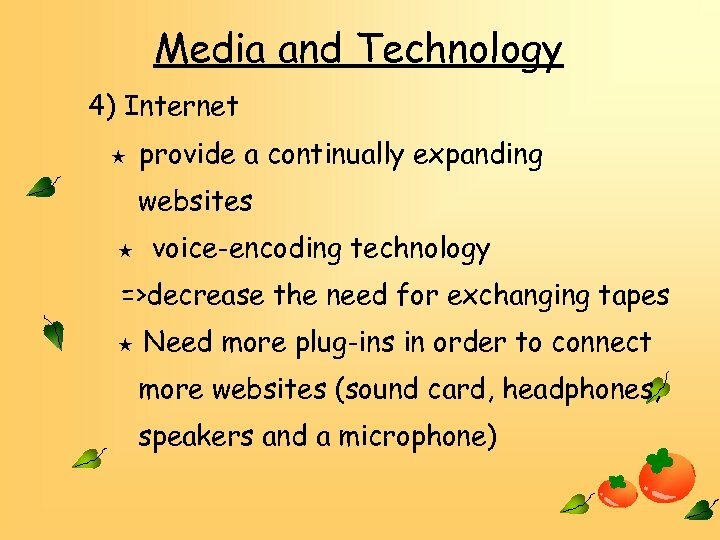 • Interactive- two or more people or interacting, two way transfer of information. • Non-interactive- such as leave a message on an answer phone. 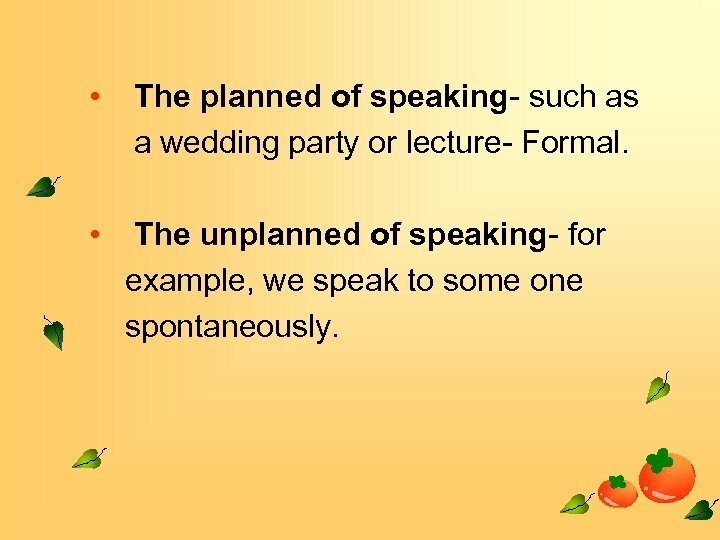 • The planned of speaking- such as a wedding party or lecture- Formal. 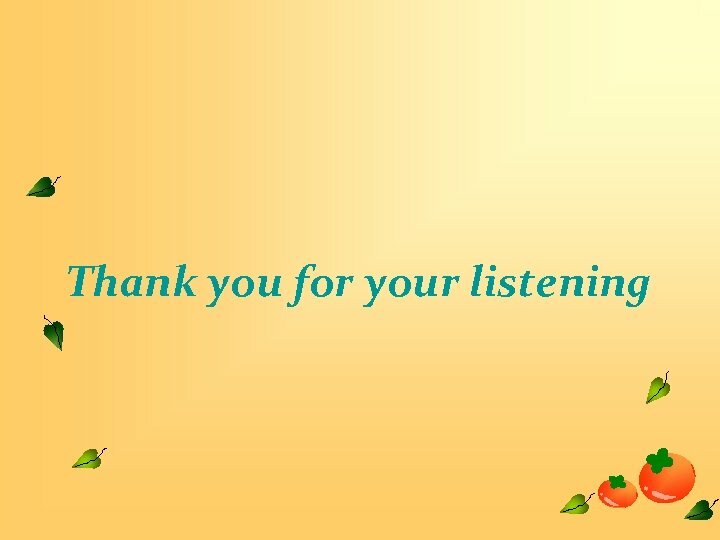 • The unplanned of speaking- for example, we speak to some one spontaneously. 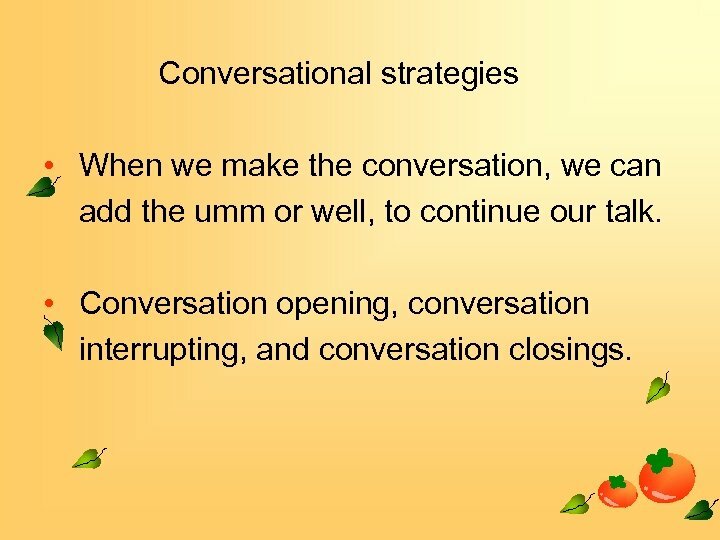 Conversational strategies • When we make the conversation, we can add the umm or well, to continue our talk. 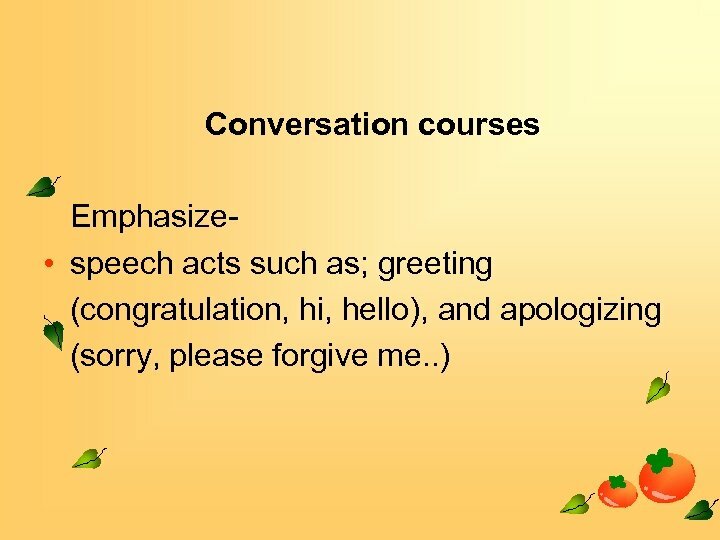 • Conversation opening, conversation interrupting, and conversation closings. 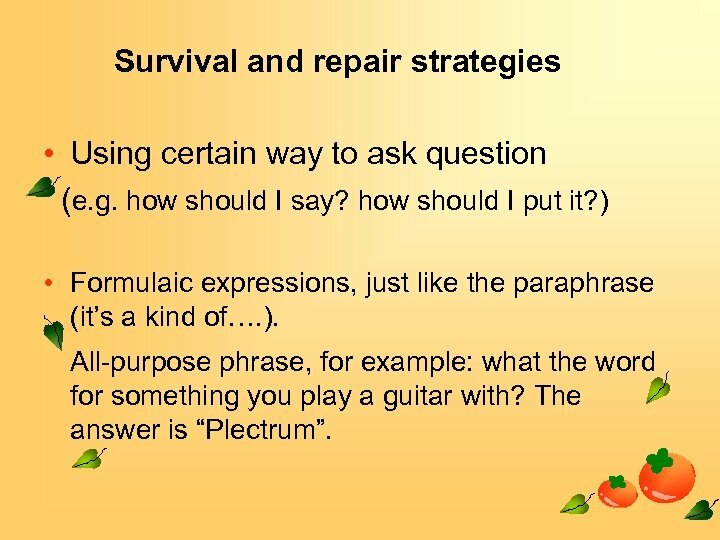 Survival and repair strategies • Using certain way to ask question (e. g. how should I say? how should I put it? ) 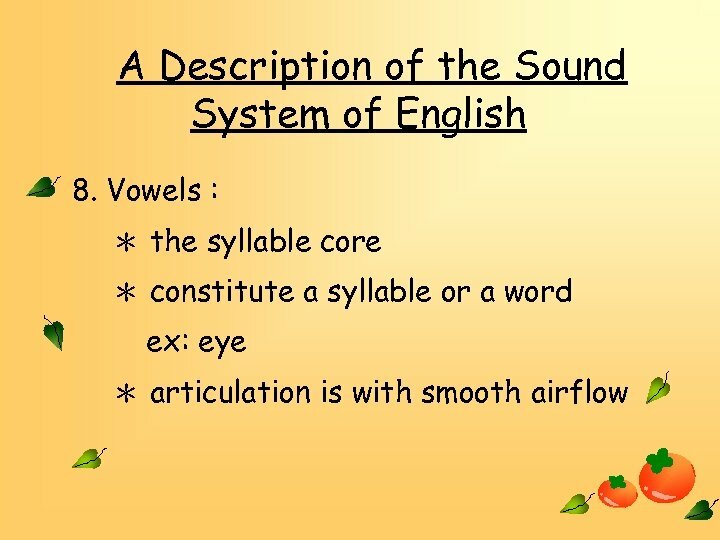 • Formulaic expressions, just like the paraphrase (it’s a kind of…. ). All-purpose phrase, for example: what the word for something you play a guitar with? The answer is “Plectrum”. 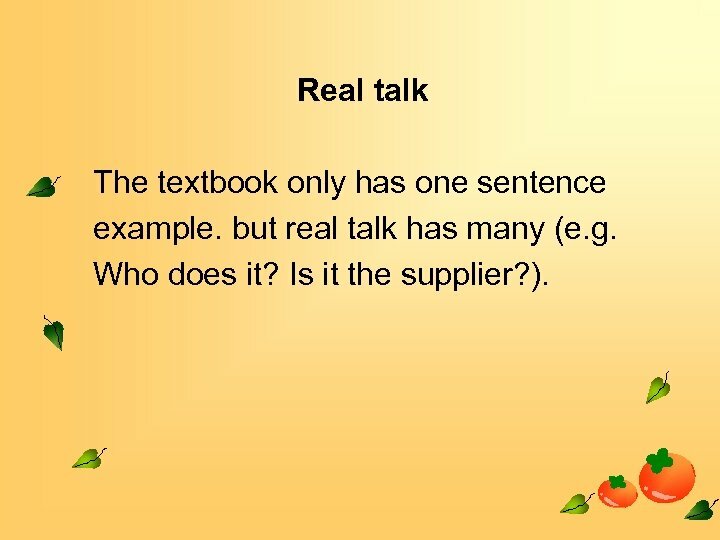 Real talk The textbook only has one sentence example. but real talk has many (e. g. Who does it? Is it the supplier? ). 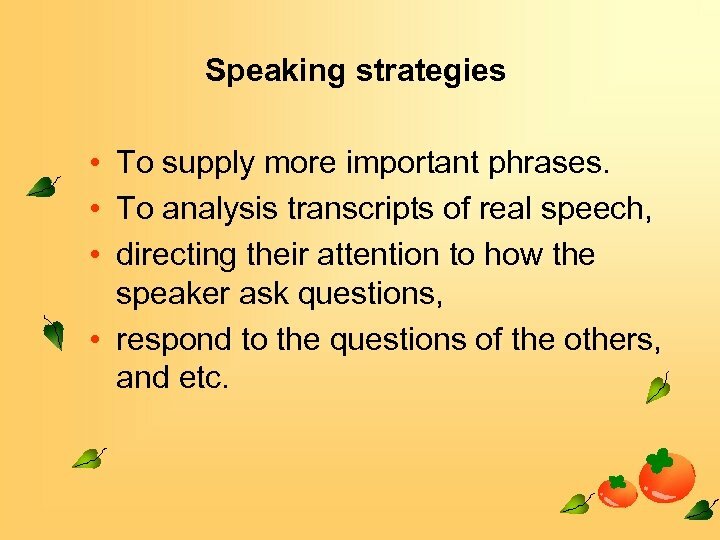 Speaking strategies • To supply more important phrases. 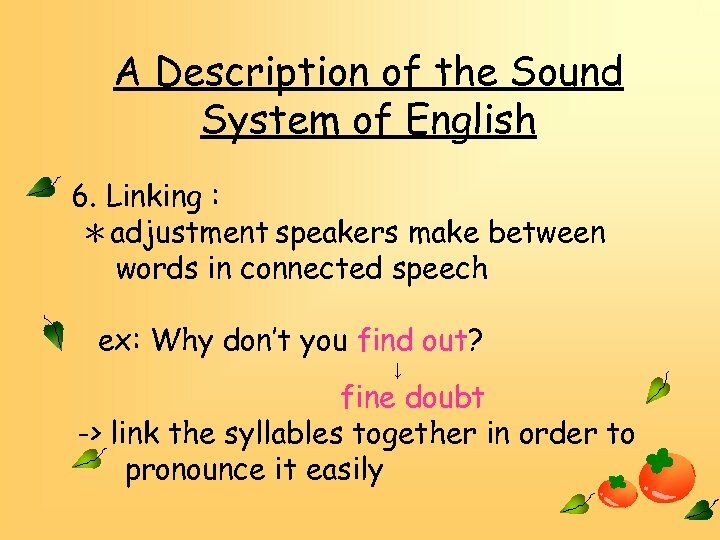 • To analysis transcripts of real speech, • directing their attention to how the speaker ask questions, • respond to the questions of the others, and etc. 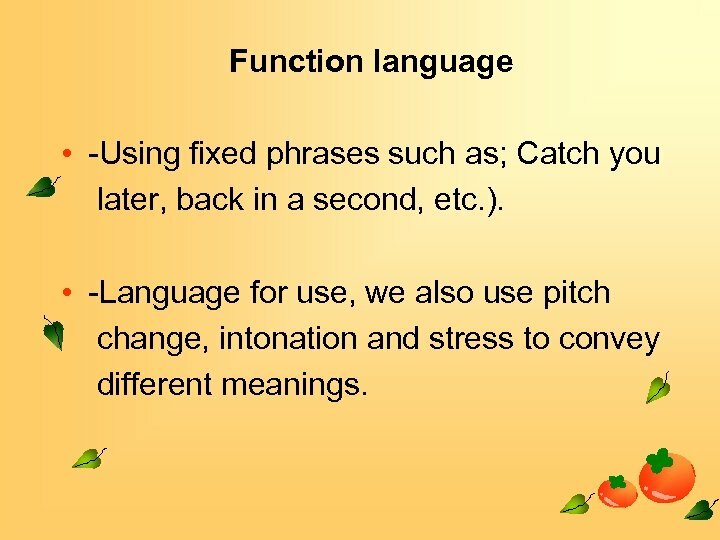 Function language • -Using fixed phrases such as; Catch you later, back in a second, etc. ). 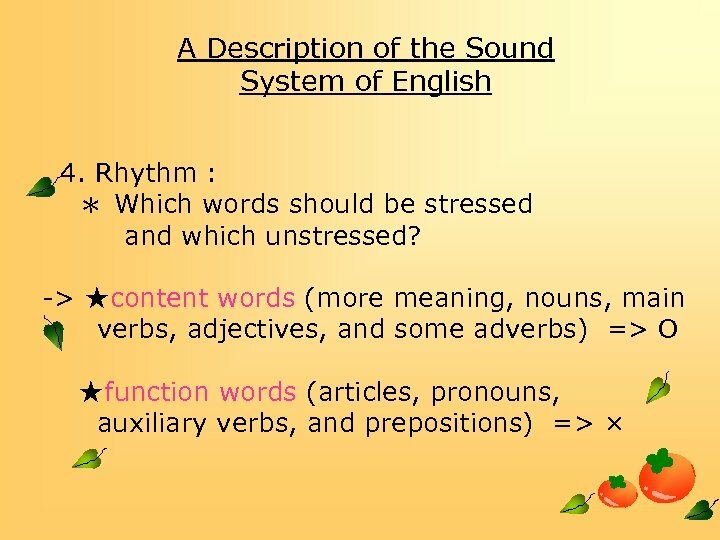 • -Language for use, we also use pitch change, intonation and stress to convey different meanings. 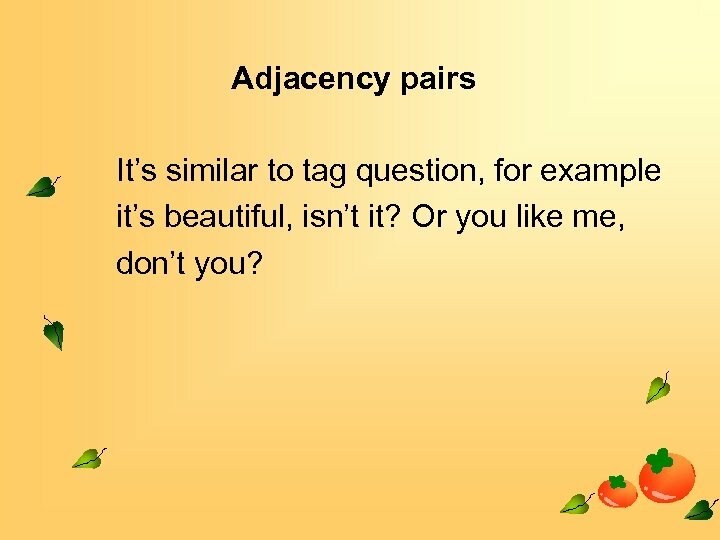 Adjacency pairs It’s similar to tag question, for example it’s beautiful, isn’t it? Or you like me, don’t you? 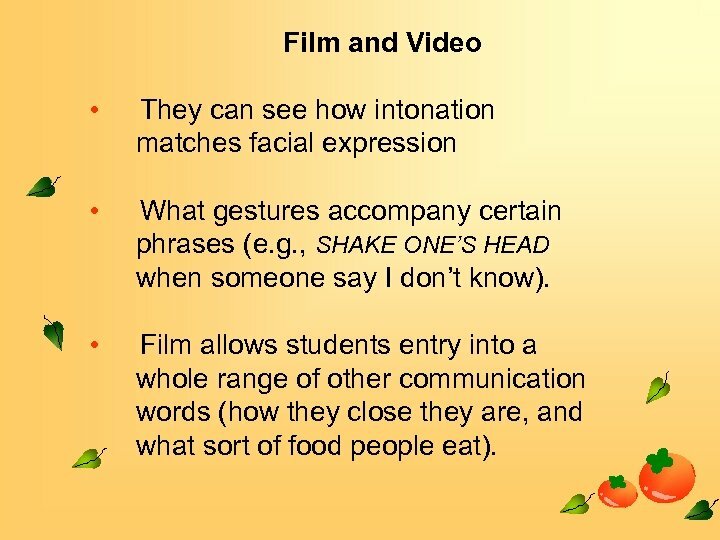 Film and Video • They can see how intonation matches facial expression • What gestures accompany certain phrases (e. g. , SHAKE ONE’S HEAD when someone say I don’t know). 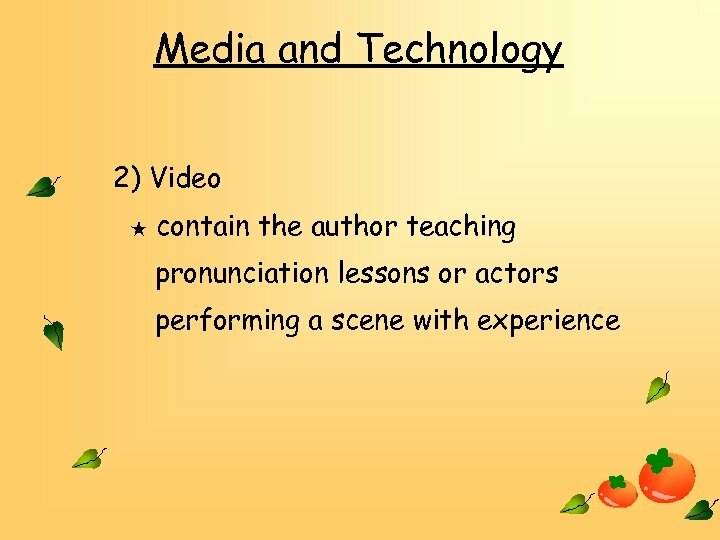 • Film allows students entry into a whole range of other communication words (how they close they are, and what sort of food people eat). Reluctant students • Helping the student who is reluctant to speak in front of other students, they might be shy, and not predisposed to expressing themselves in front of other people. 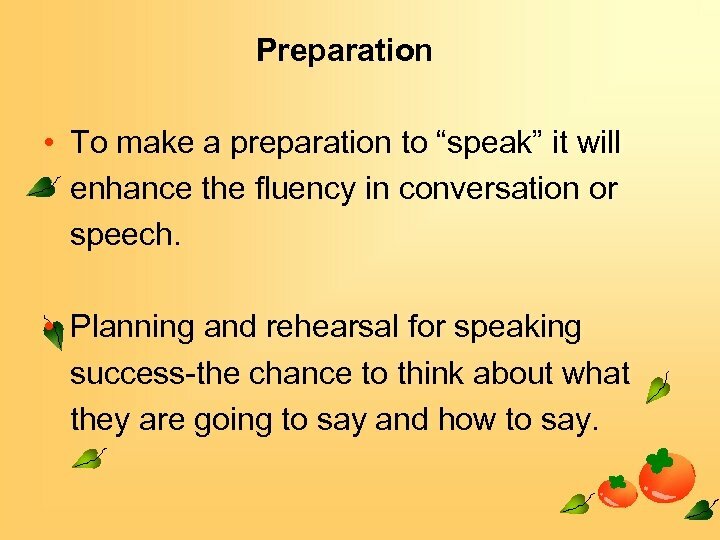 Preparation • To make a preparation to “speak” it will enhance the fluency in conversation or speech. 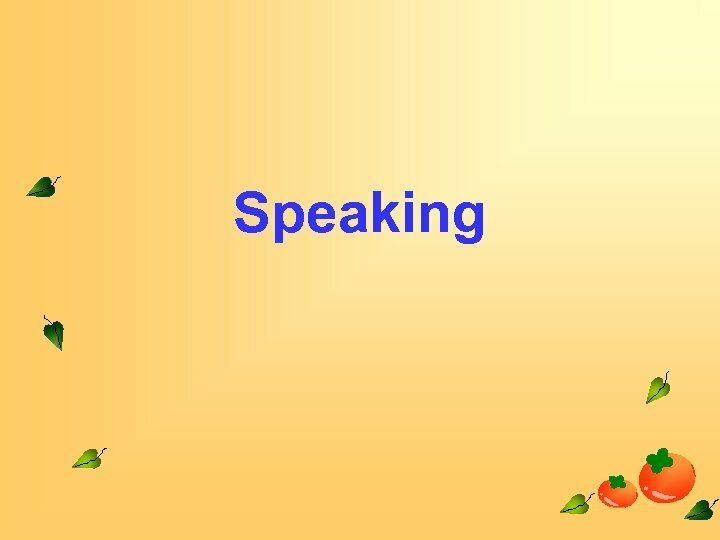 • Planning and rehearsal for speaking success-the chance to think about what they are going to say and how to say. 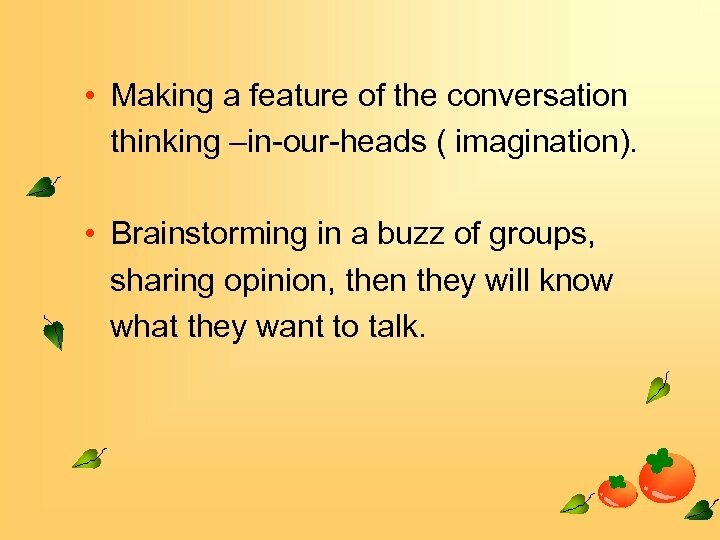 • Making a feature of the conversation thinking –in-our-heads ( imagination). 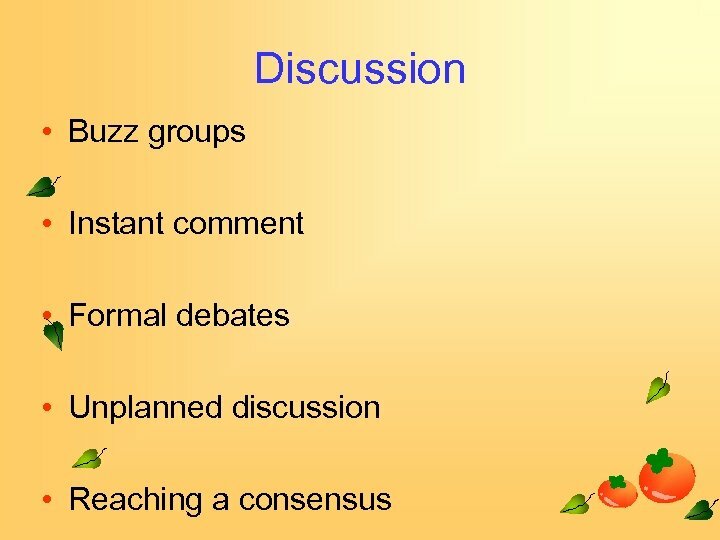 • Brainstorming in a buzz of groups, sharing opinion, then they will know what they want to talk. 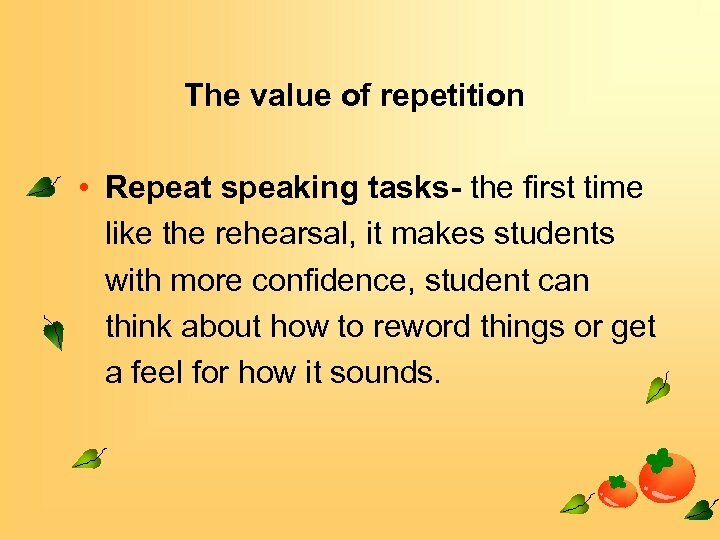 The value of repetition • Repeat speaking tasks- the first time like the rehearsal, it makes students with more confidence, student can think about how to reword things or get a feel for how it sounds. 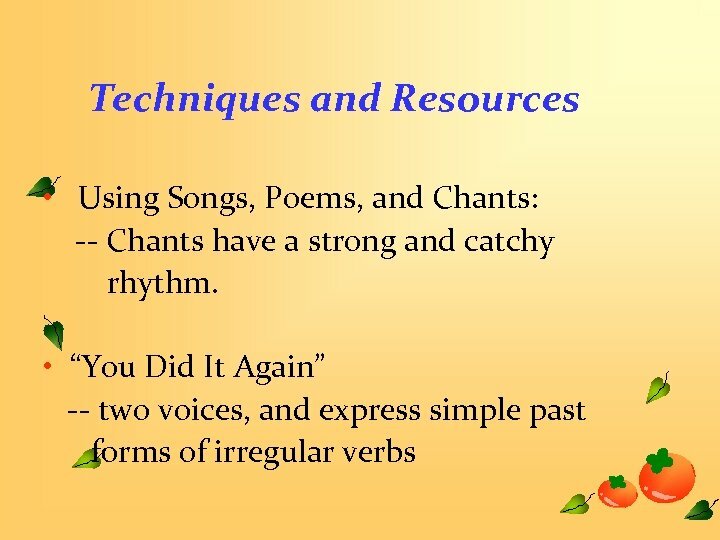 • Students get a chance to analysis what they have done if the repetition works even better. 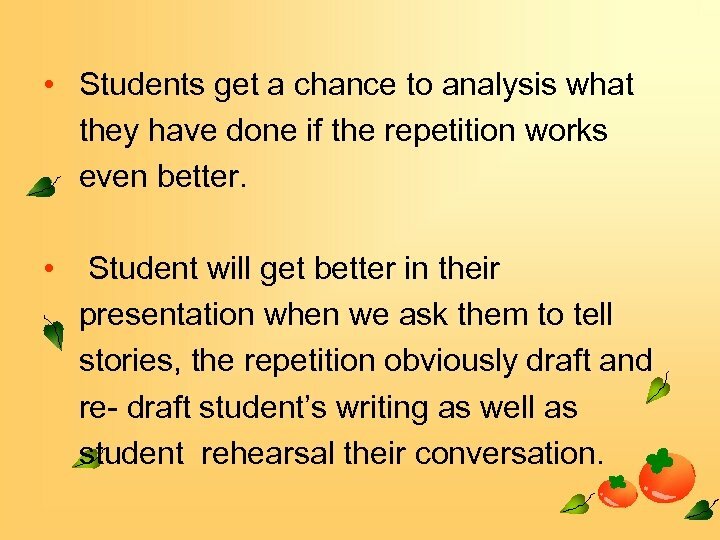 • Student will get better in their presentation when we ask them to tell stories, the repetition obviously draft and re- draft student’s writing as well as student rehearsal their conversation. 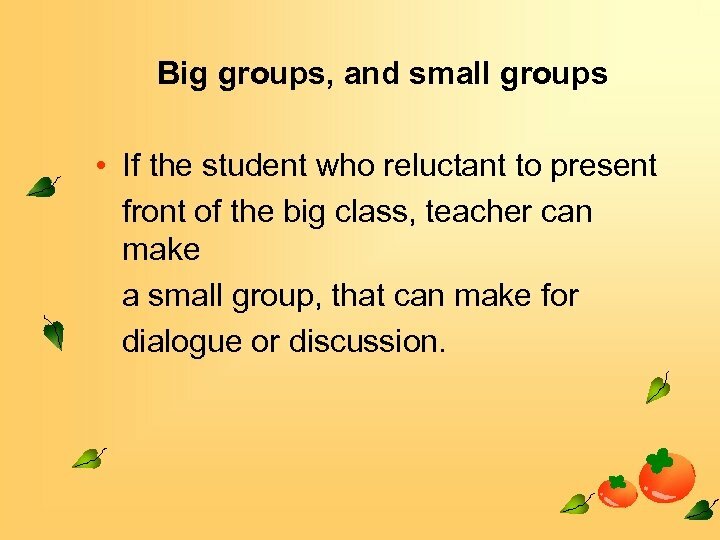 Big groups, and small groups • If the student who reluctant to present front of the big class, teacher can make a small group, that can make for dialogue or discussion. 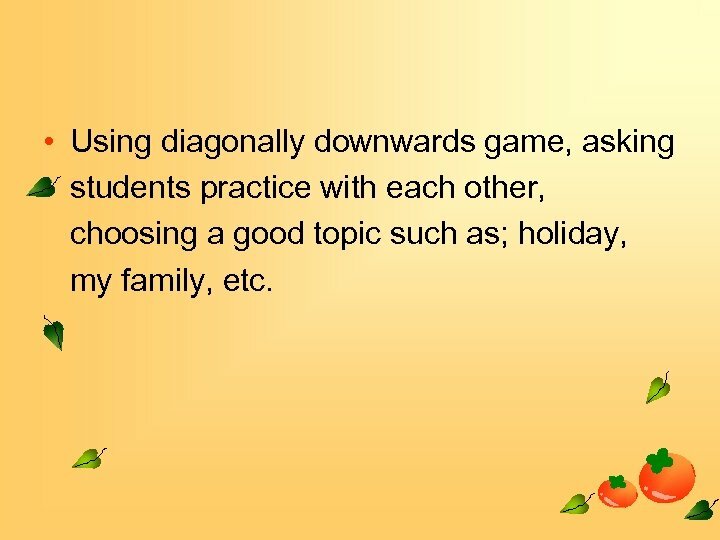 • Using diagonally downwards game, asking students practice with each other, choosing a good topic such as; holiday, my family, etc. 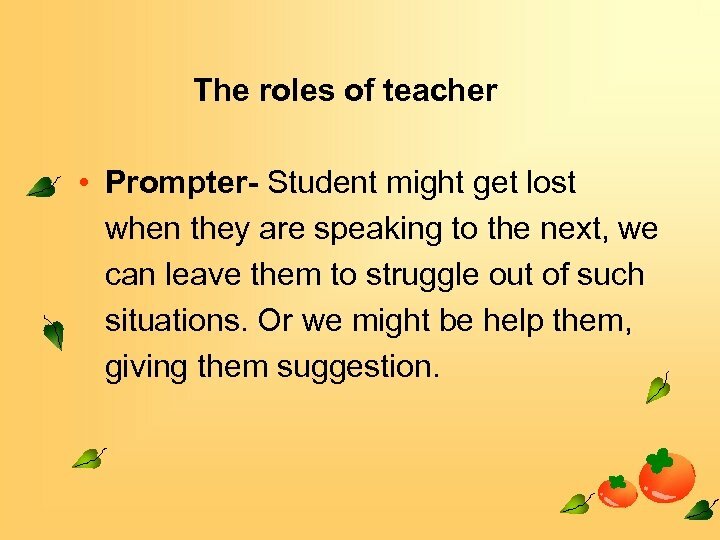 The roles of teacher • Prompter- Student might get lost when they are speaking to the next, we can leave them to struggle out of such situations. Or we might be help them, giving them suggestion. 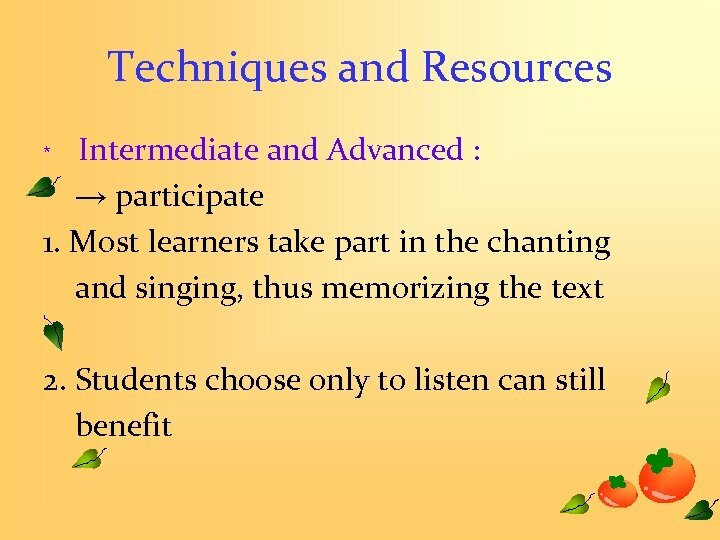 • Participant- Just at right time, not involve too much. 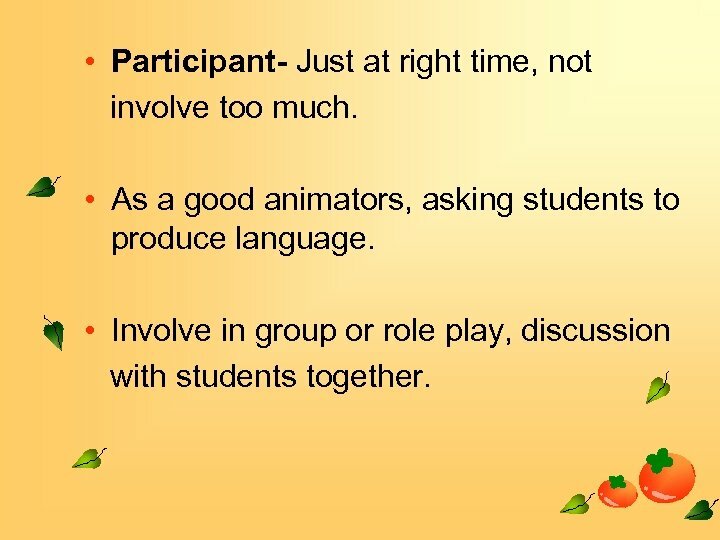 • As a good animators, asking students to produce language. 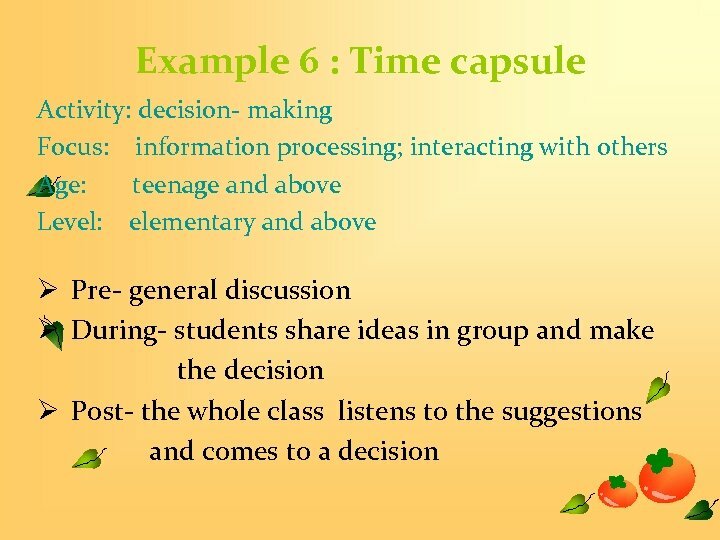 • Involve in group or role play, discussion with students together. • Introduce new information to help the activity running. 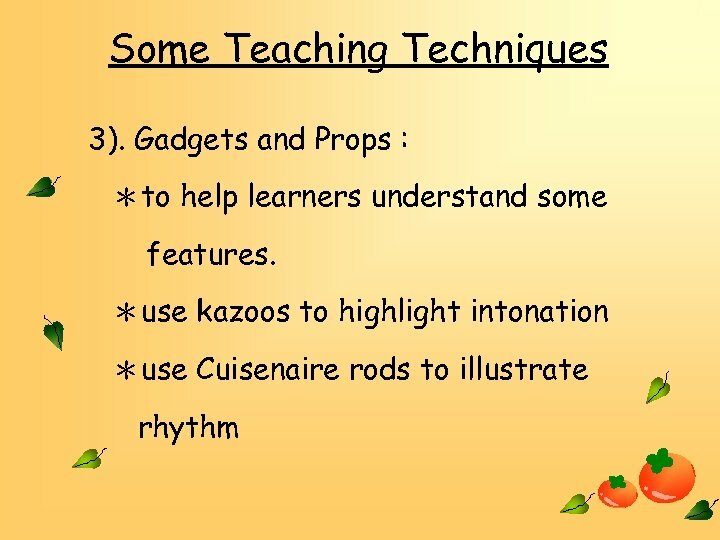 • Ensure student engagement and generally maintain a creative atmosphere. • Dominating the speaking to themselves. 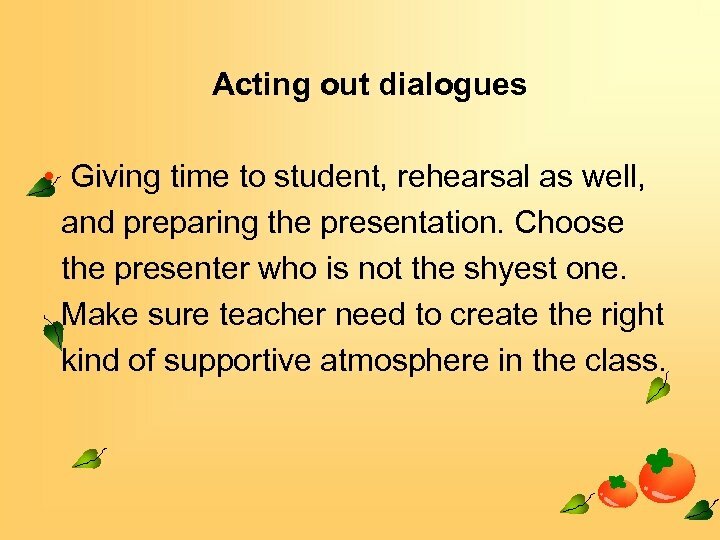 • Teachers may in direct conversation with their students- one to one. 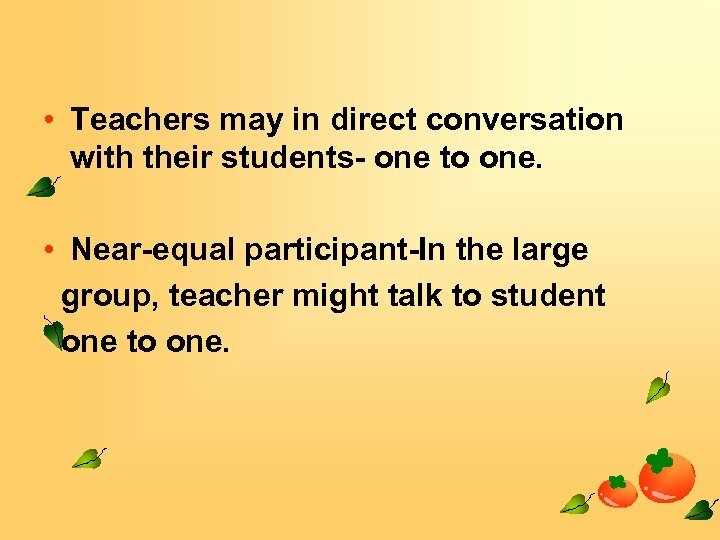 • Near-equal participant-In the large group, teacher might talk to student one to one. 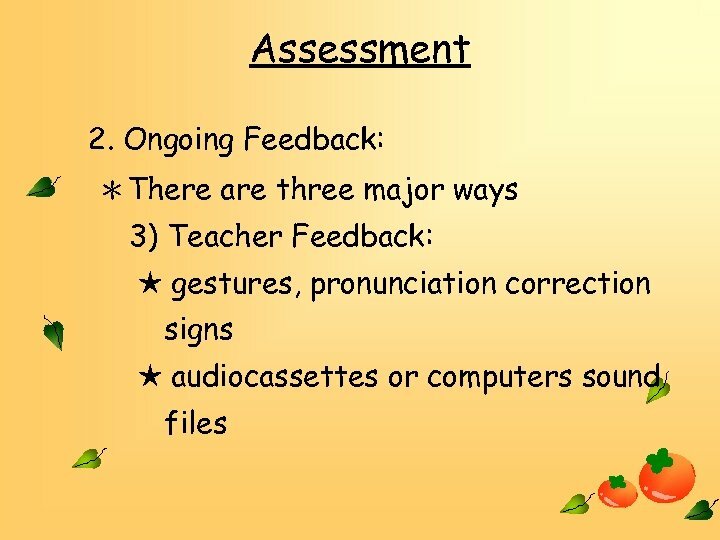 Feedback provider • Helpful and gentle correction get students out of difficult misunderstanding and hesitations. 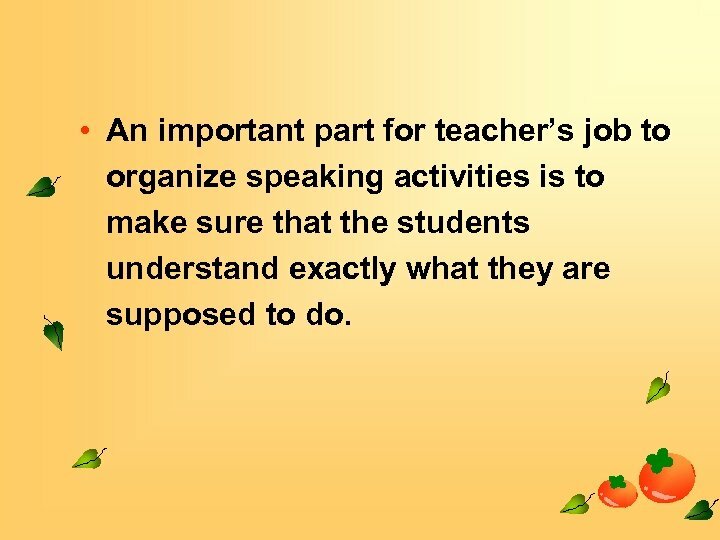 • An important part for teacher’s job to organize speaking activities is to make sure that the students understand exactly what they are supposed to do. 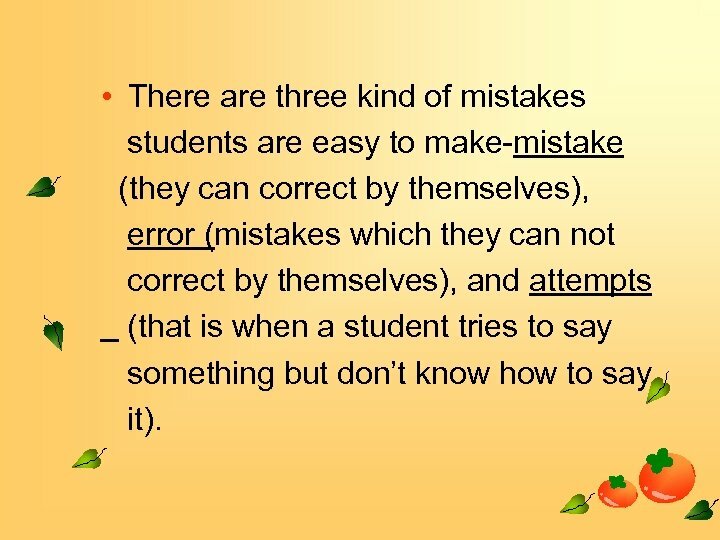 • There are three kind of mistakes students are easy to make-mistake (they can correct by themselves), error (mistakes which they can not correct by themselves), and attempts (that is when a student tries to say something but don’t know how to say it). 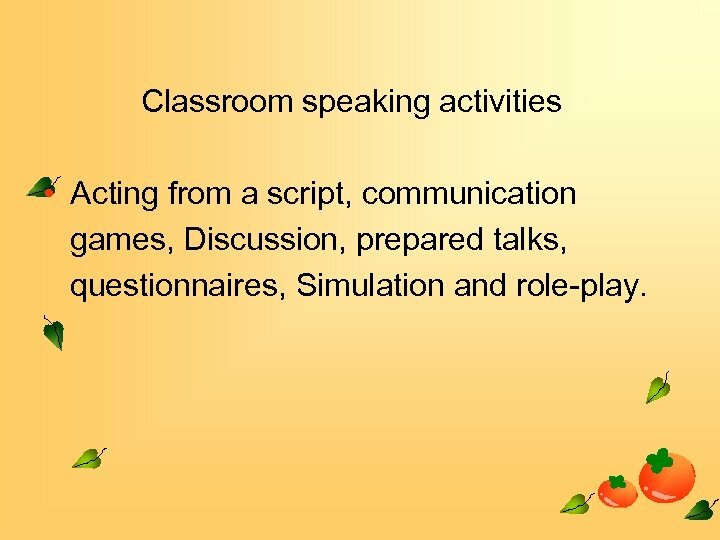 Classroom speaking activities • Acting from a script, communication games, Discussion, prepared talks, questionnaires, Simulation and role-play. 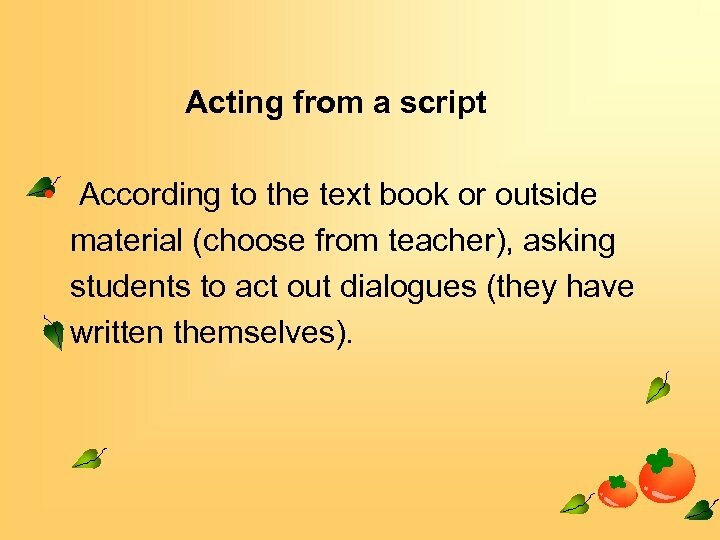 Acting from a script • According to the text book or outside material (choose from teacher), asking students to act out dialogues (they have written themselves). 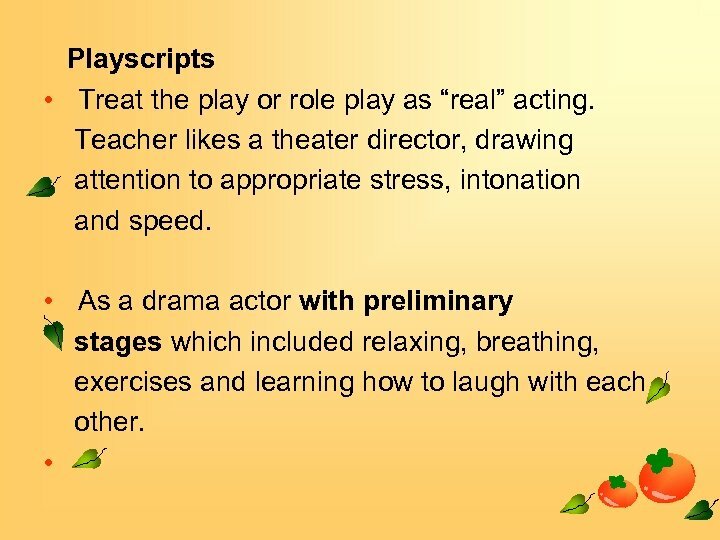 • With intermediate stage they worked as emotion, action, gesture and how to show crying and laughing. 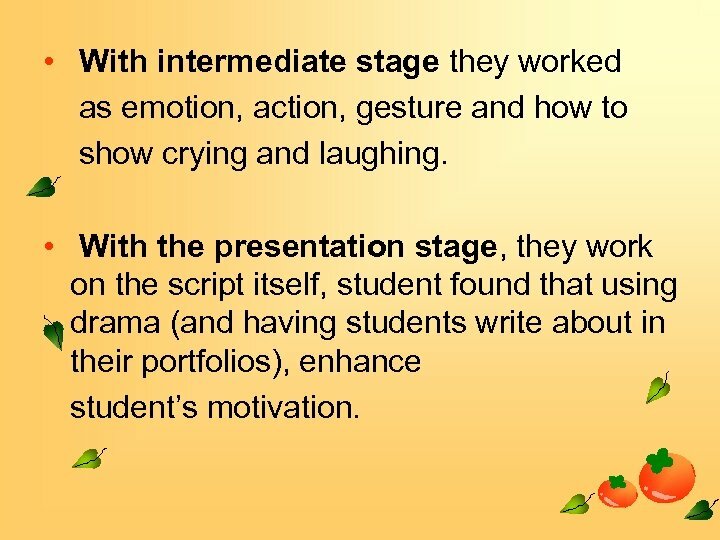 • With the presentation stage, they work on the script itself, student found that using drama (and having students write about in their portfolios), enhance student’s motivation. 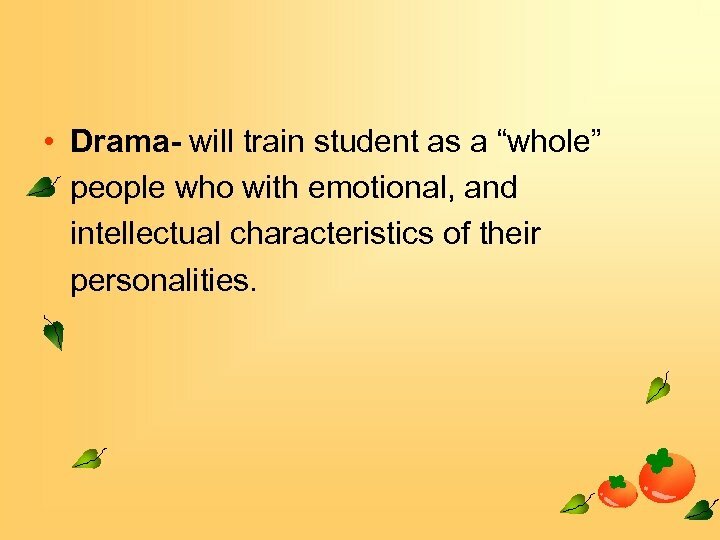 • Drama- will train student as a “whole” people who with emotional, and intellectual characteristics of their personalities. 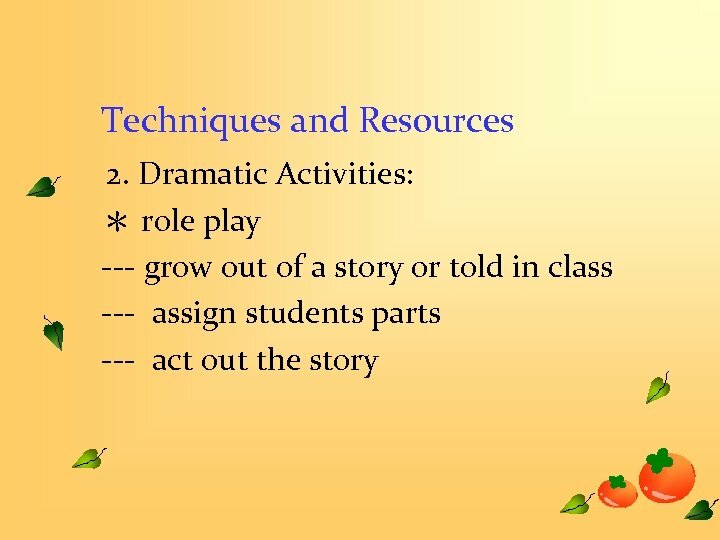 Acting out dialogues • Giving time to student, rehearsal as well, and preparing the presentation. Choose the presenter who is not the shyest one. Make sure teacher need to create the right kind of supportive atmosphere in the class. 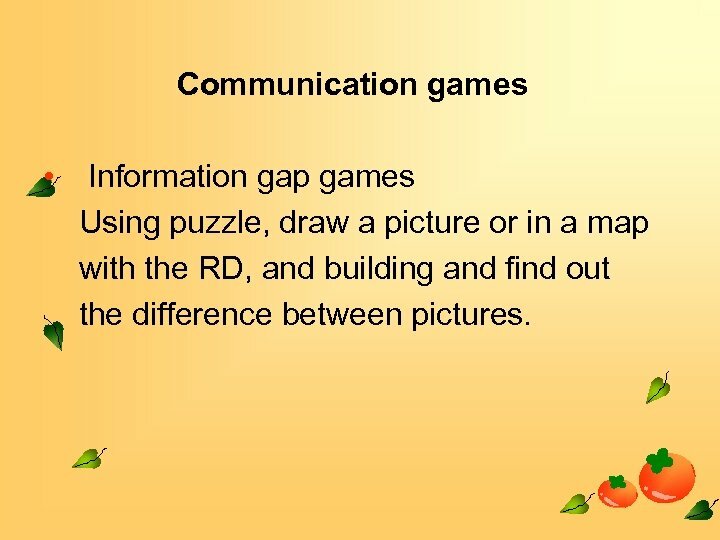 Communication games • Information gap games Using puzzle, draw a picture or in a map with the RD, and building and find out the difference between pictures. 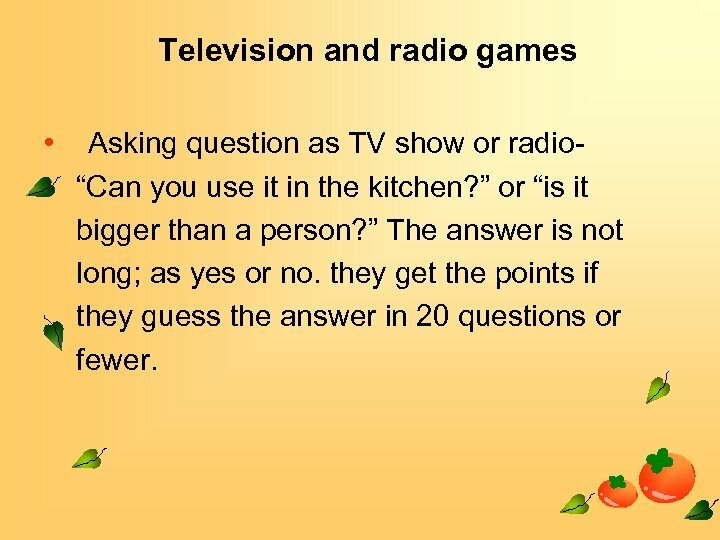 Television and radio games • Asking question as TV show or radio“Can you use it in the kitchen? ” or “is it bigger than a person? ” The answer is not long; as yes or no. they get the points if they guess the answer in 20 questions or fewer. Example 4: Whose line is it anyway? 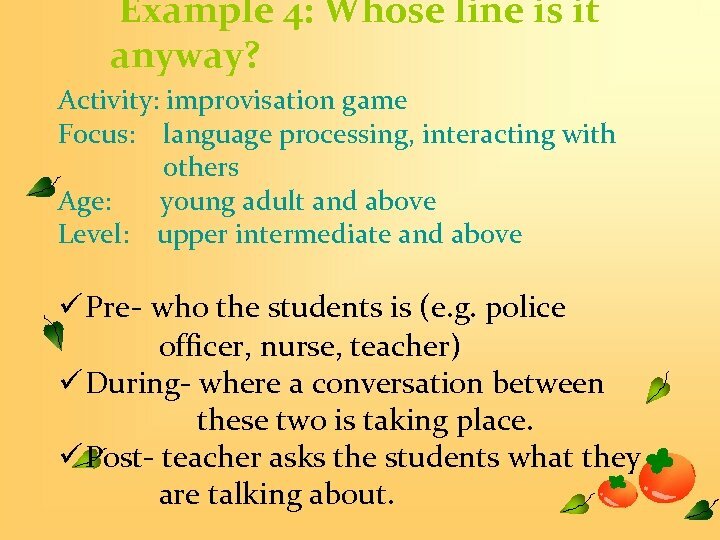 Activity: improvisation game Focus: language processing, interacting with others Age: young adult and above Level: upper intermediate and above ü Pre- who the students is (e. g. police officer, nurse, teacher) ü During- where a conversation between these two is taking place. ü Post- teacher asks the students what they are talking about. 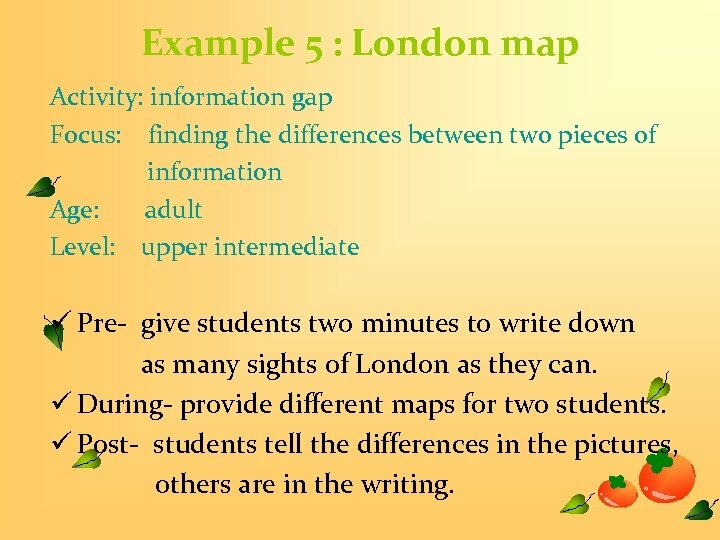 Example 5 : London map Activity: information gap Focus: finding the differences between two pieces of information Age: adult Level: upper intermediate ü Pre- give students two minutes to write down as many sights of London as they can. ü During- provide different maps for two students. ü Post- students tell the differences in the pictures, others are in the writing. 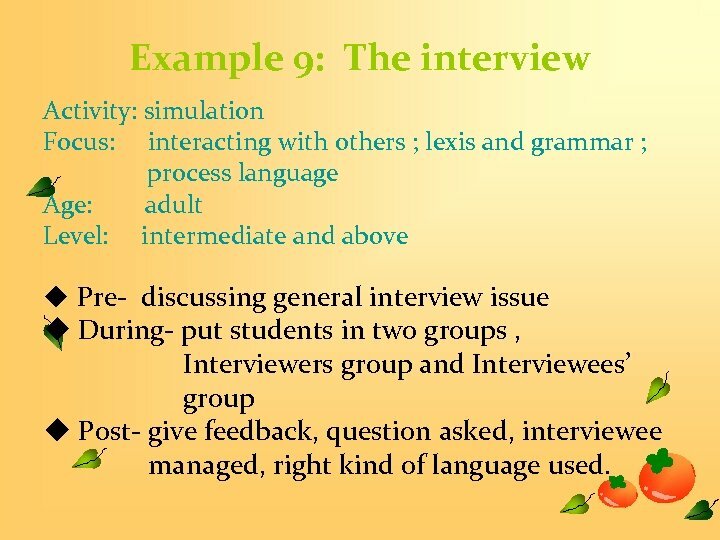 Example 9: The interview Activity: simulation Focus: interacting with others ; lexis and grammar ; process language Age: adult Level: intermediate and above u Pre- discussing general interview issue u During- put students in two groups , Interviewers group and Interviewees’ group u Post- give feedback, question asked, interviewee managed, right kind of language used. 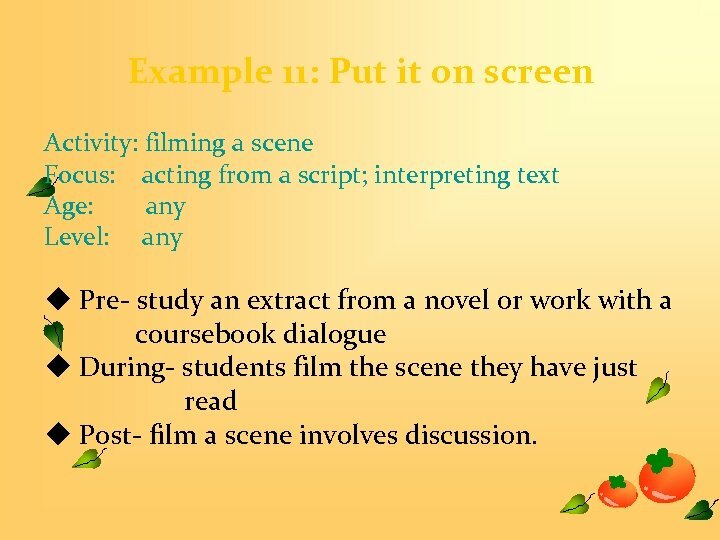 Example 11: Put it on screen Activity: filming a scene Focus: acting from a script; interpreting text Age: any Level: any u Pre- study an extract from a novel or work with a coursebook dialogue u During- students film the scene they have just read u Post- film a scene involves discussion. 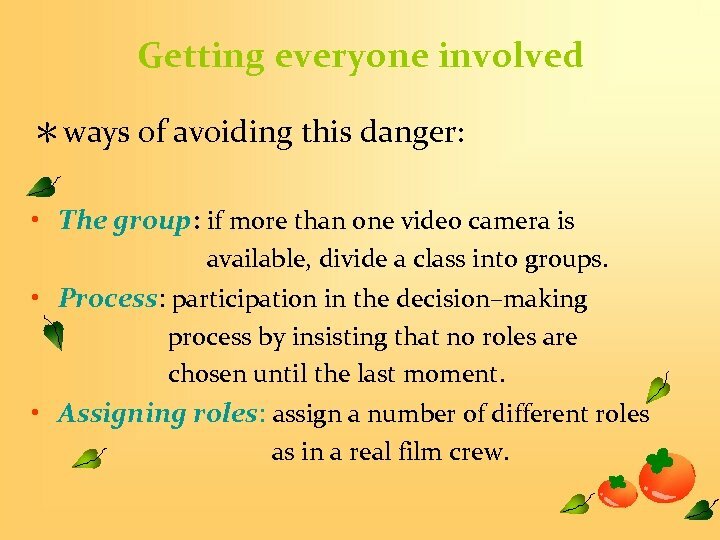 Getting everyone involved ＊ways of avoiding this danger: • The group: if more than one video camera is available, divide a class into groups. • Process: participation in the decision–making process by insisting that no roles are chosen until the last moment. 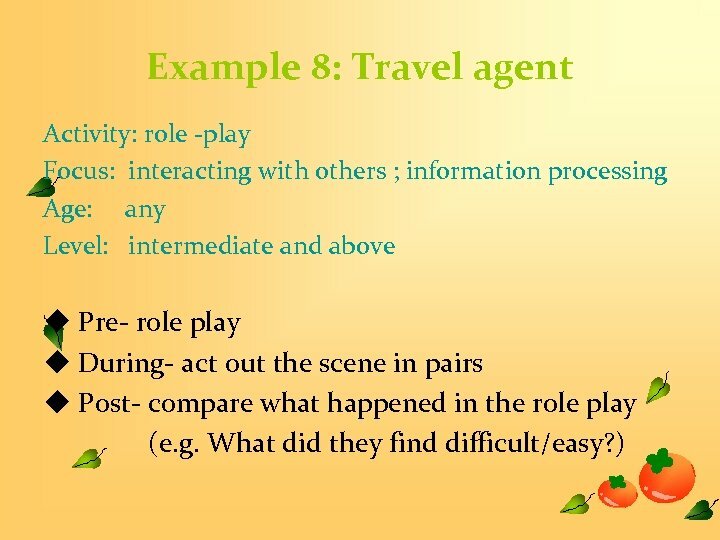 • Assigning roles: assign a number of different roles as in a real film crew.